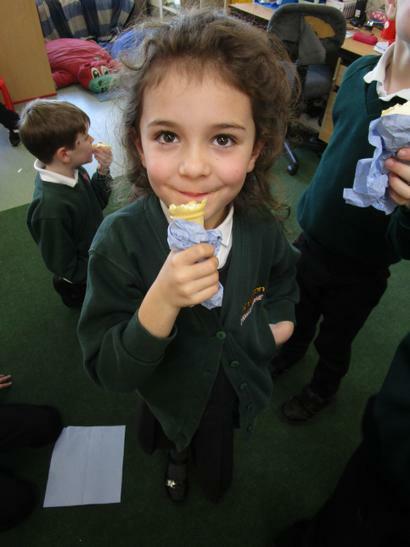 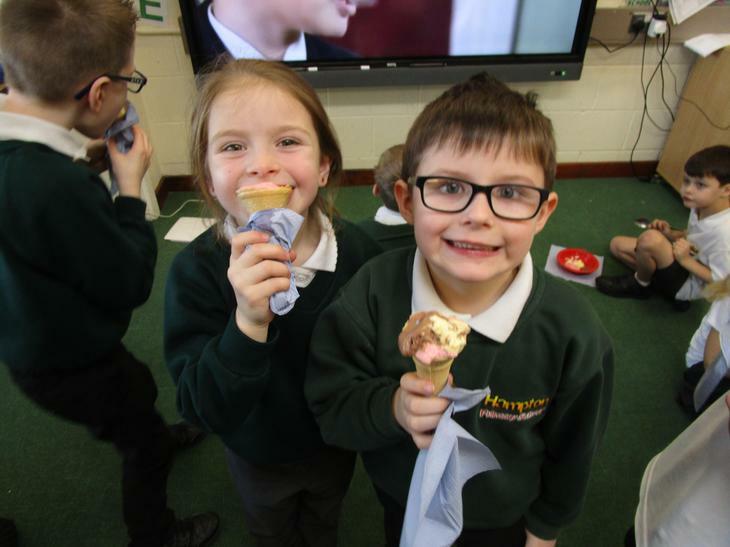 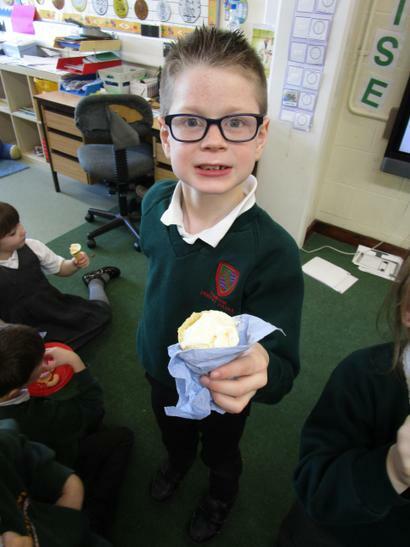 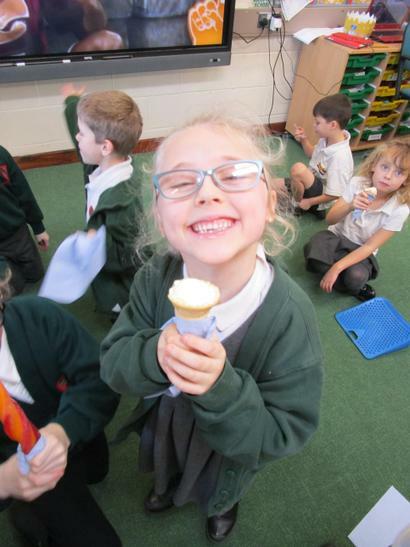 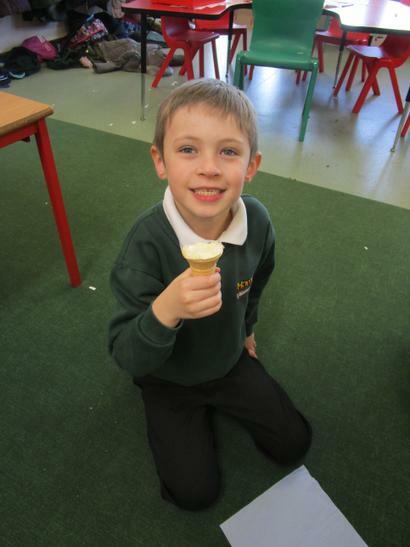 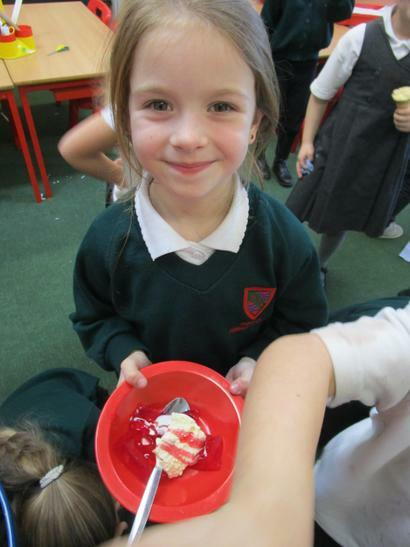 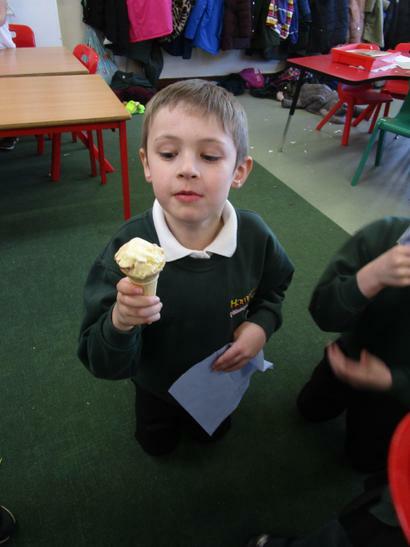 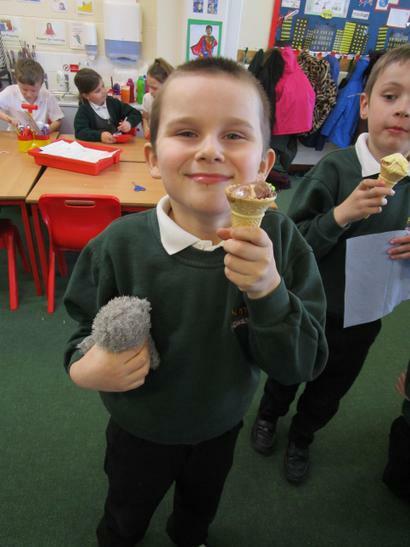 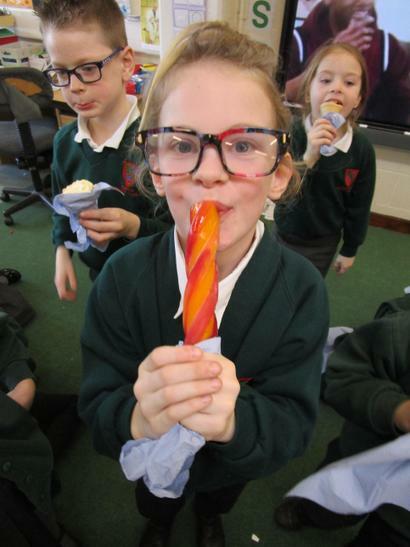 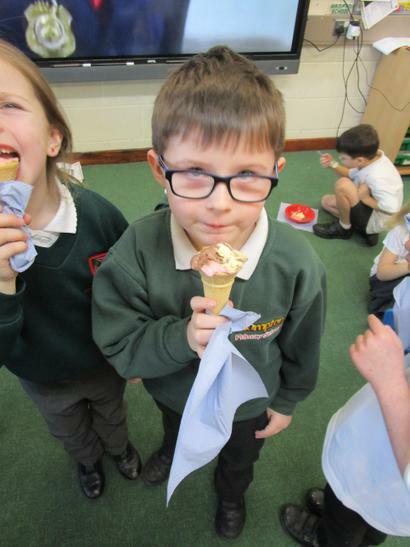 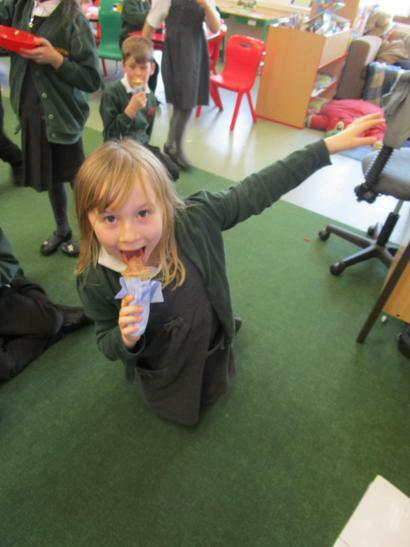 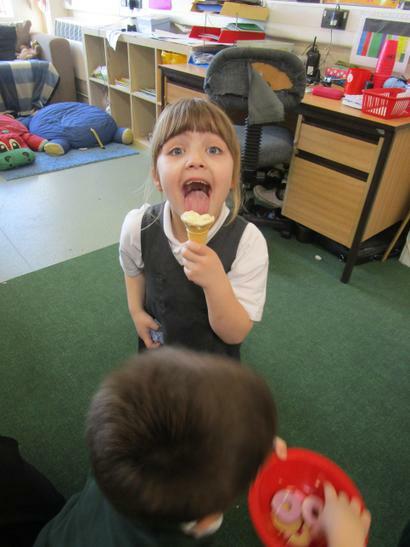 Ice Cream Party End of Term 3! 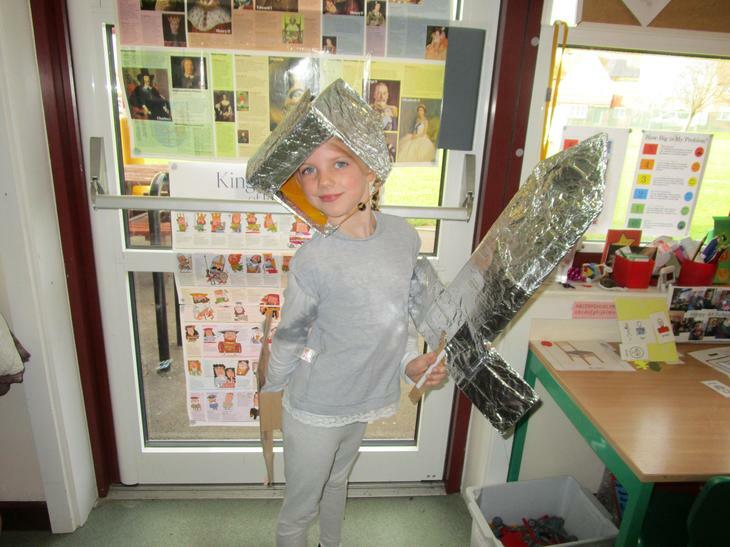 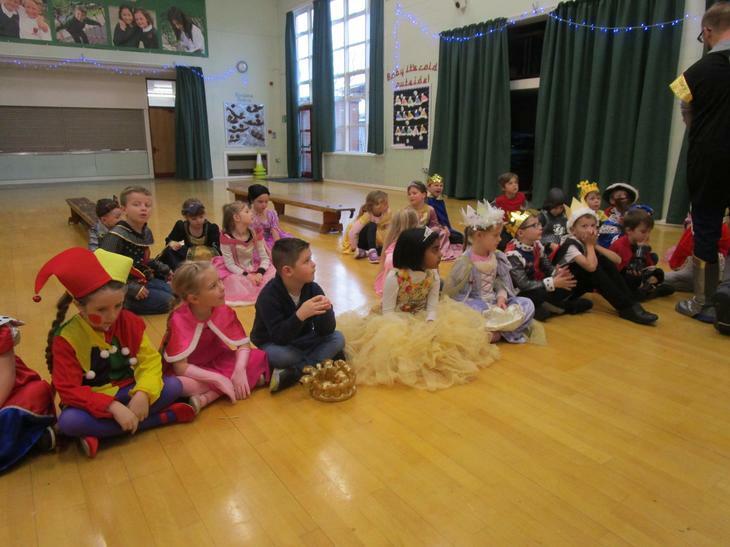 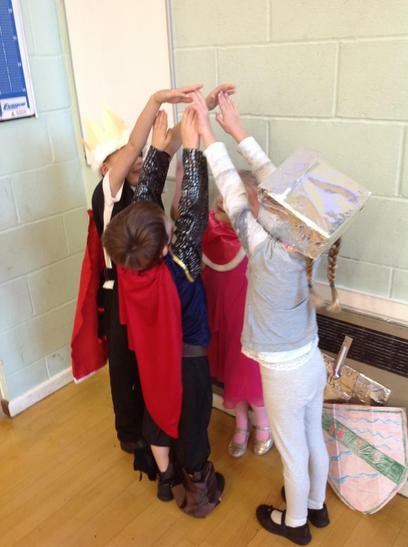 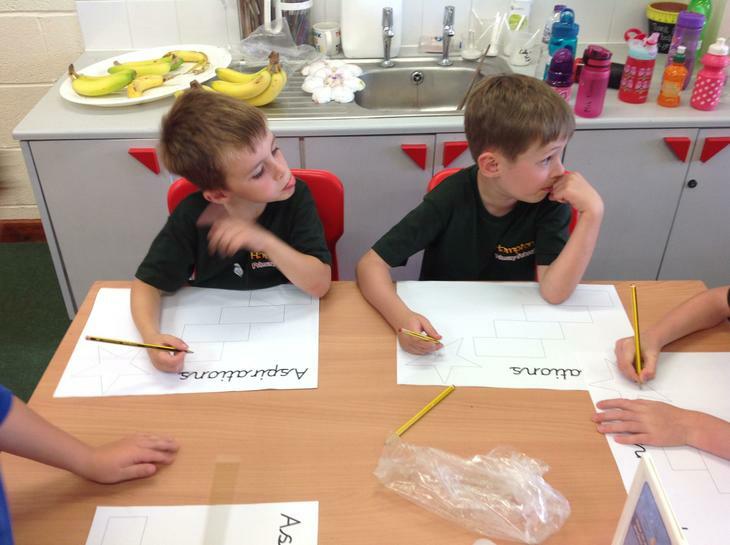 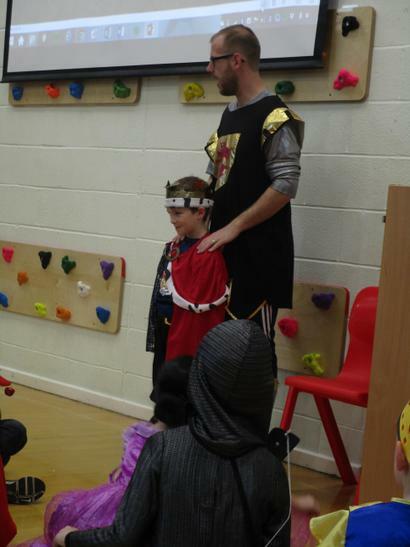 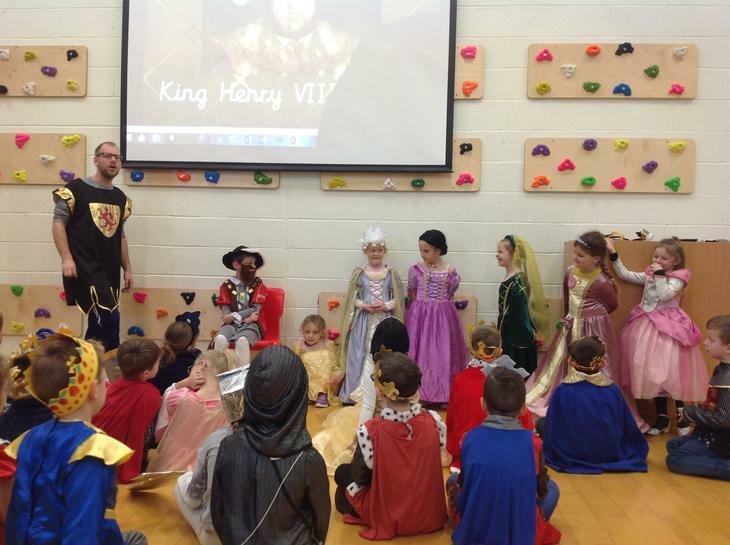 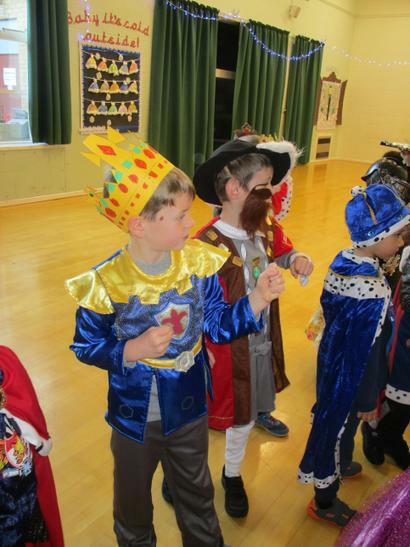 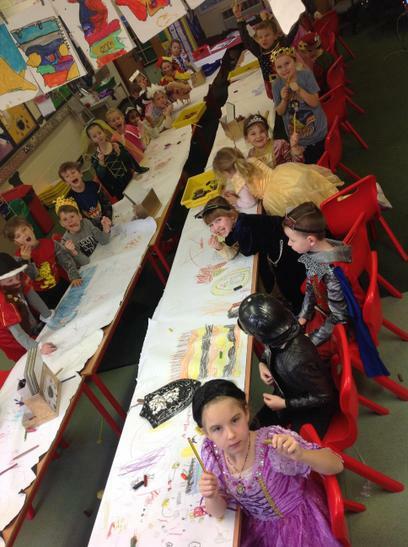 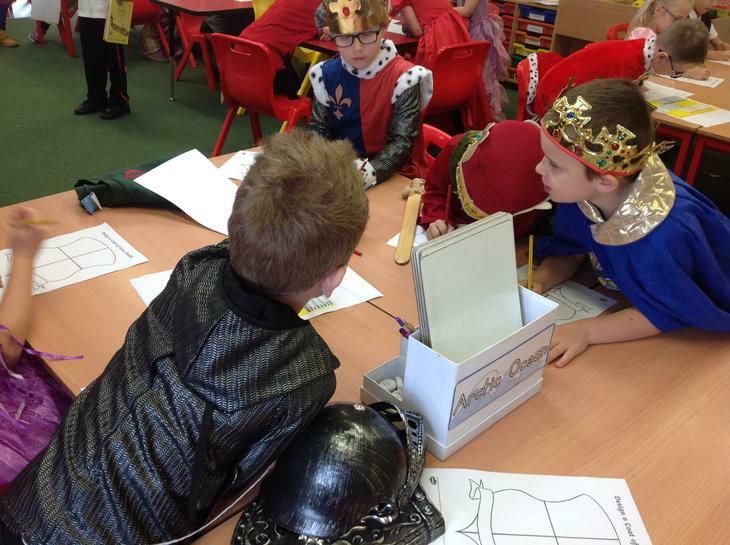 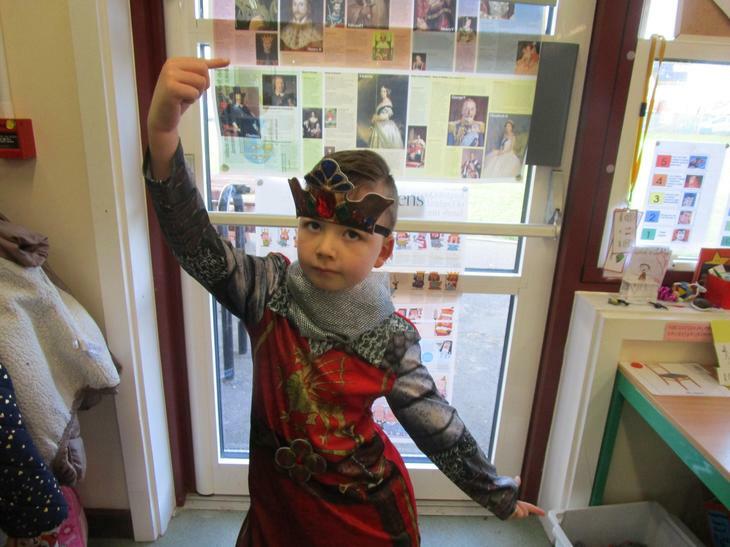 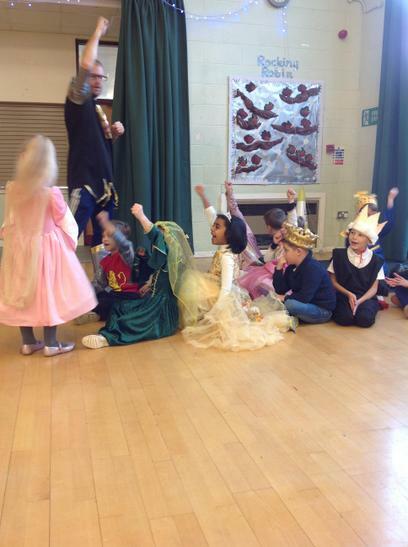 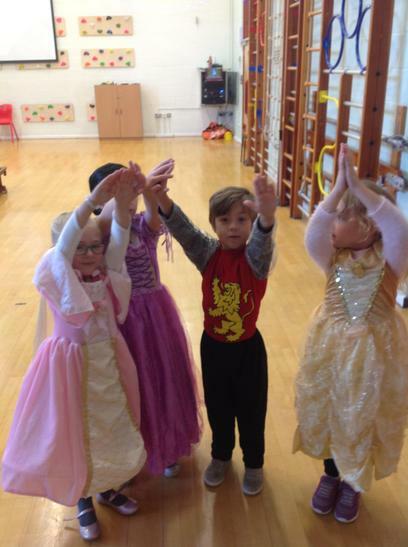 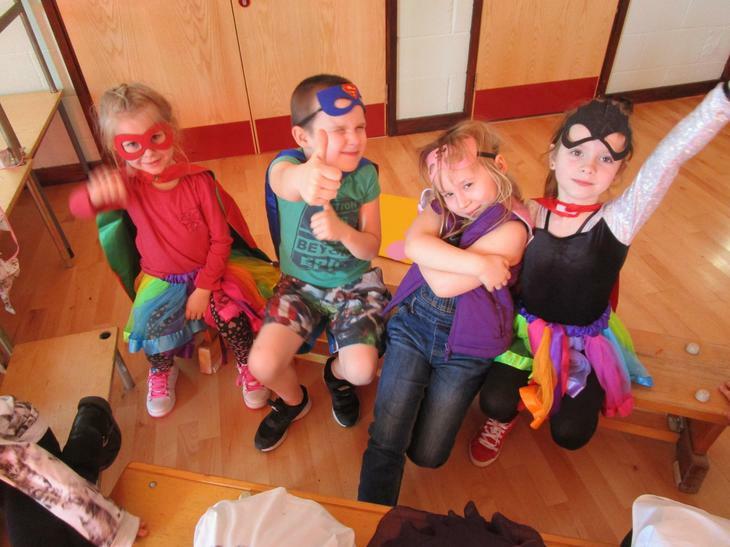 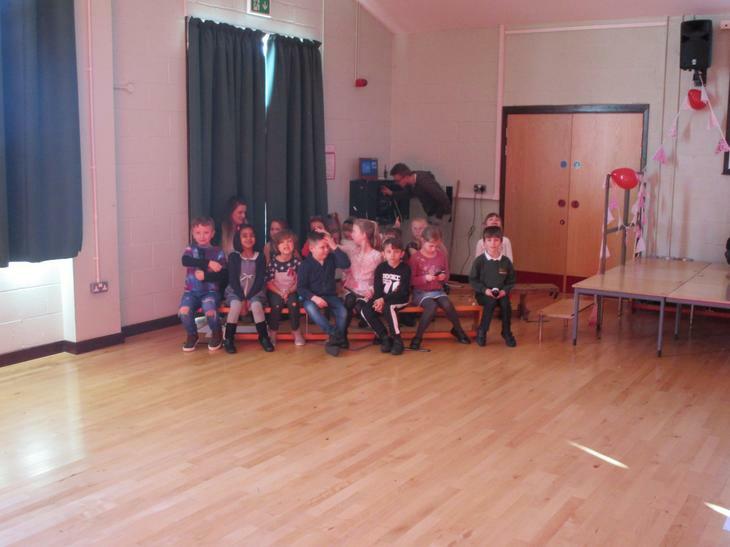 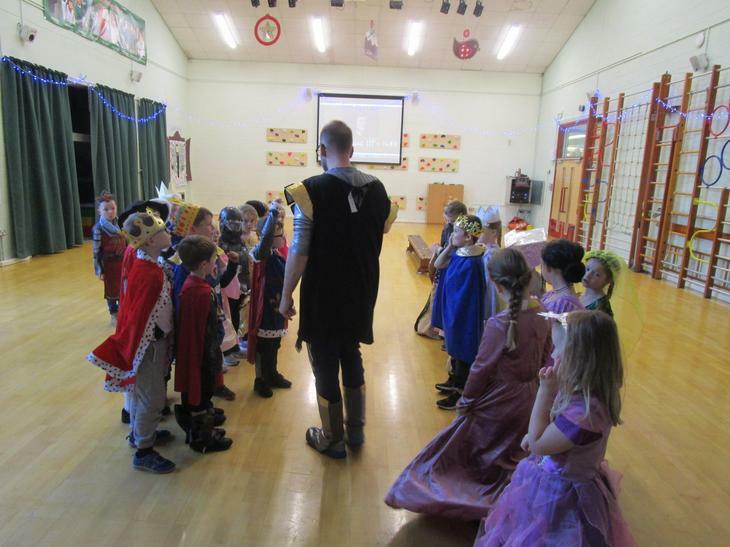 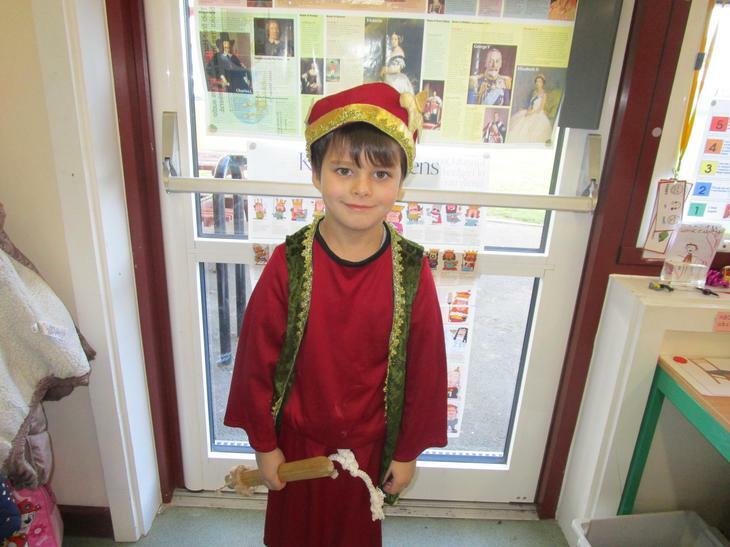 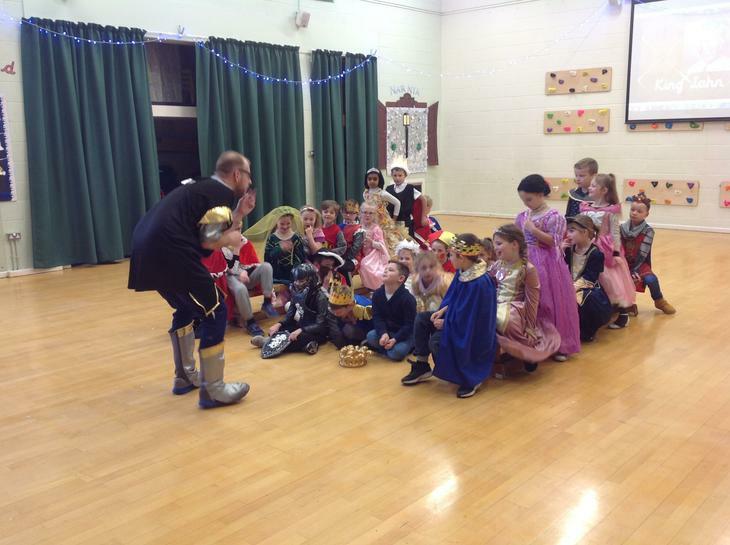 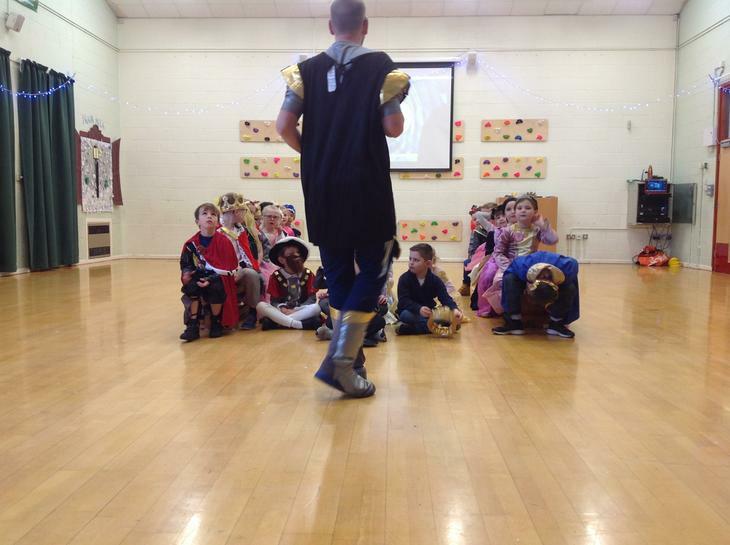 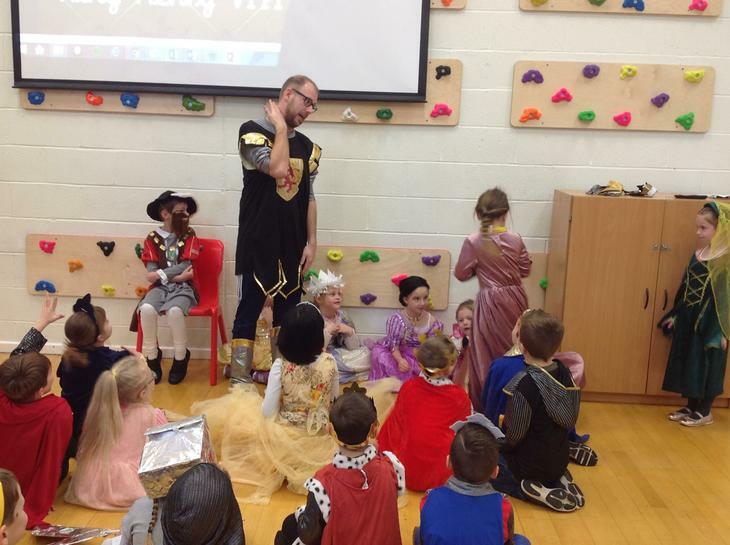 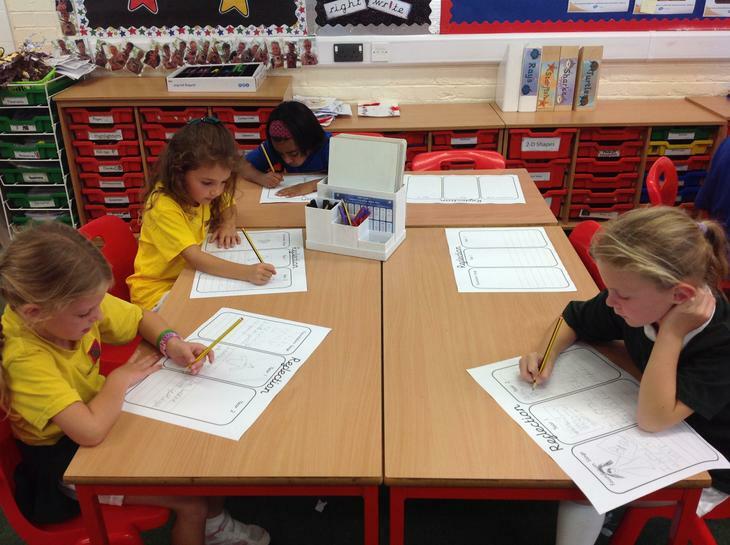 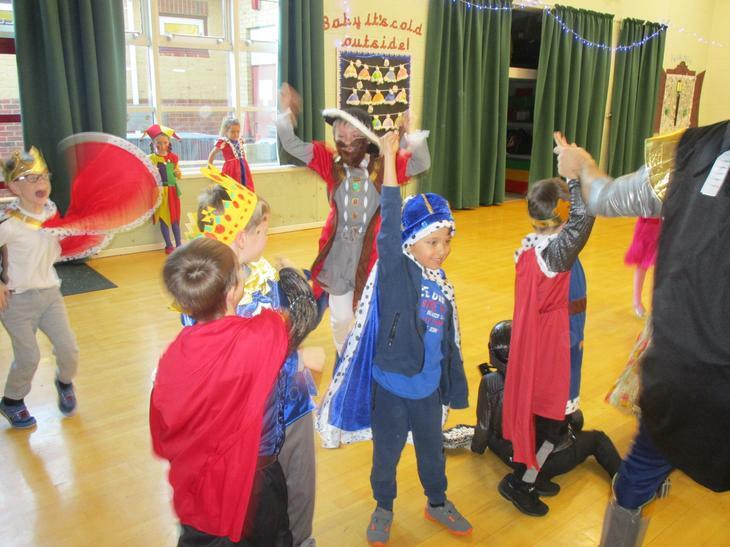 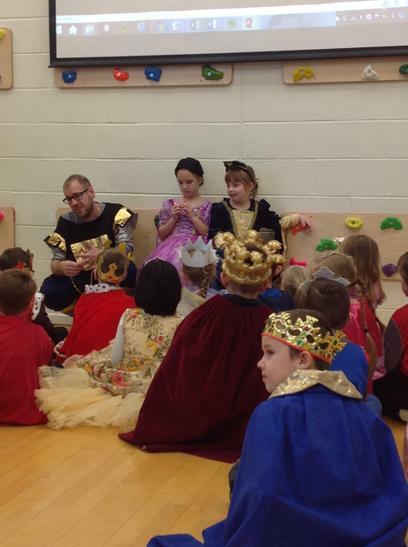 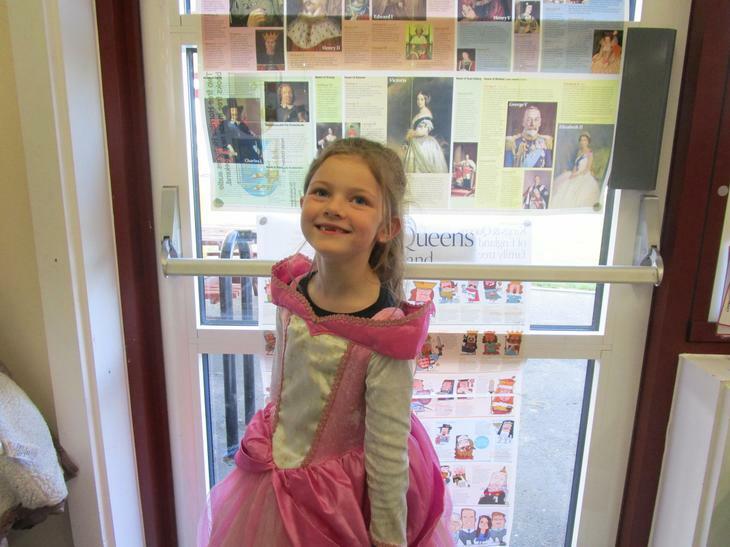 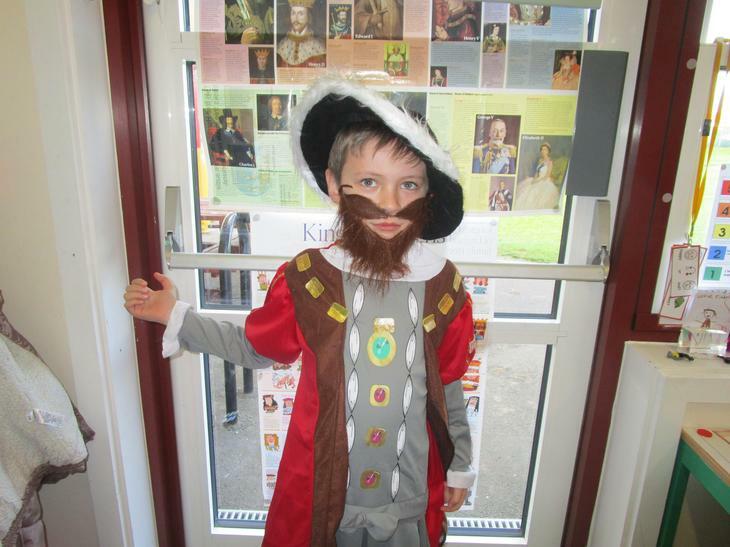 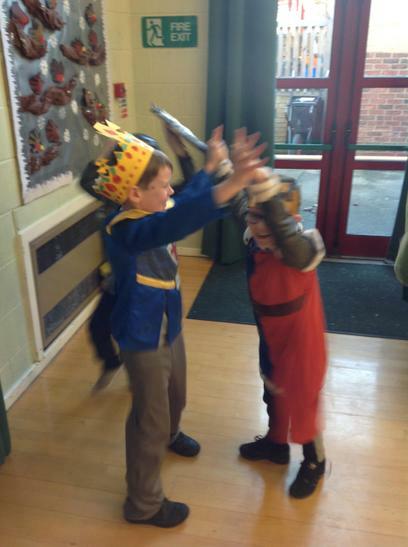 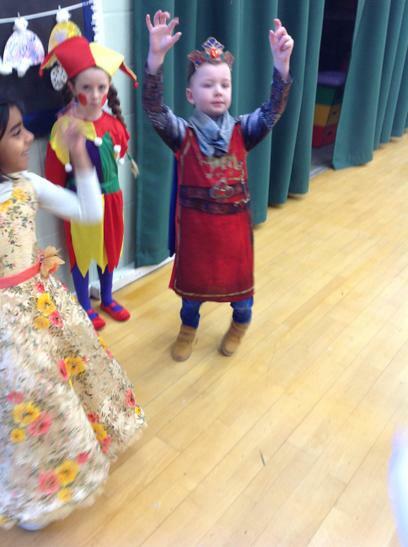 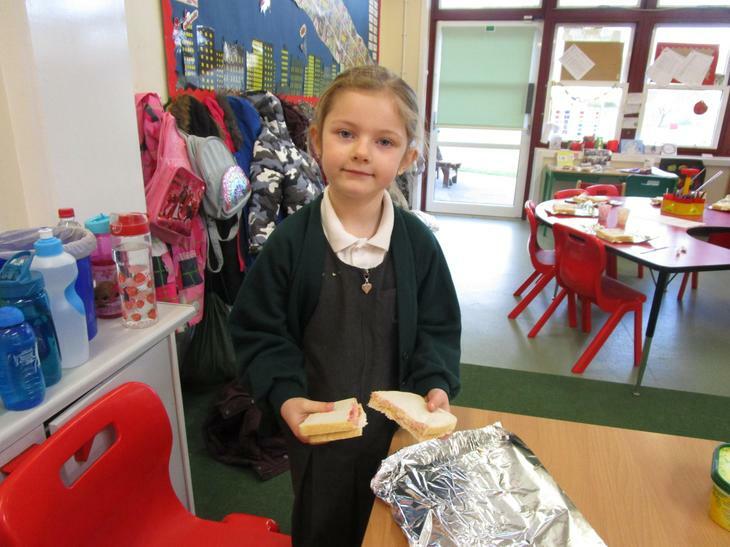 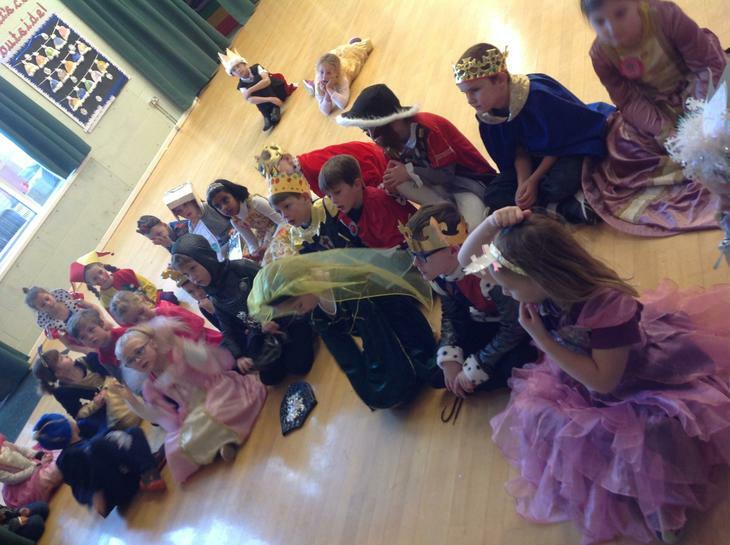 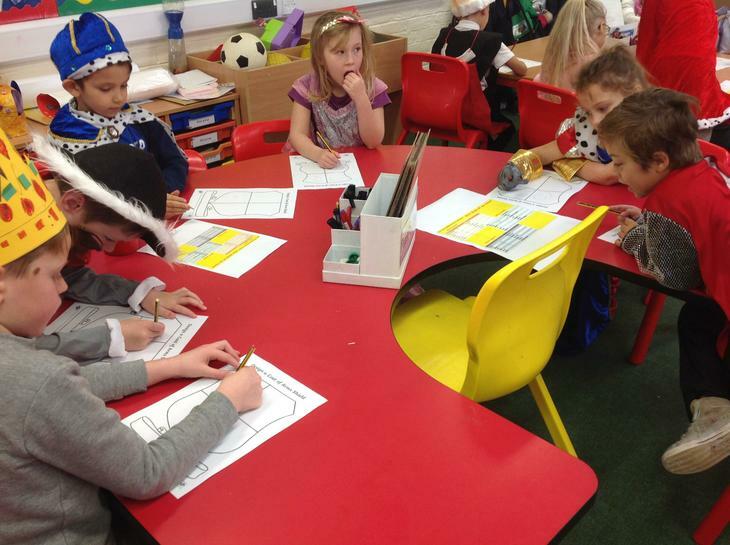 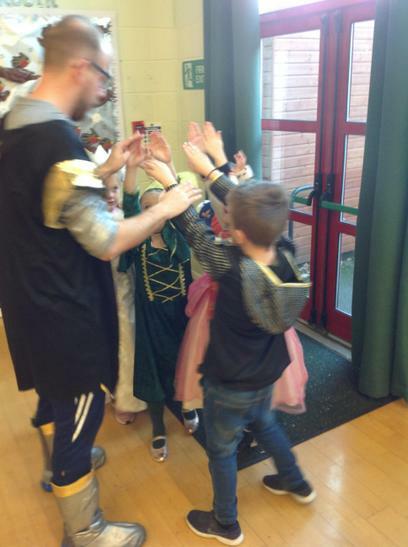 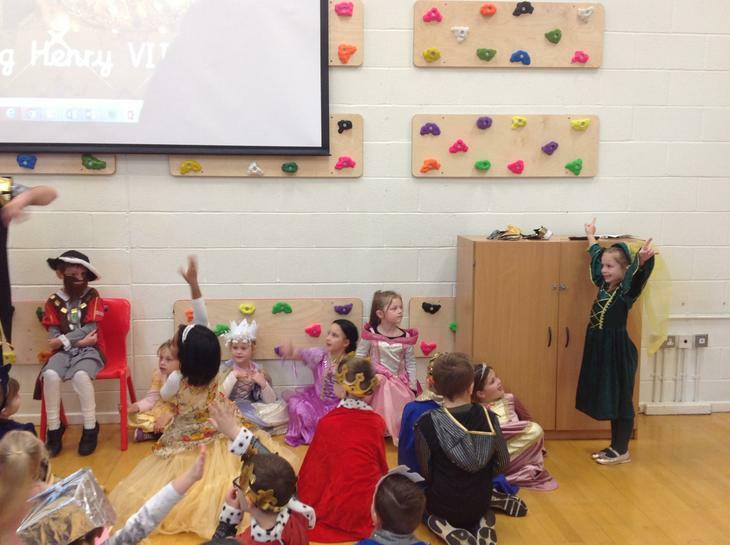 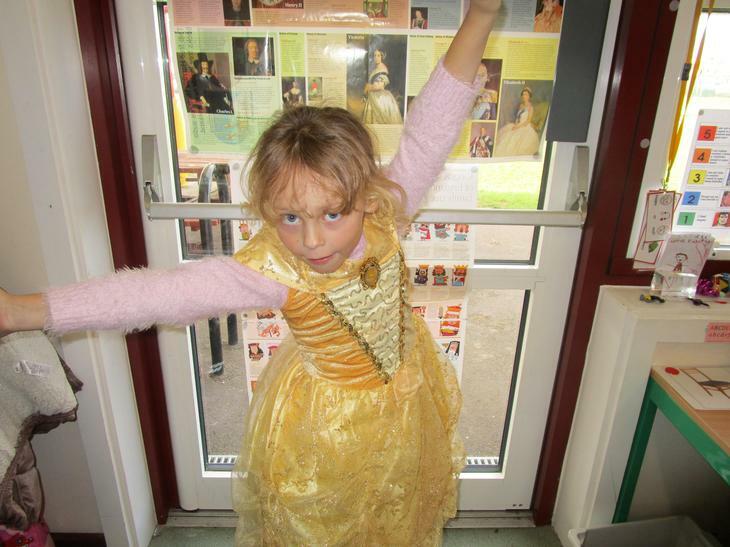 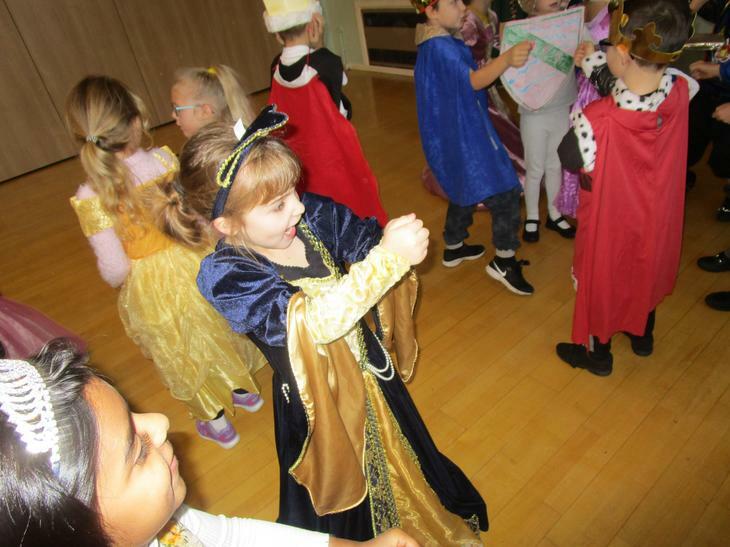 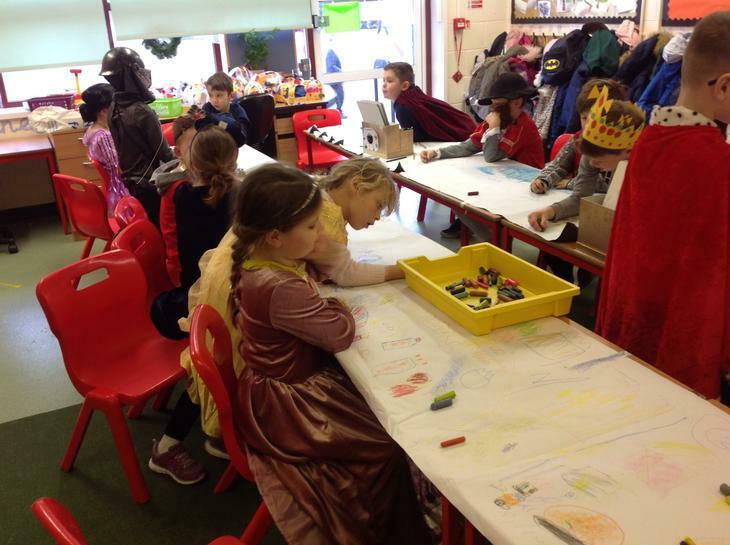 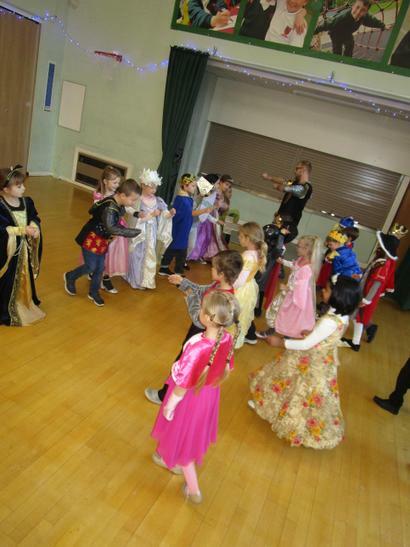 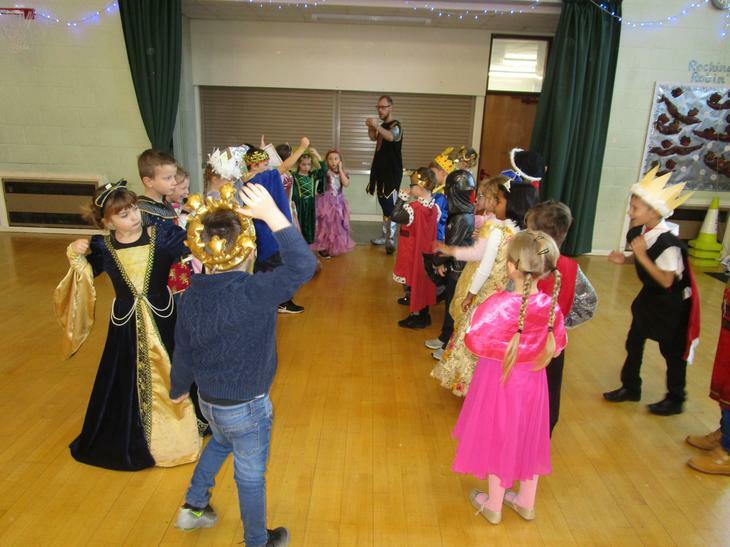 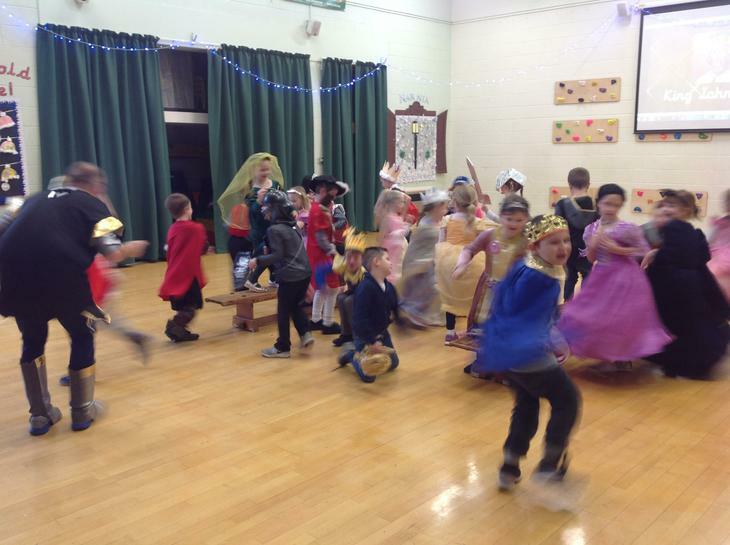 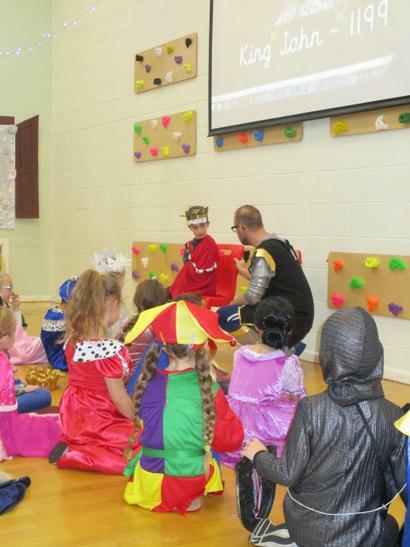 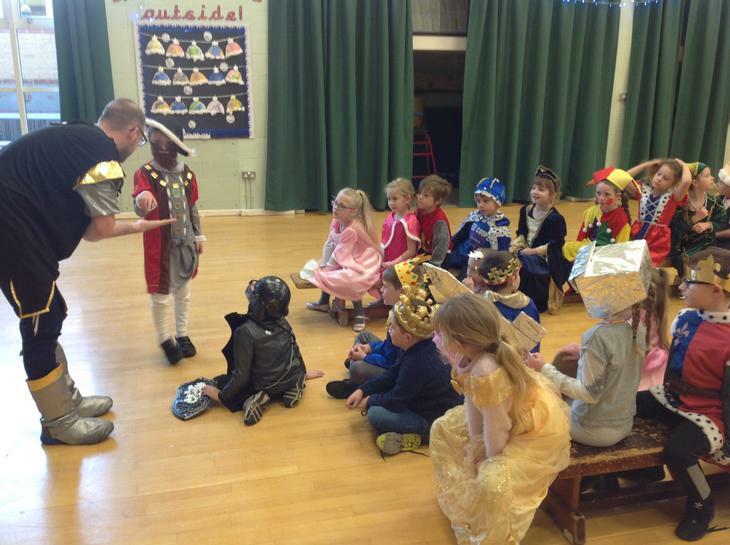 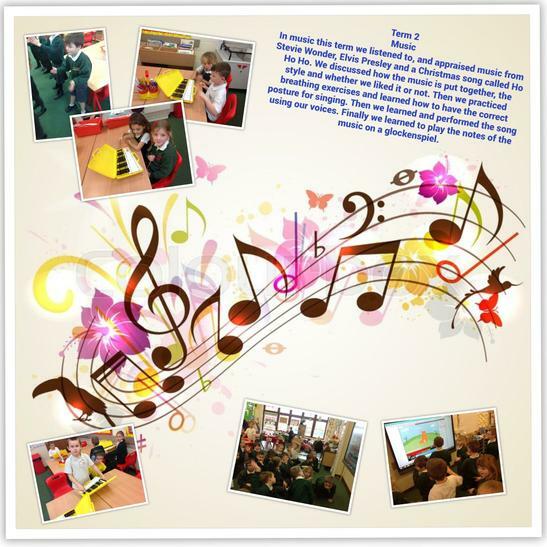 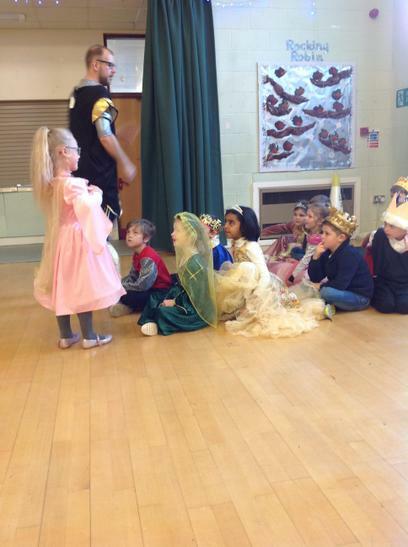 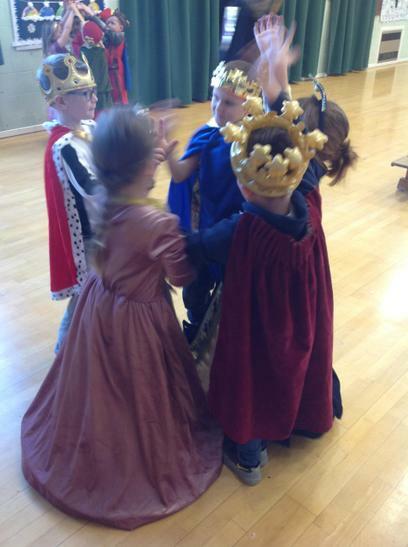 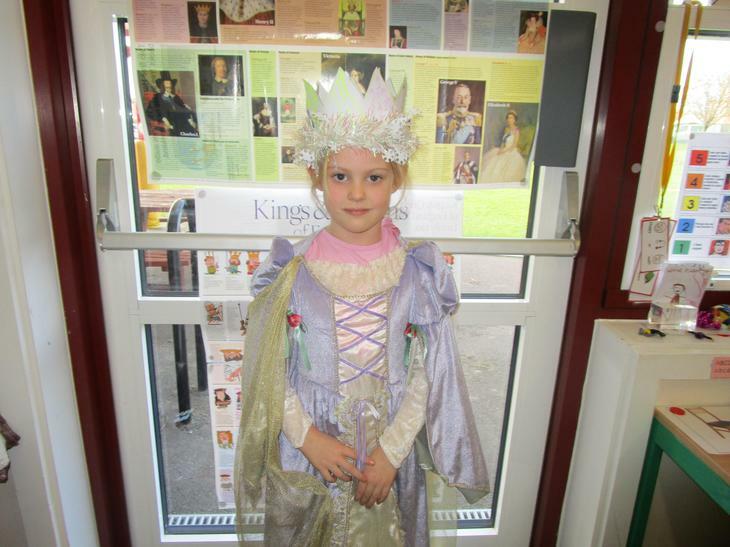 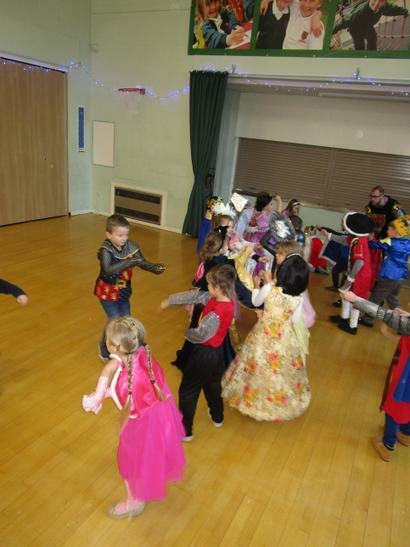 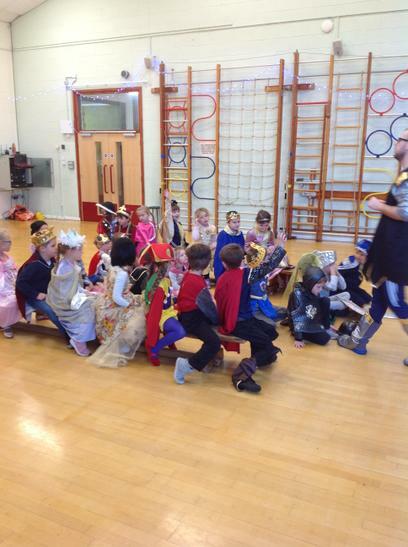 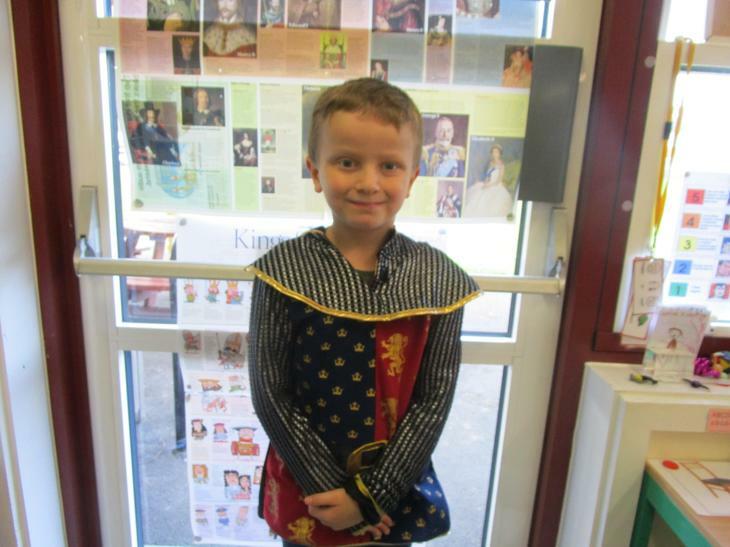 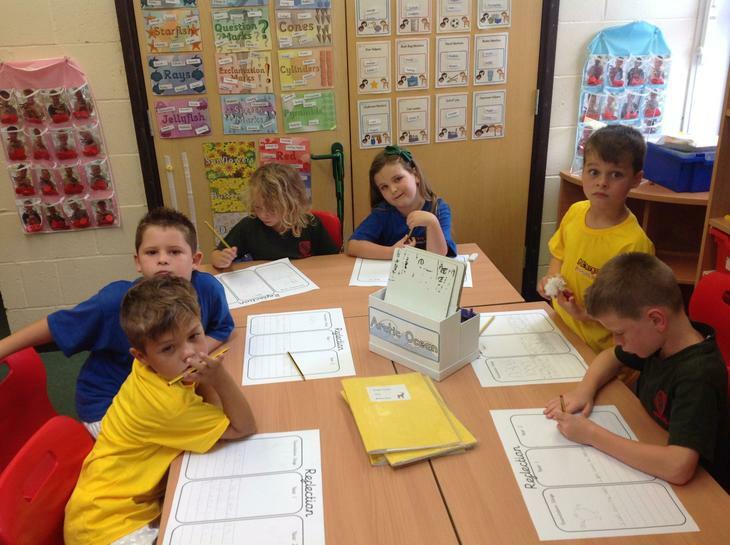 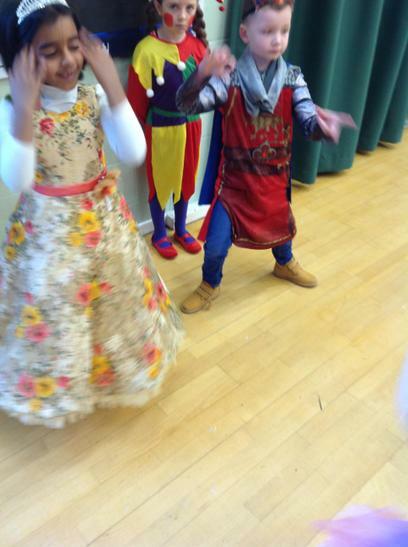 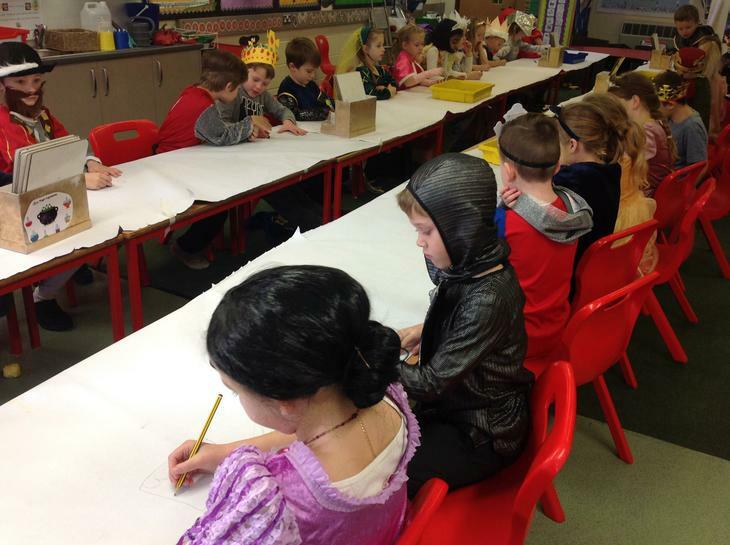 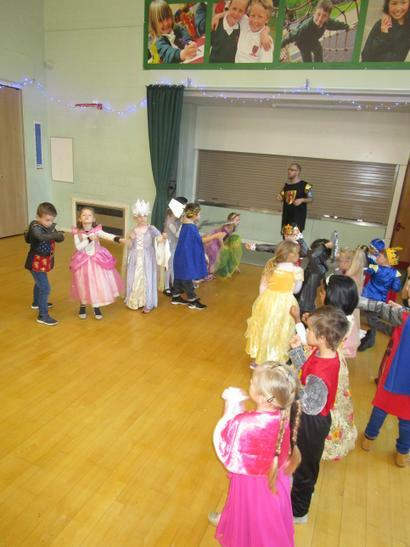 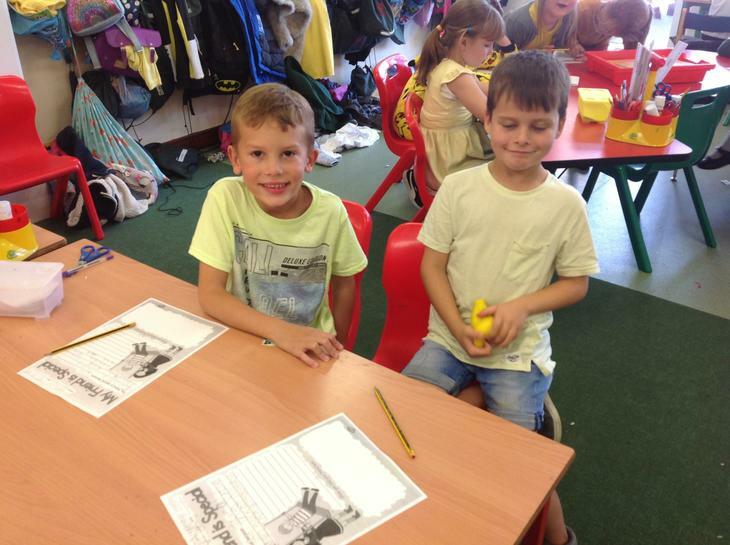 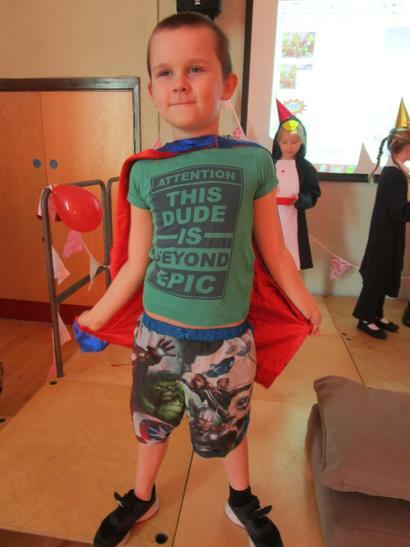 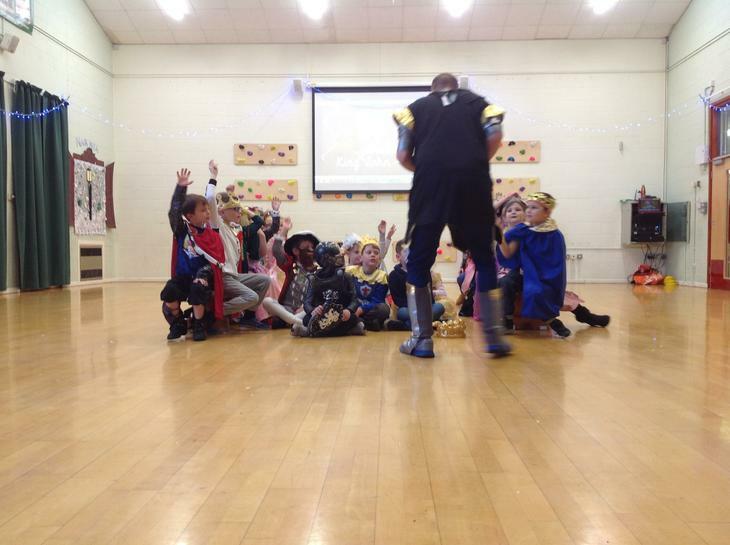 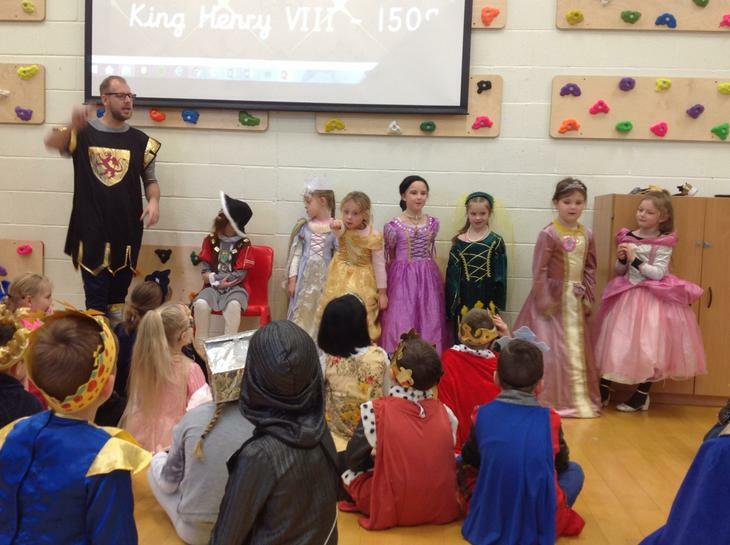 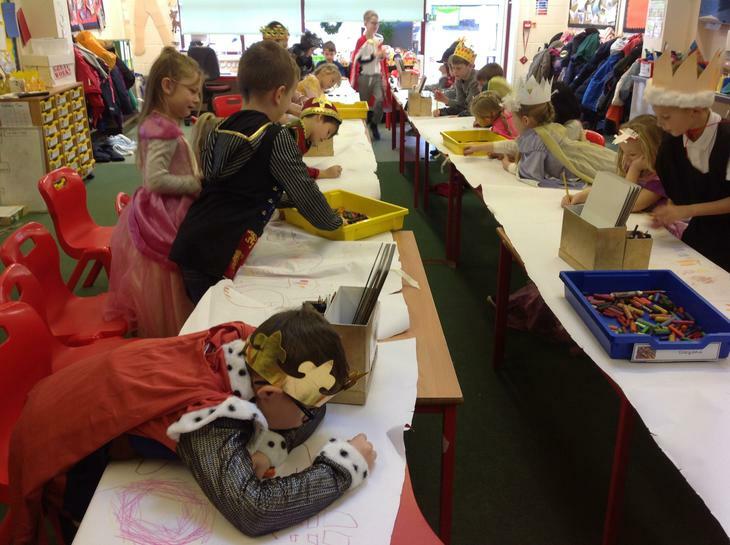 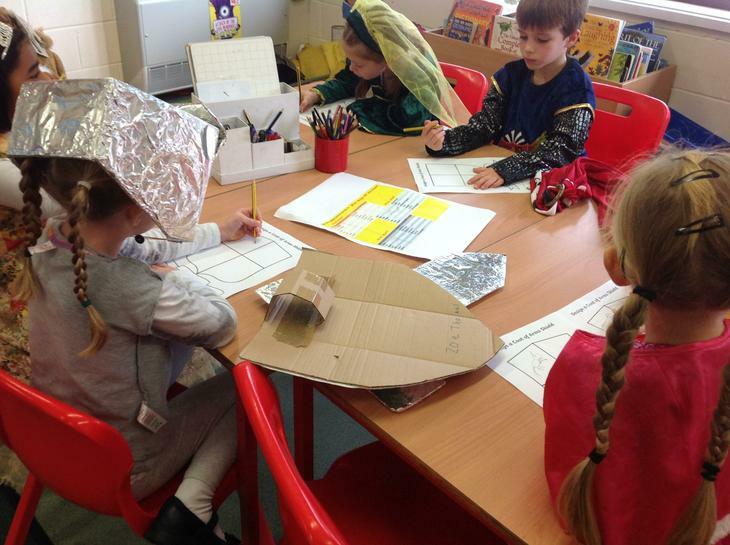 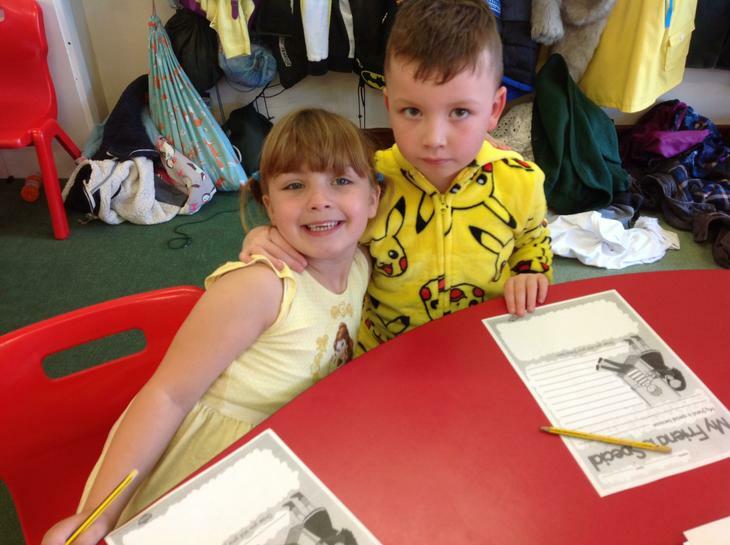 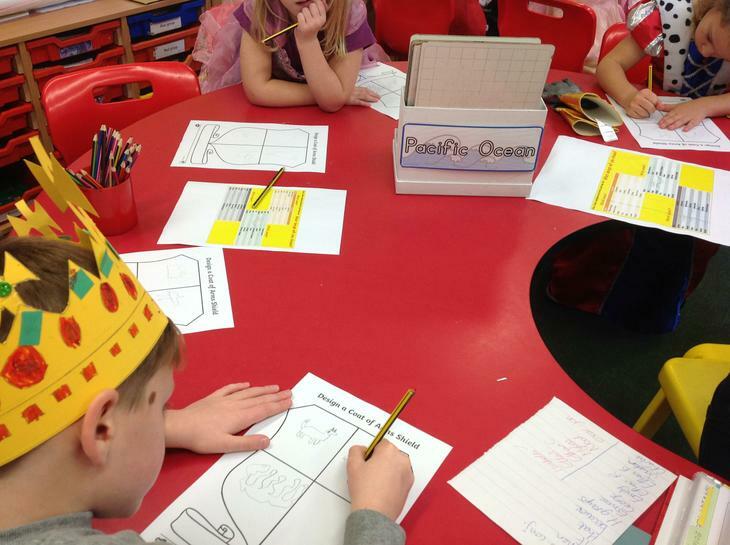 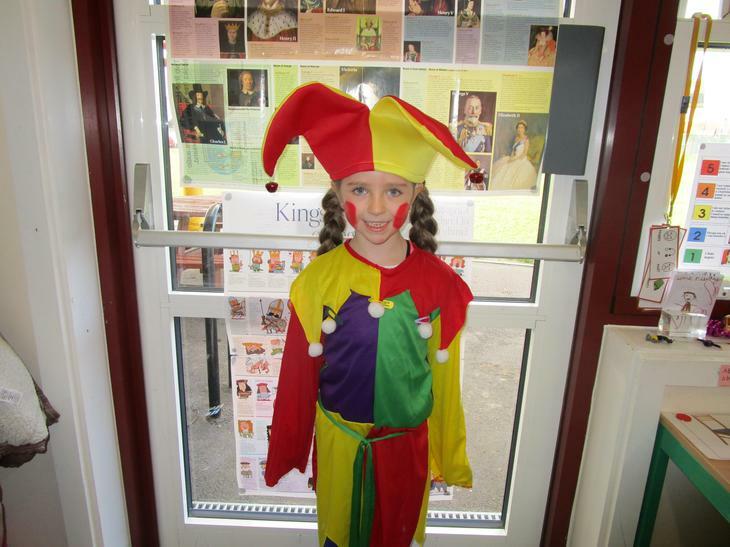 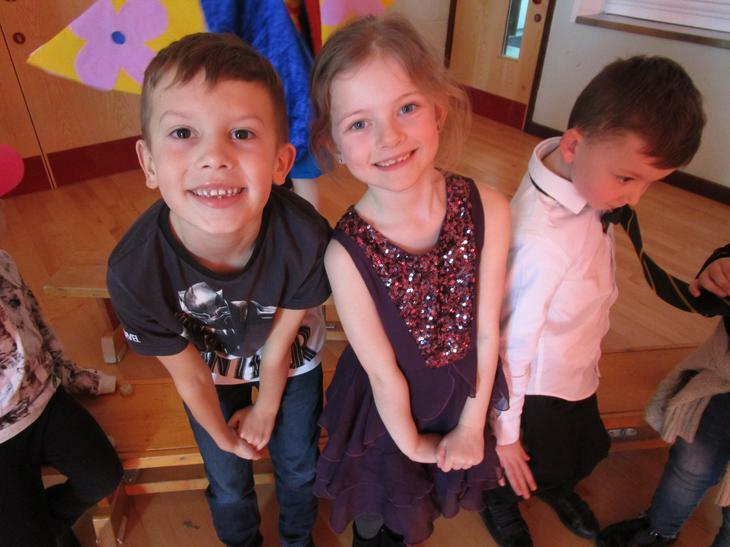 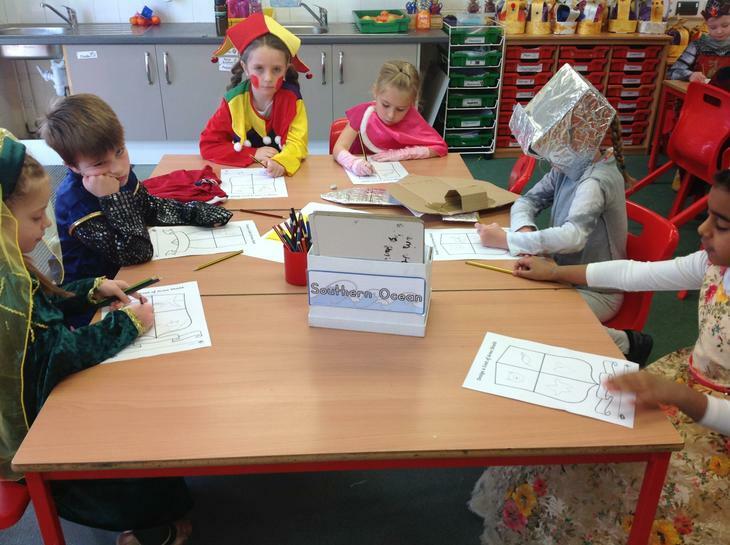 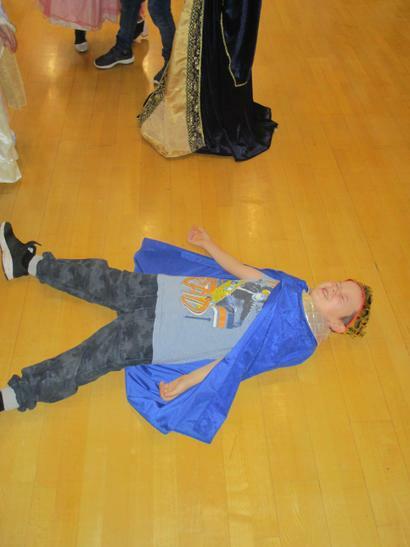 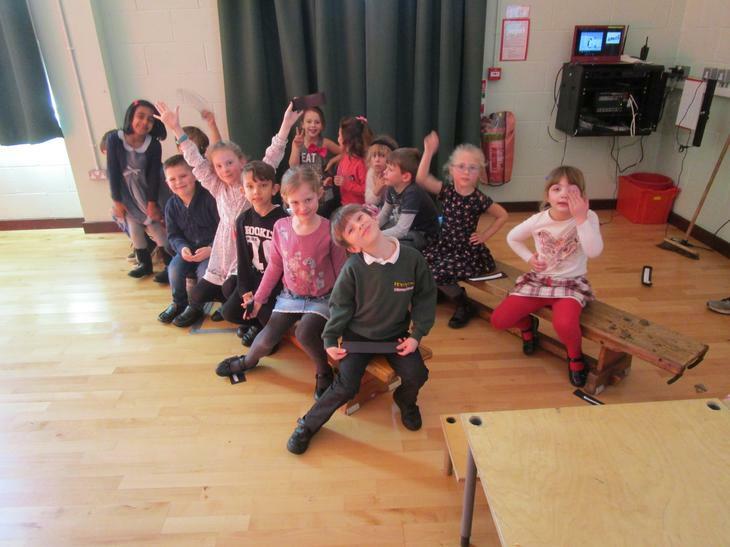 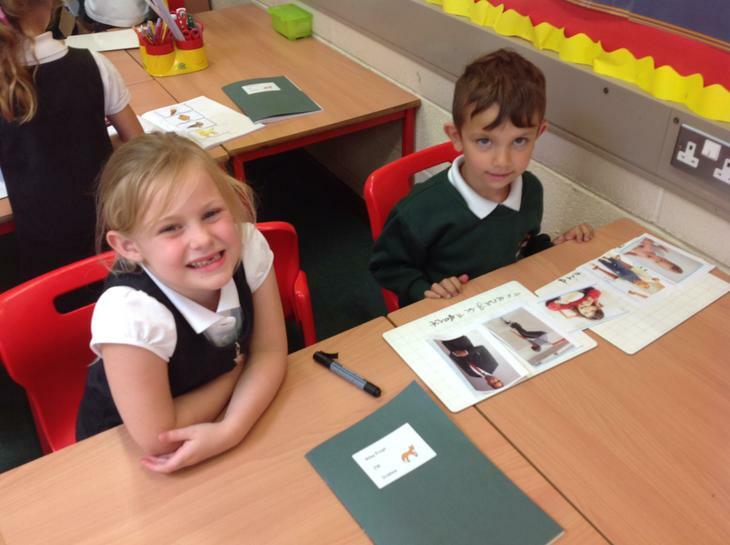 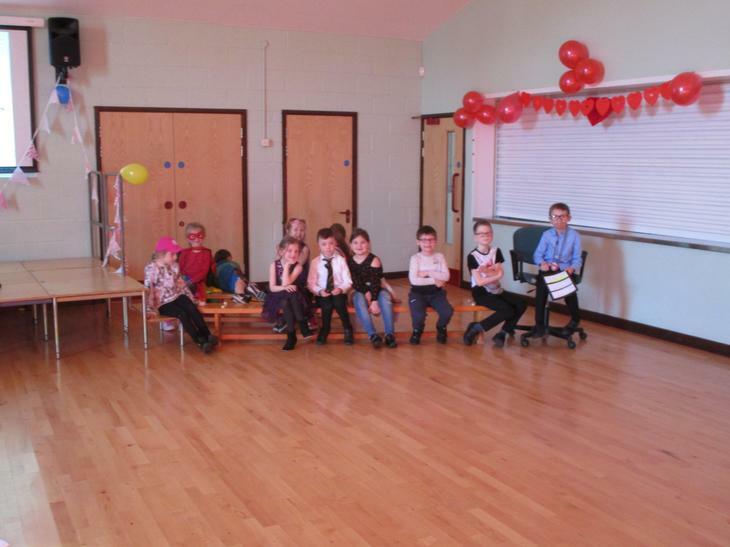 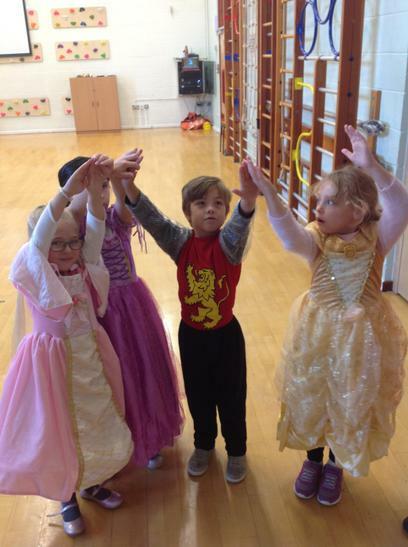 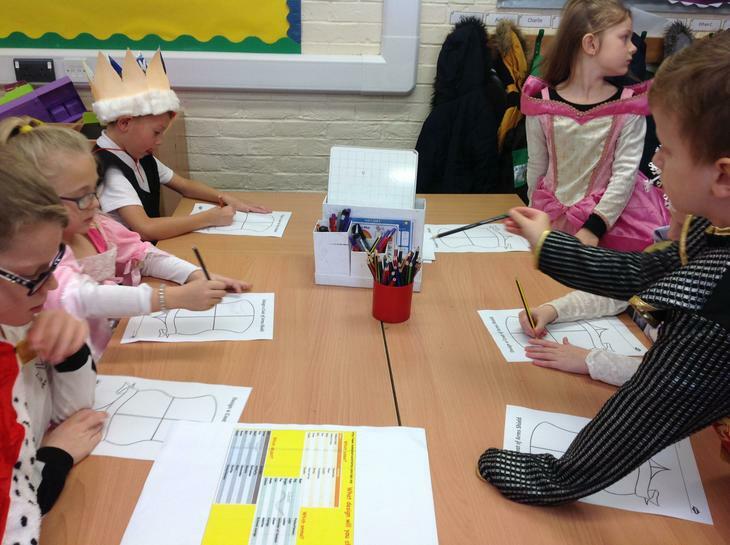 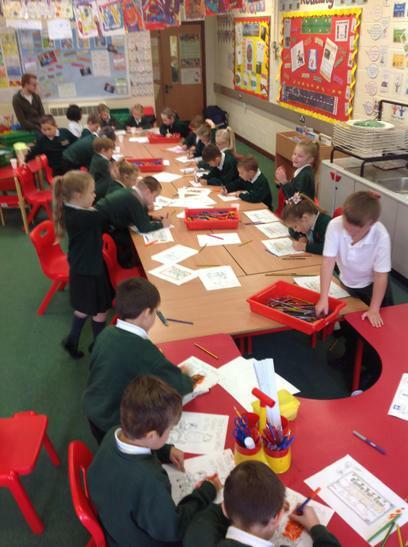 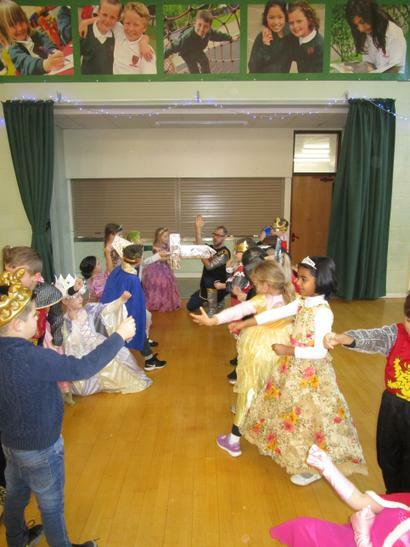 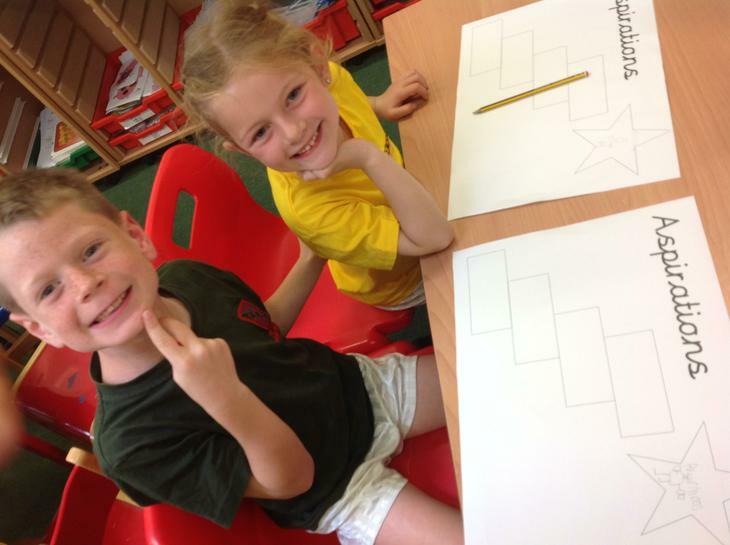 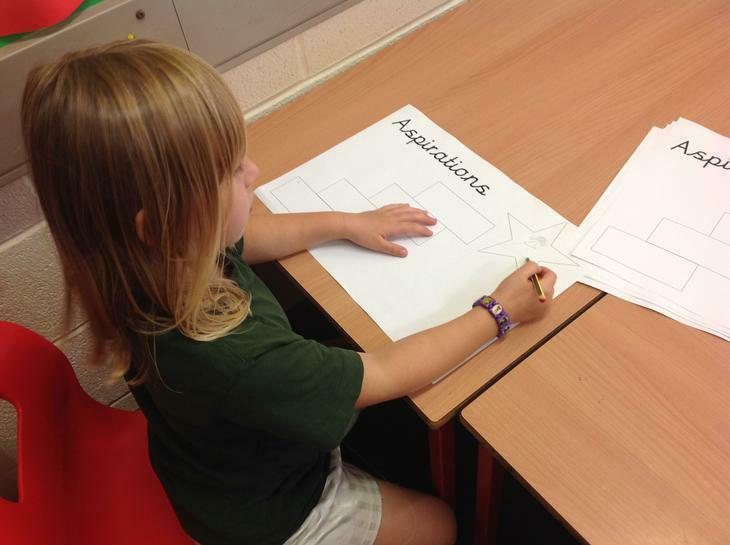 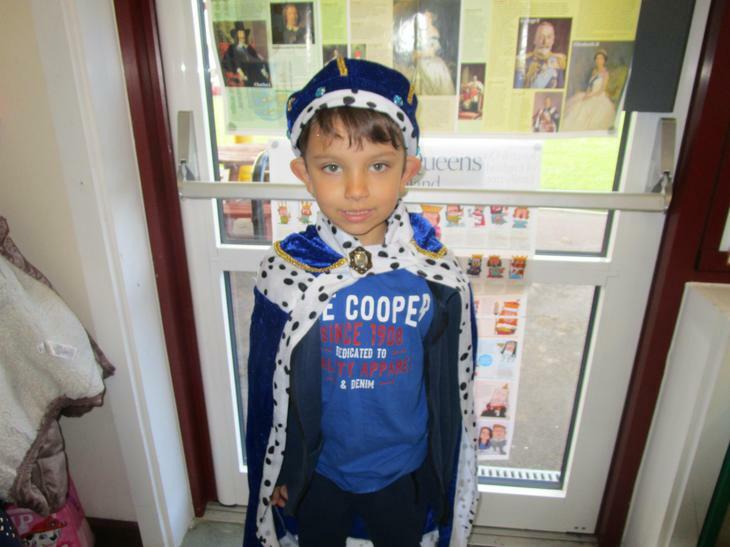 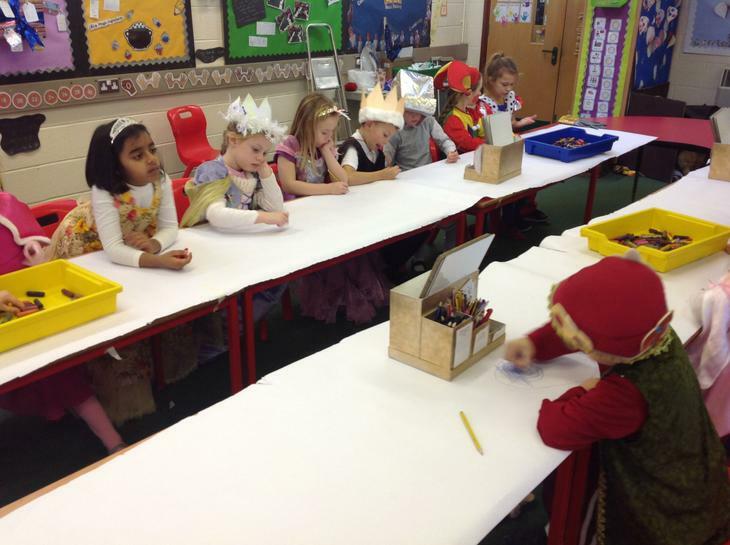 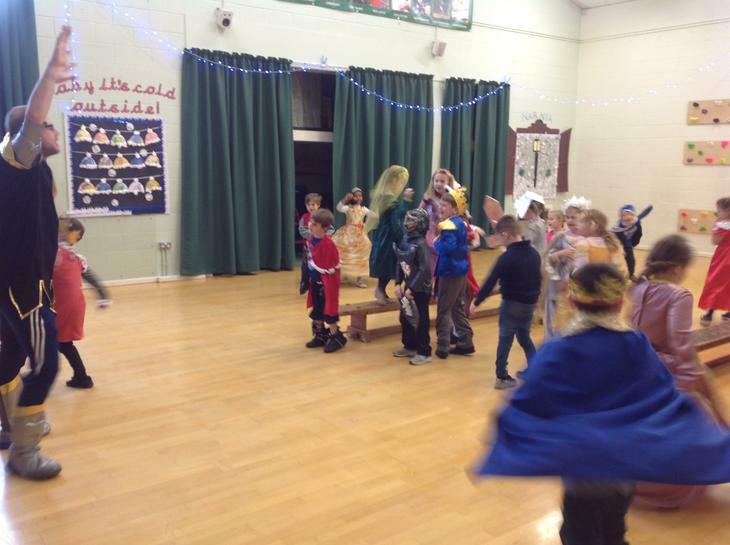 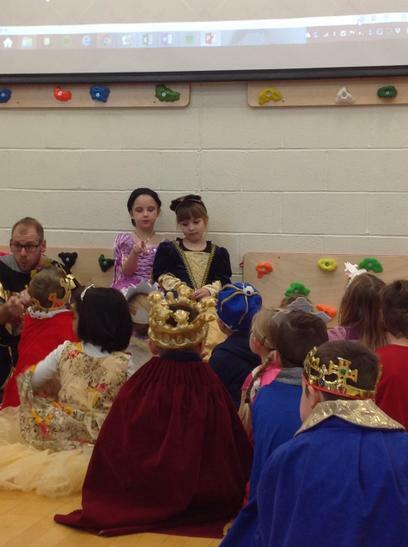 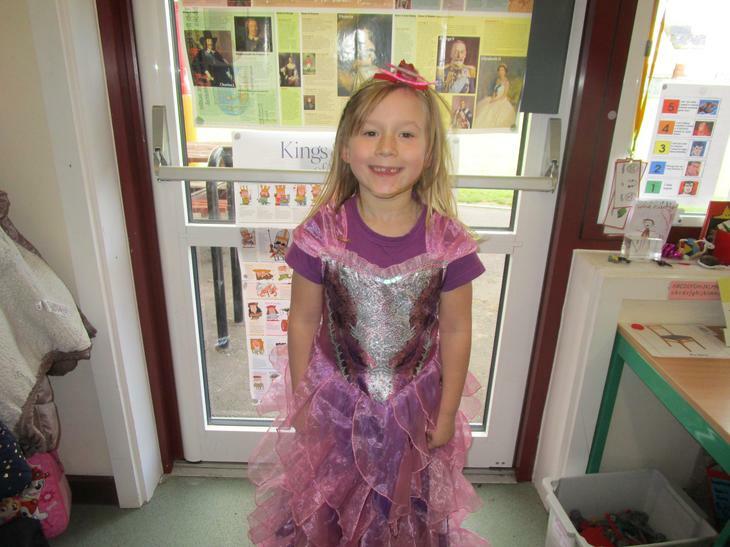 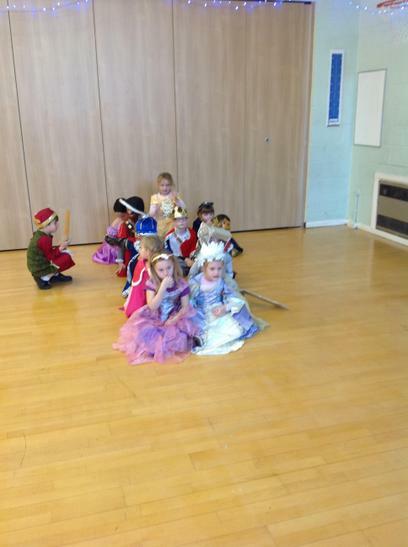 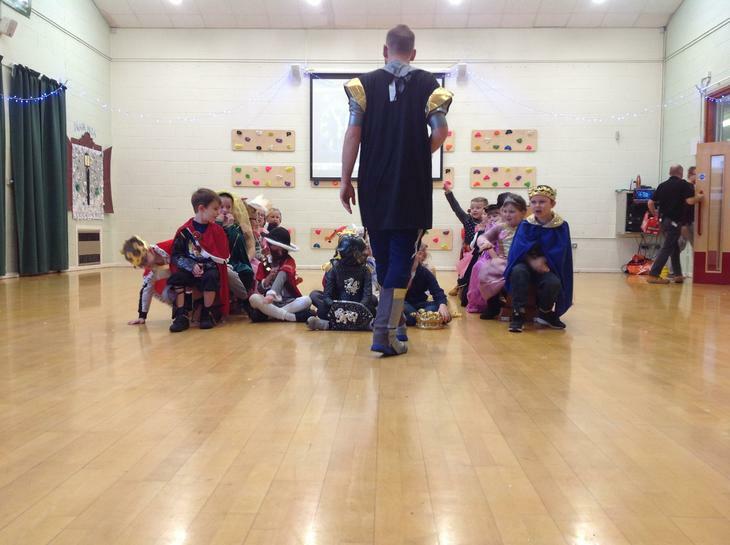 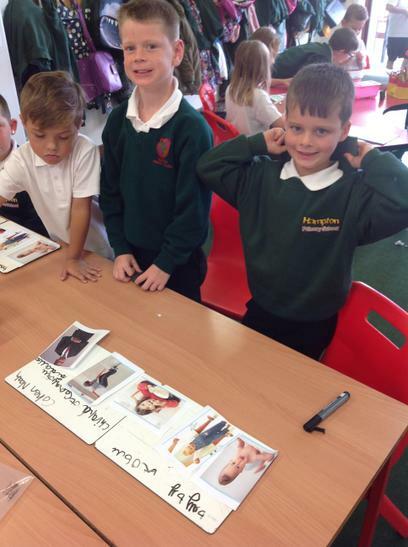 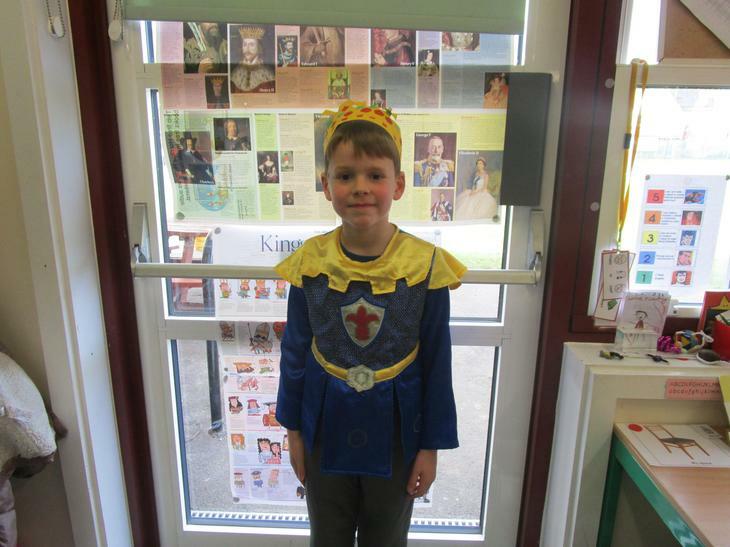 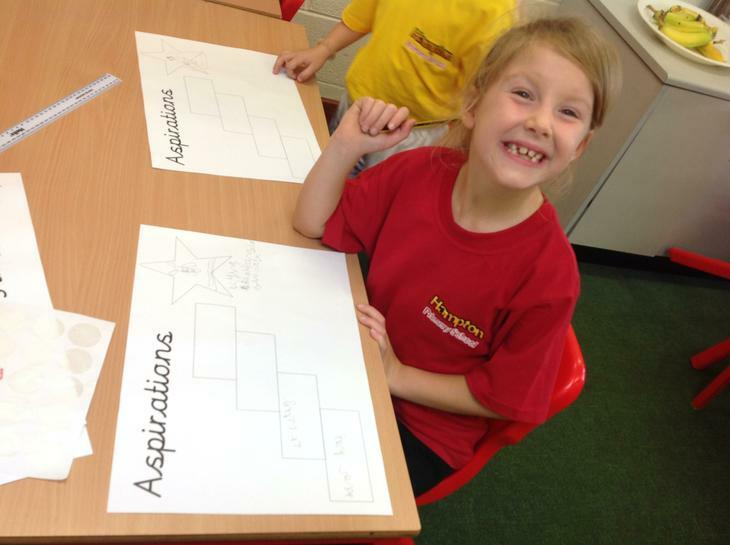 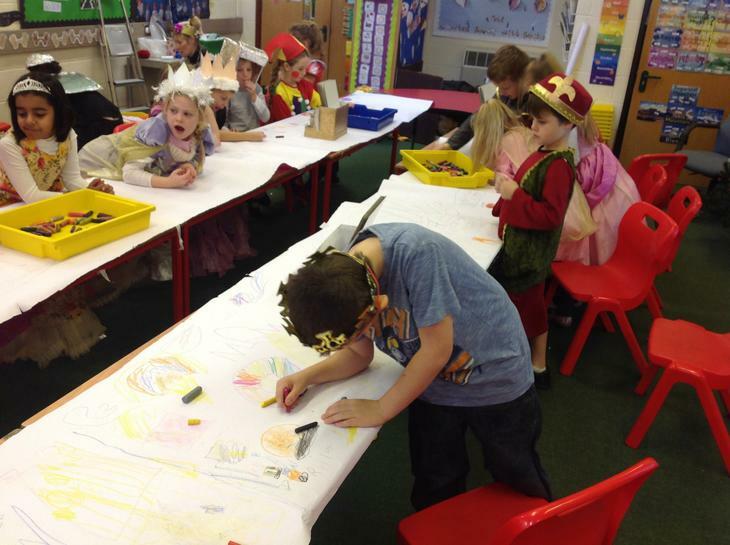 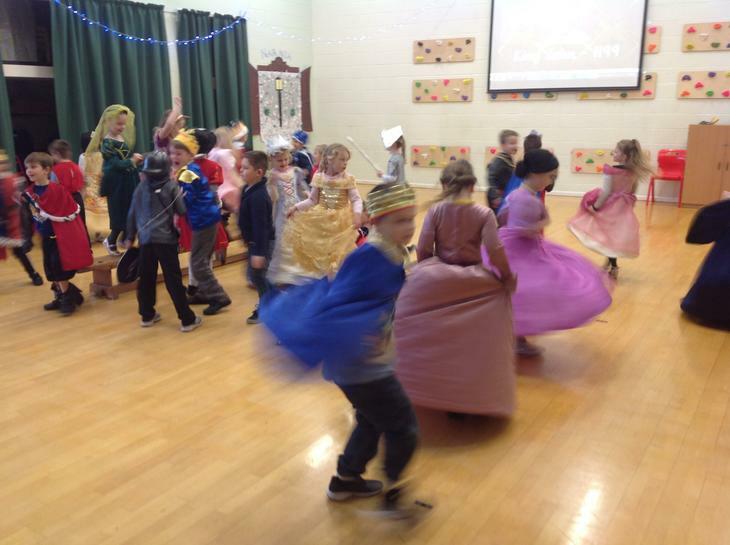 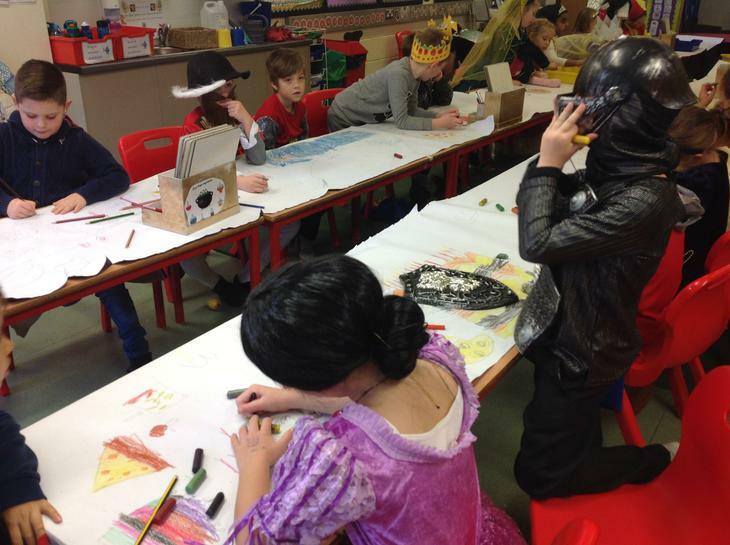 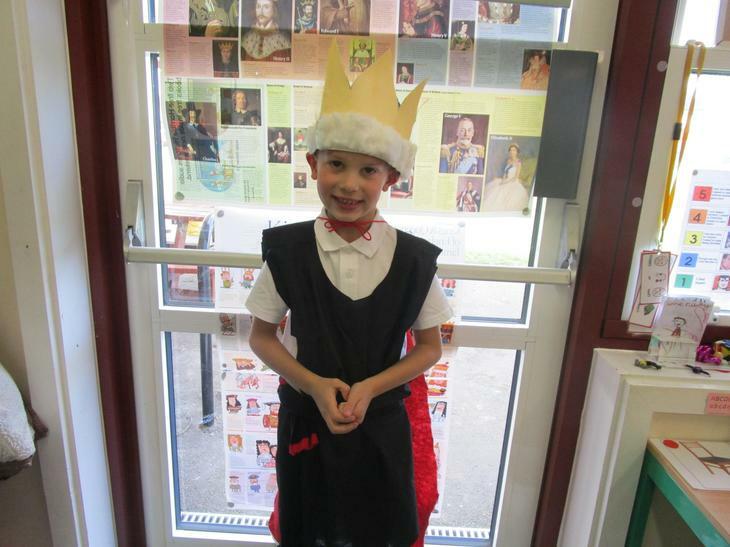 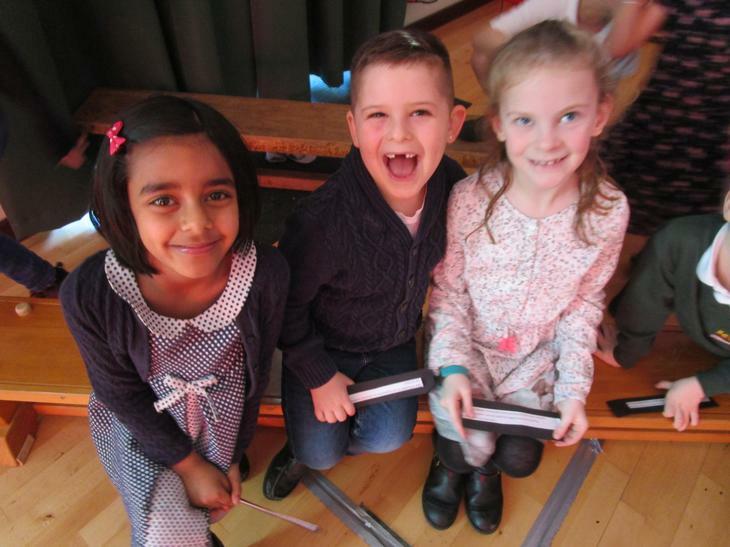 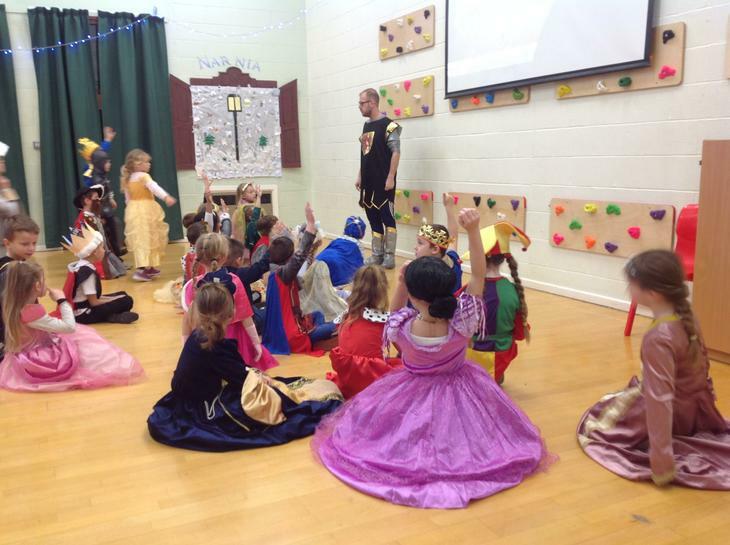 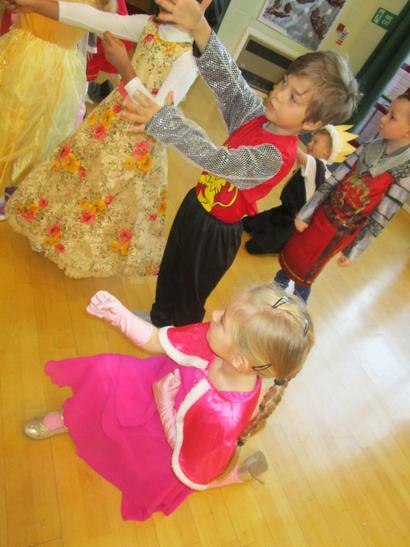 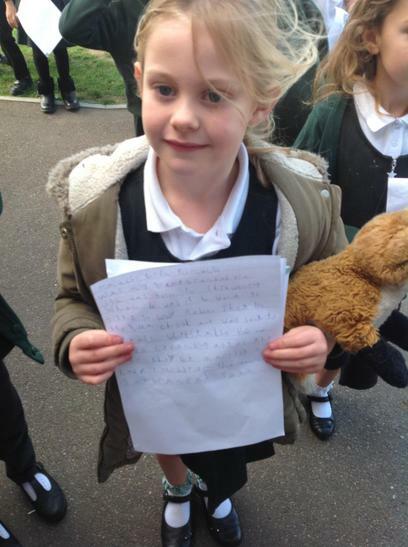 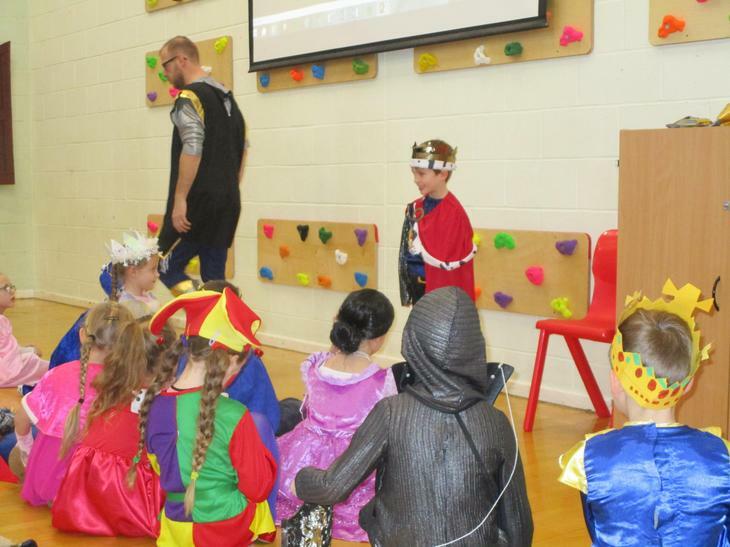 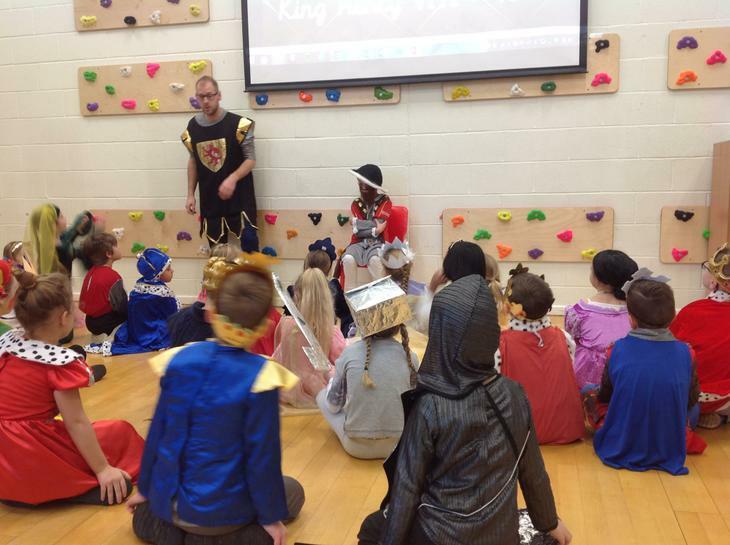 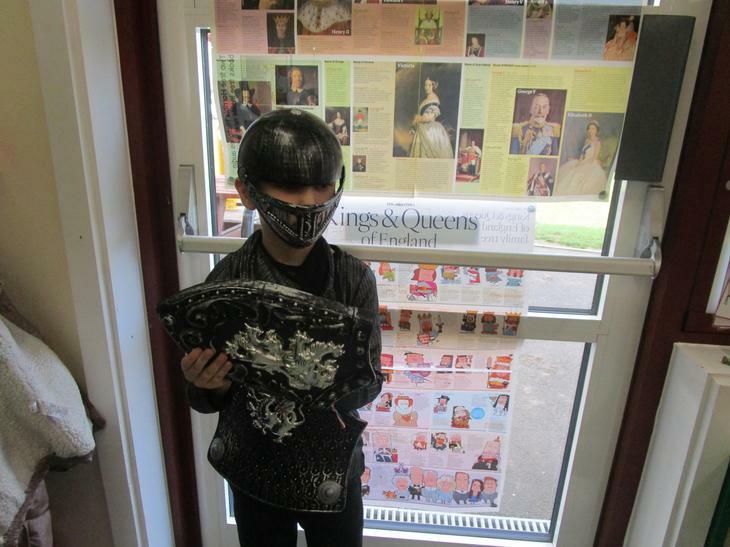 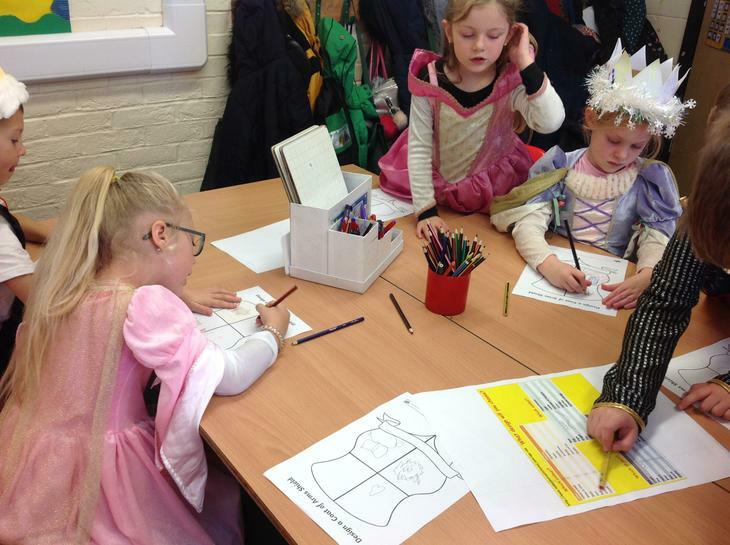 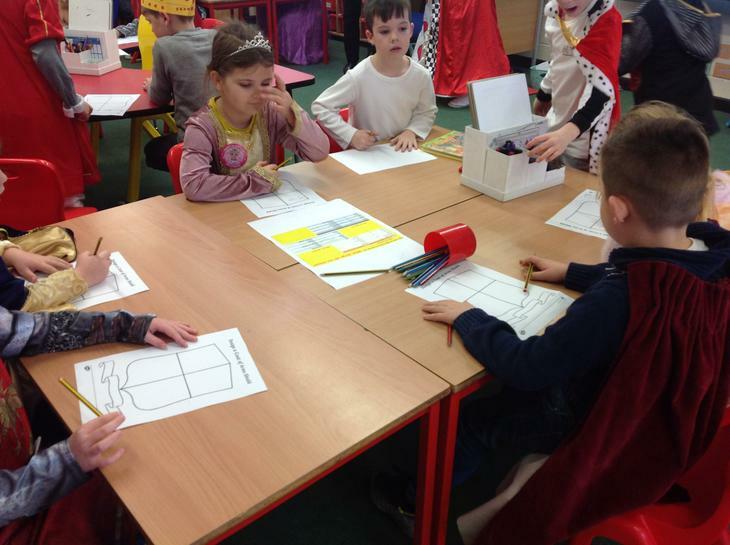 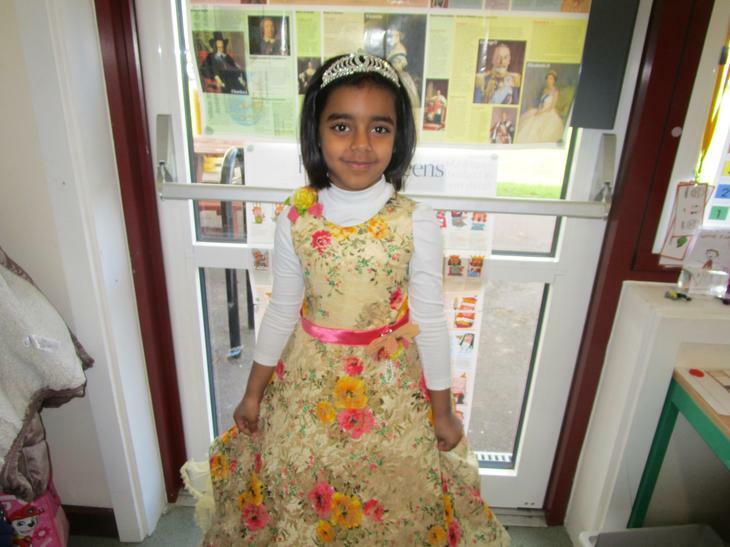 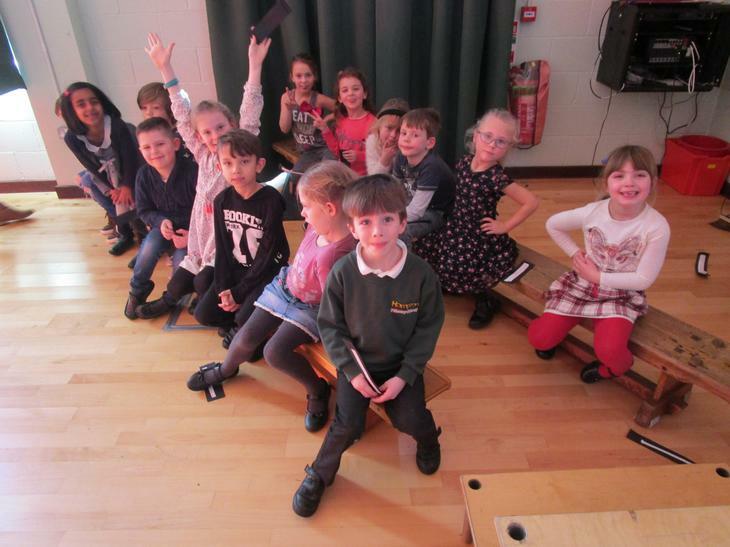 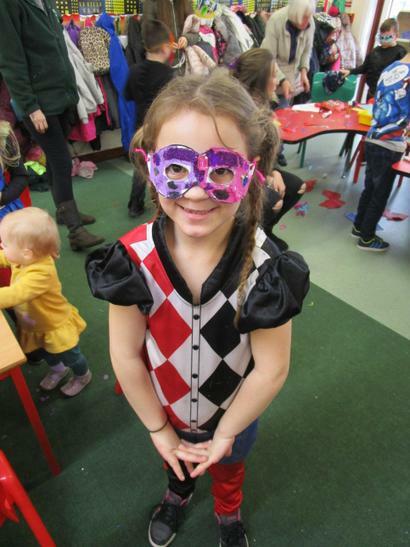 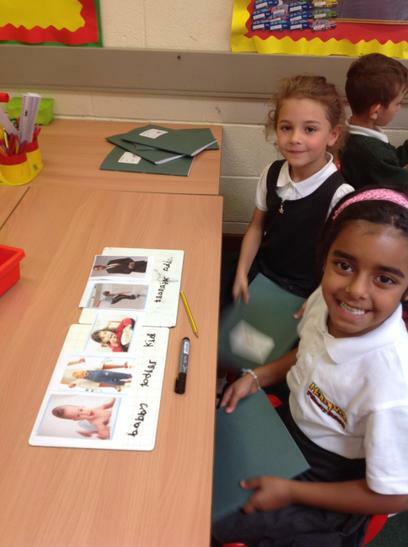 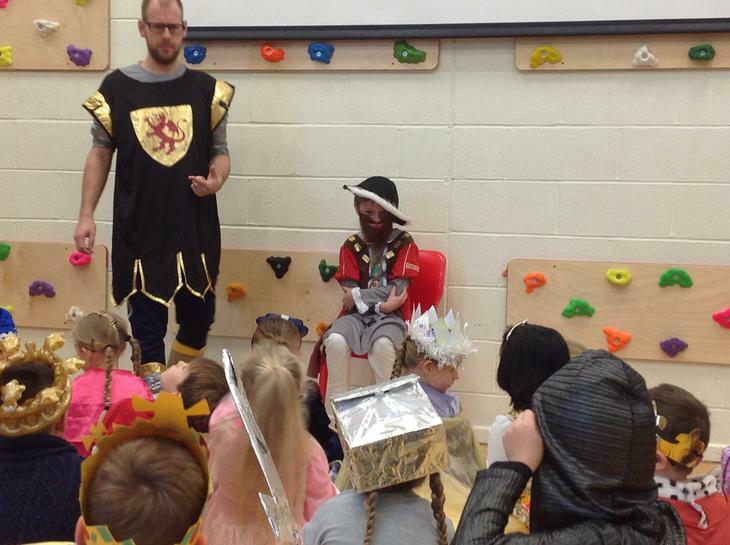 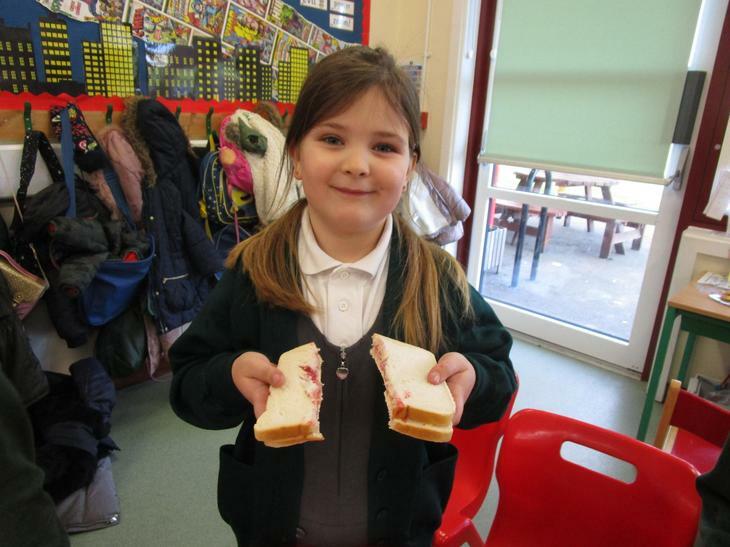 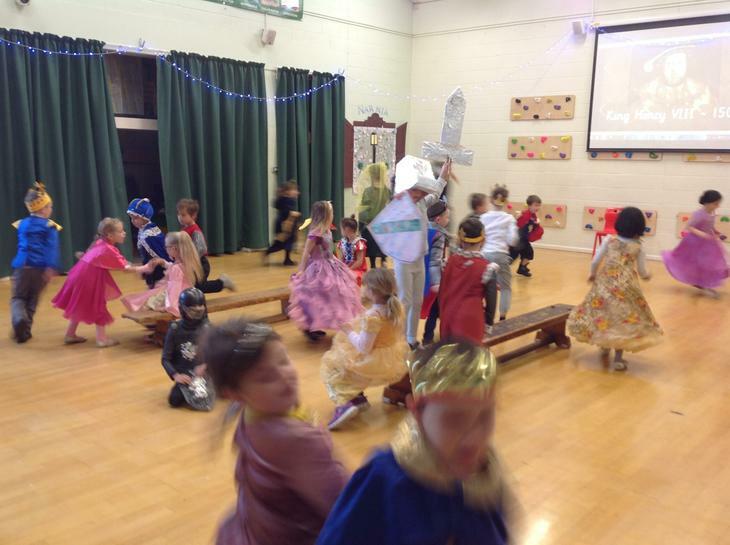 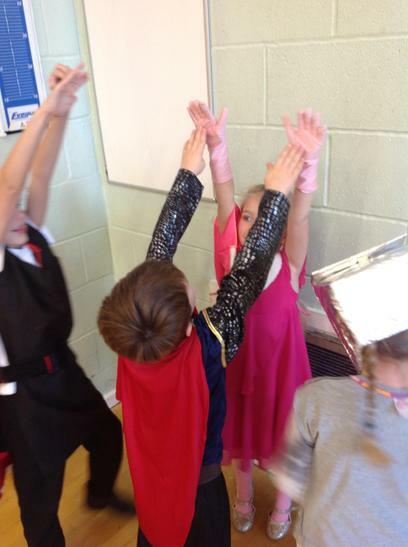 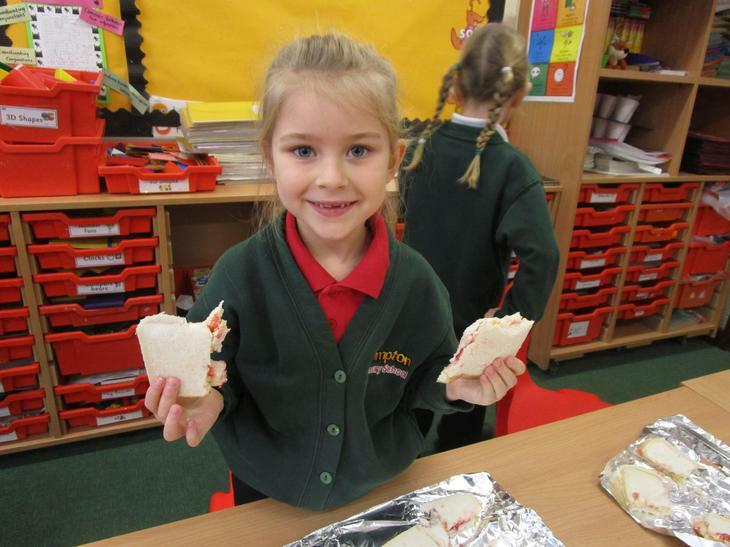 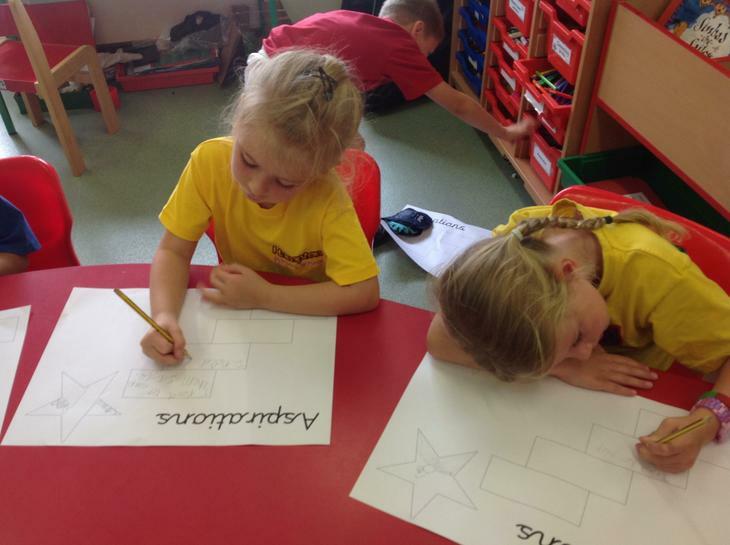 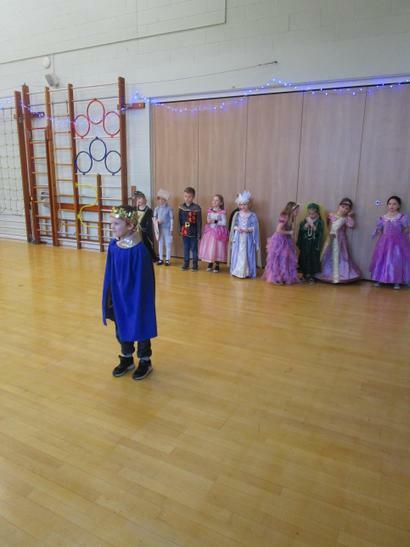 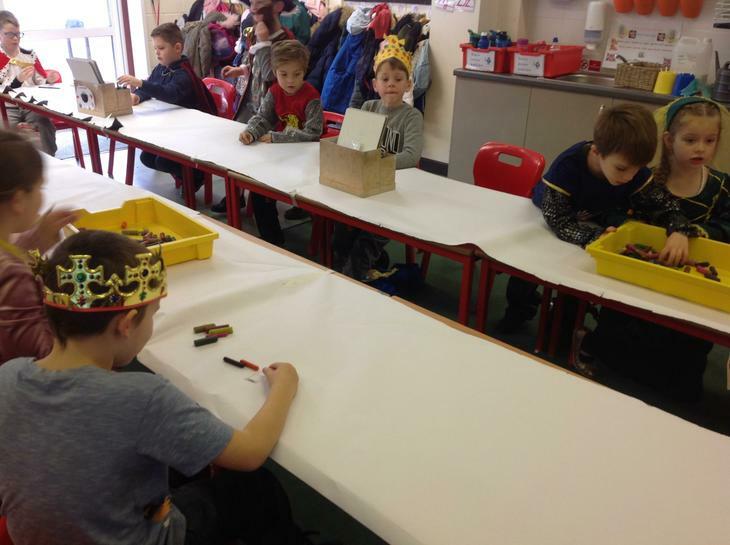 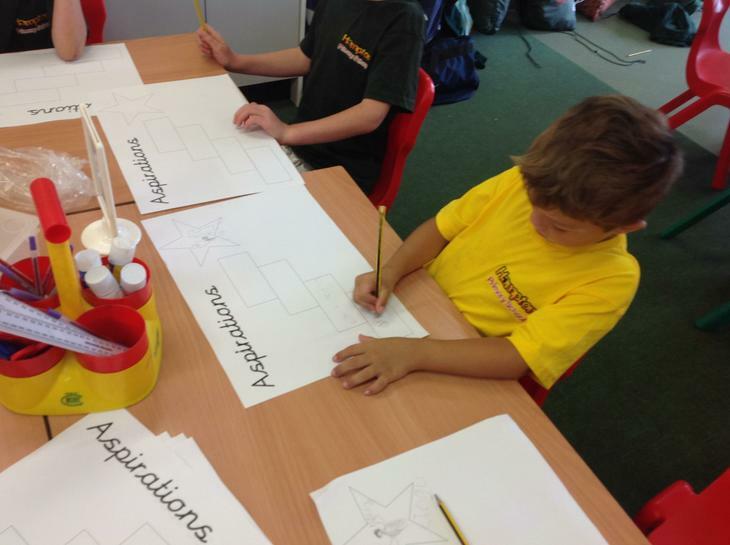 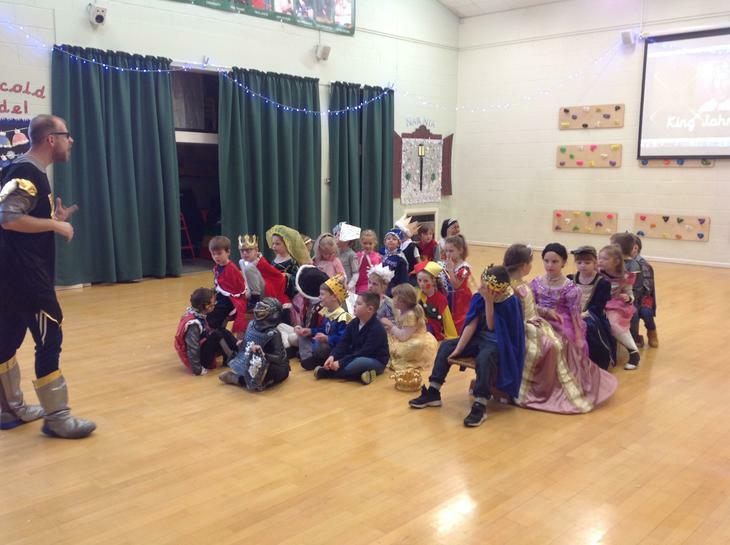 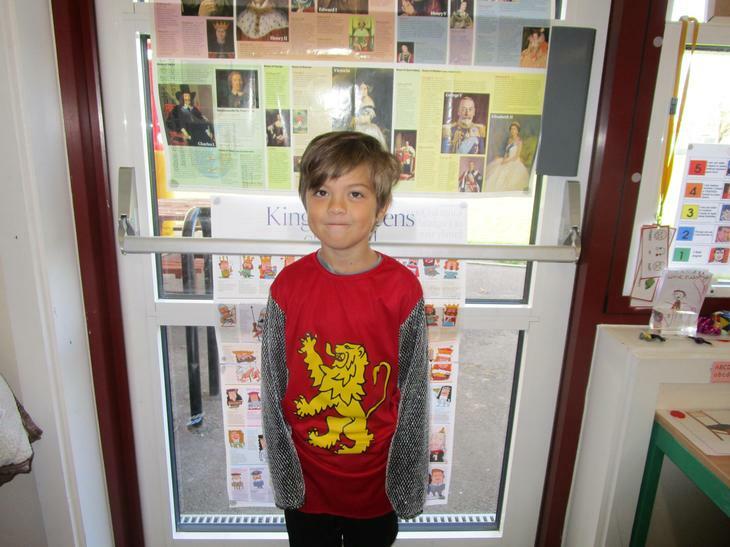 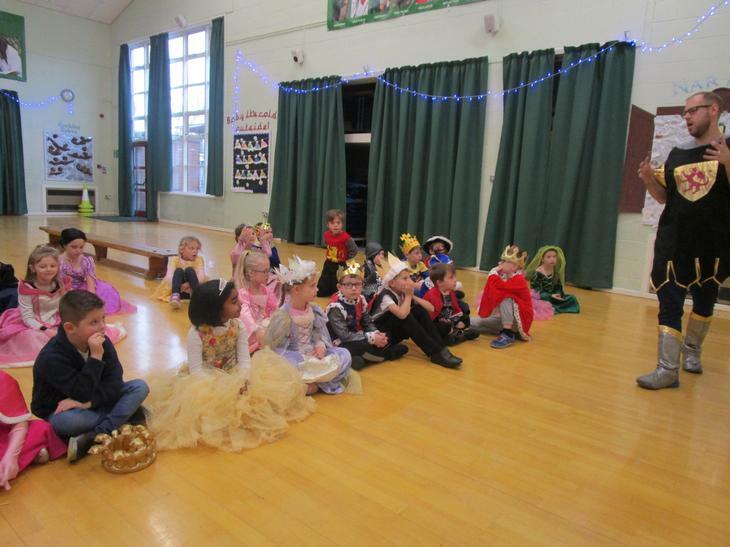 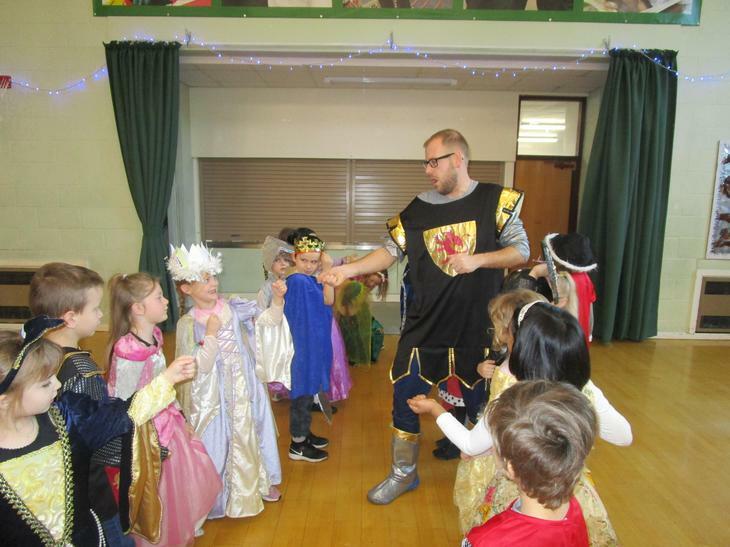 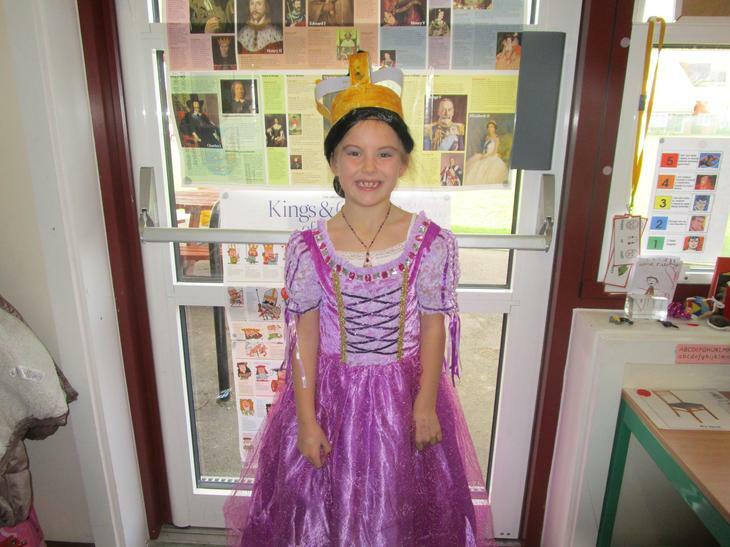 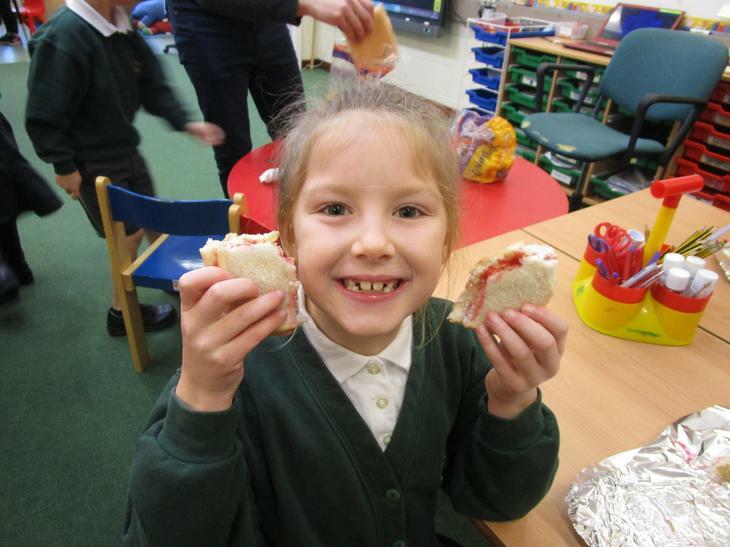 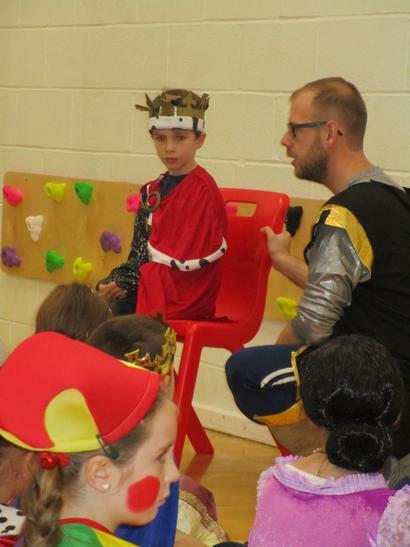 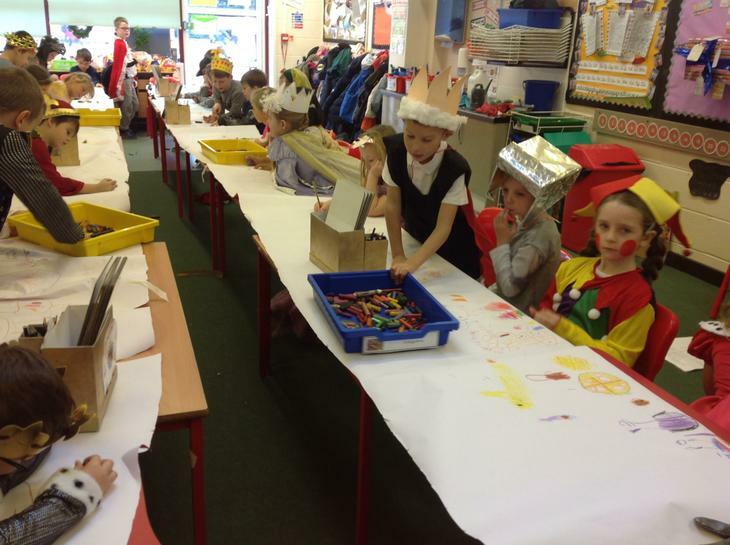 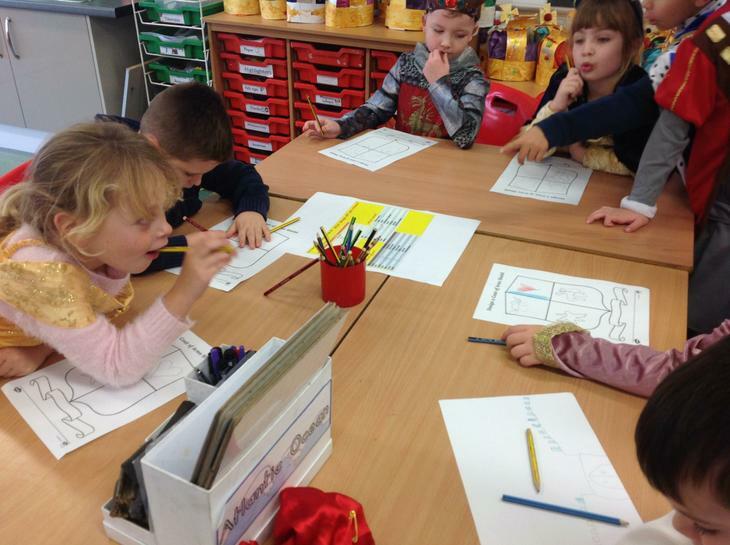 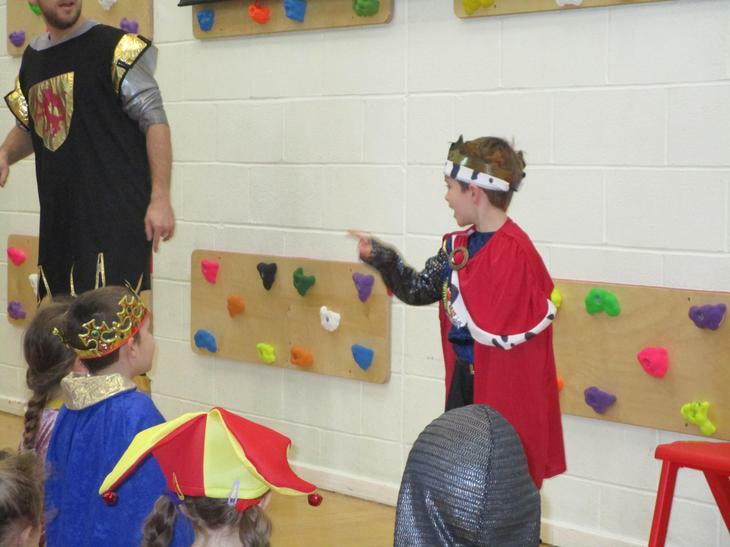 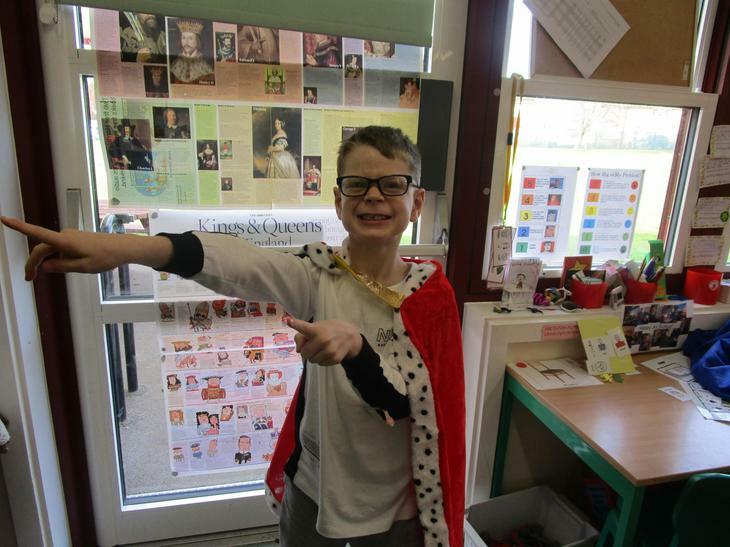 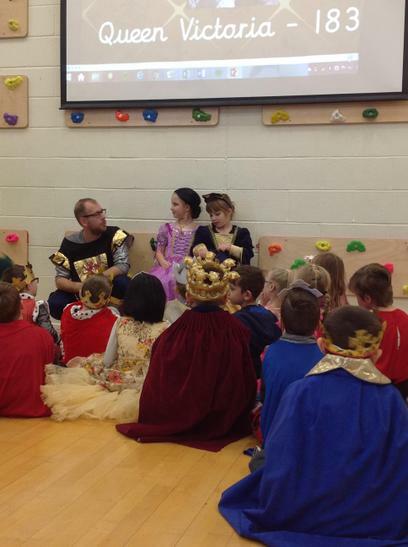 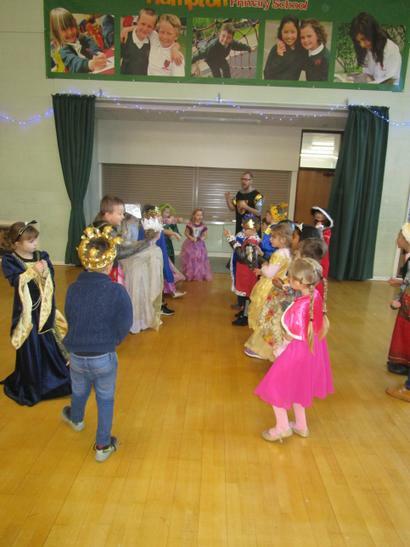 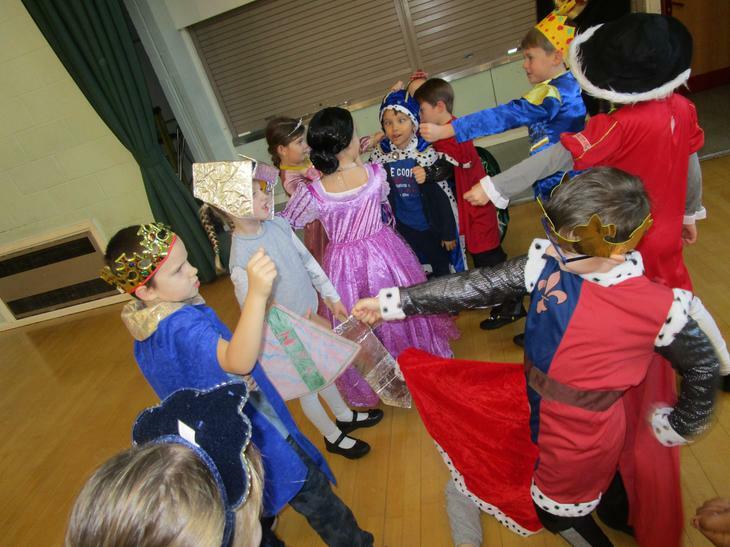 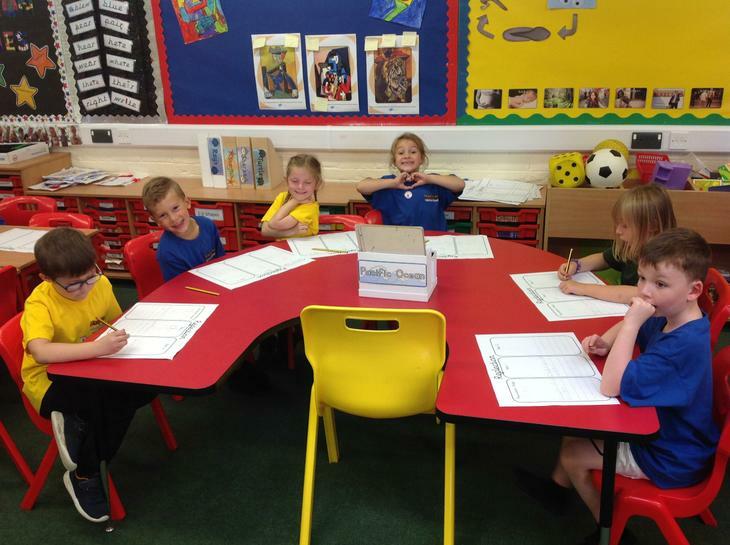 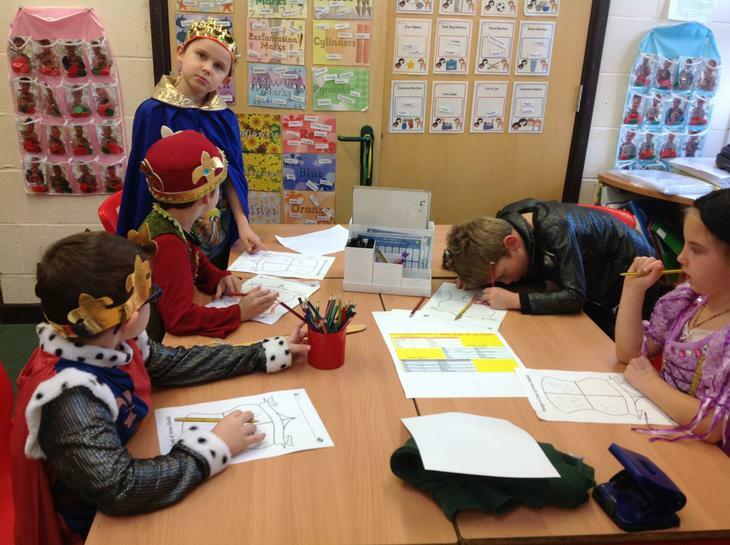 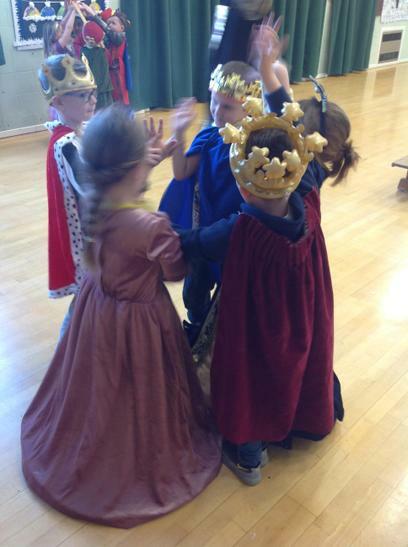 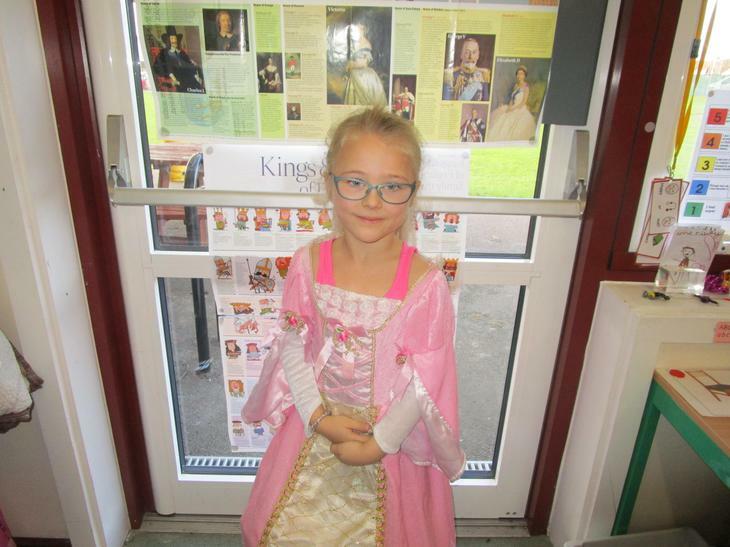 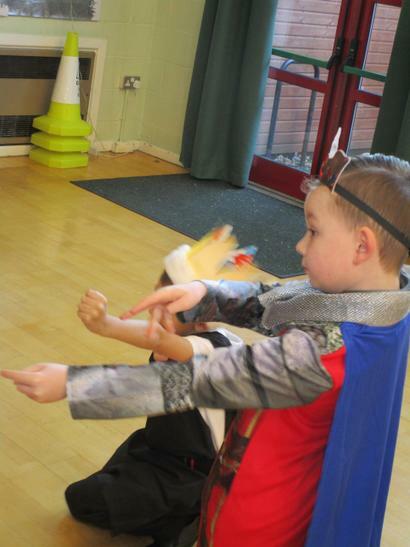 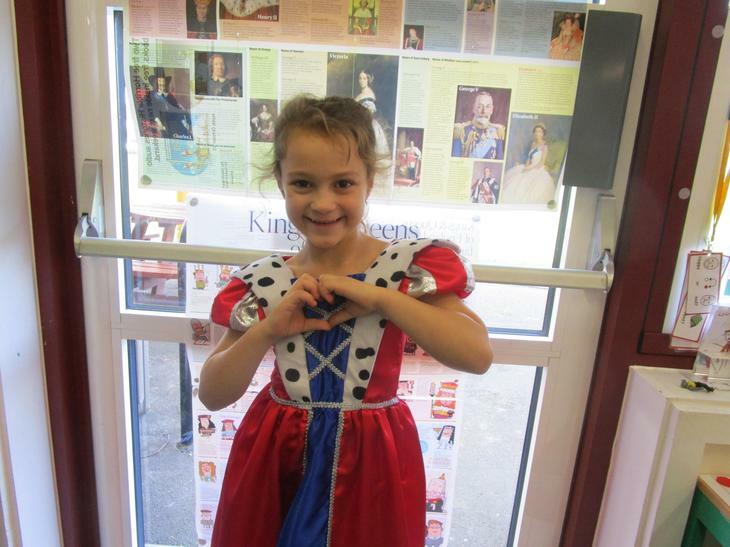 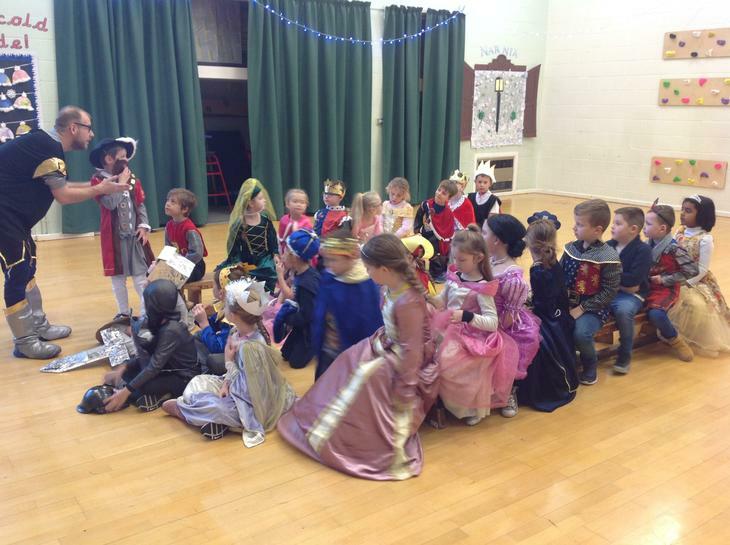 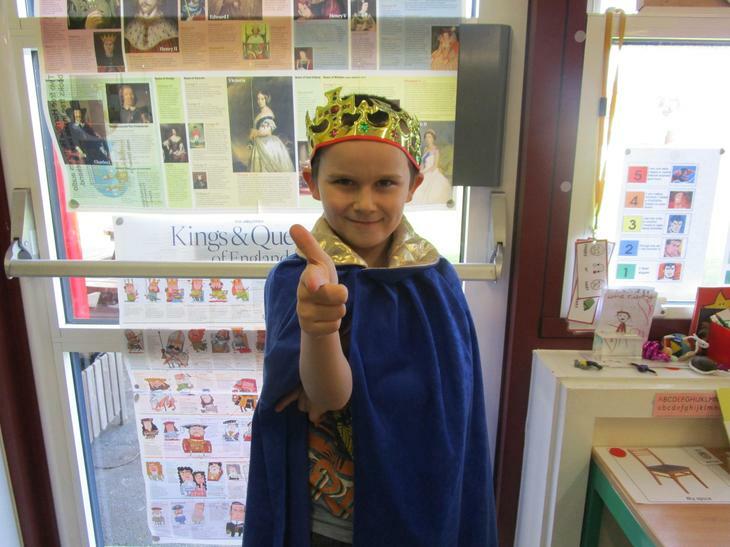 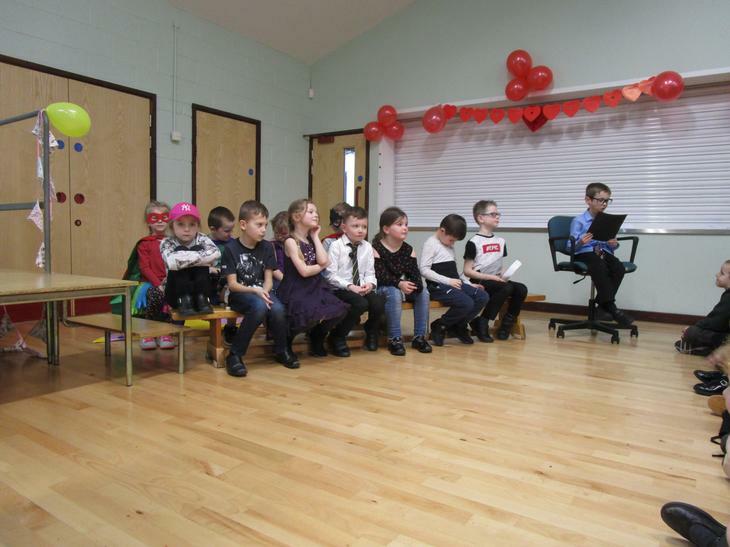 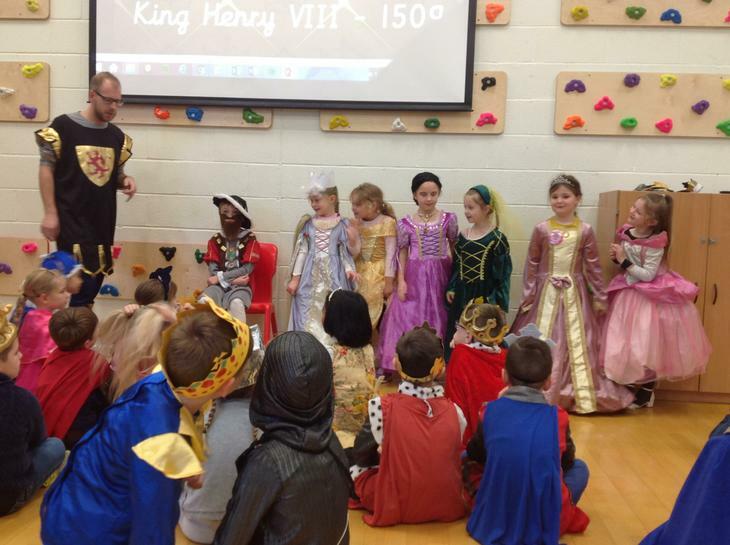 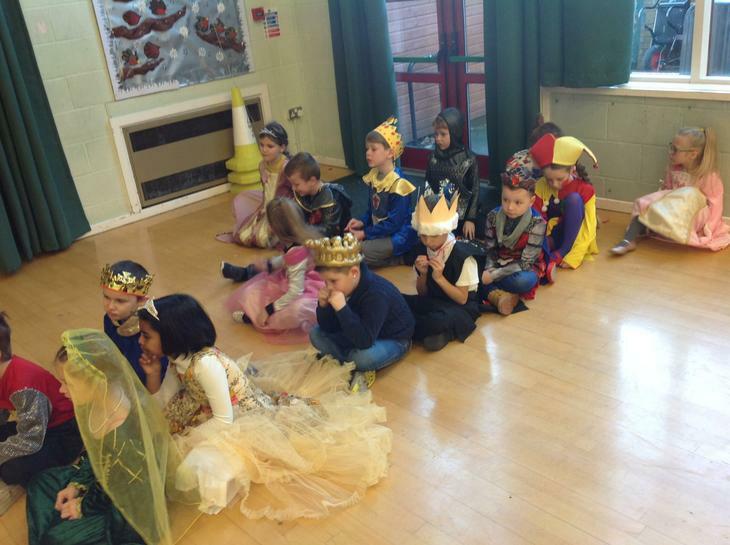 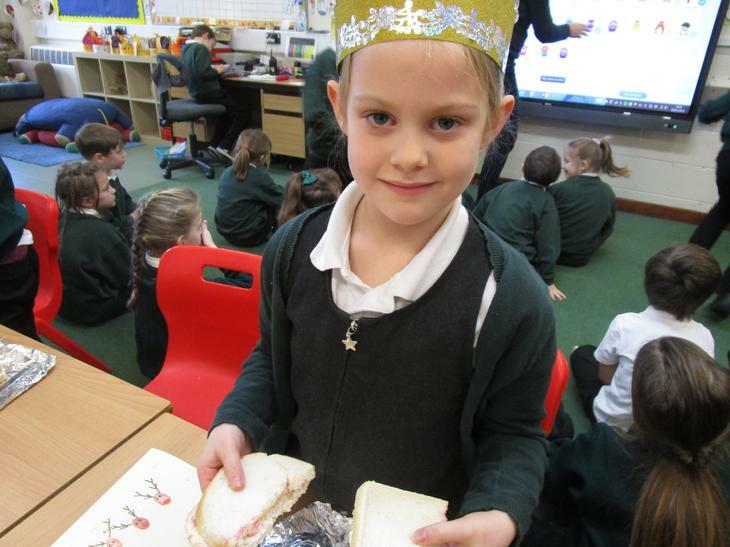 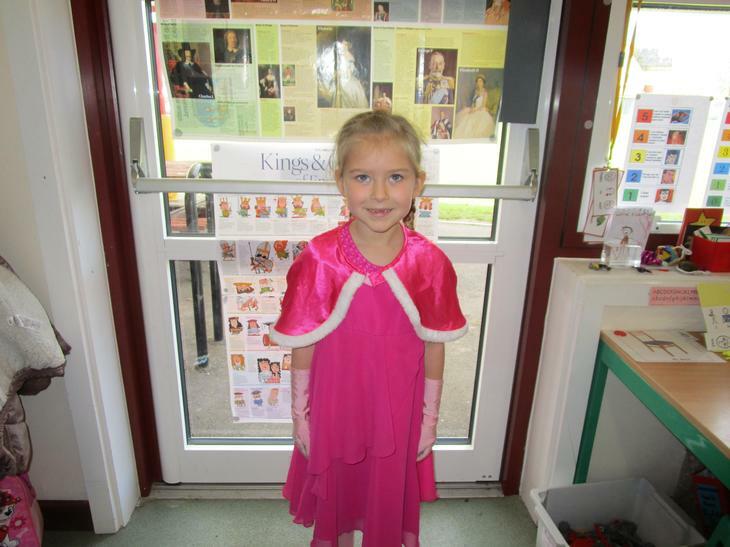 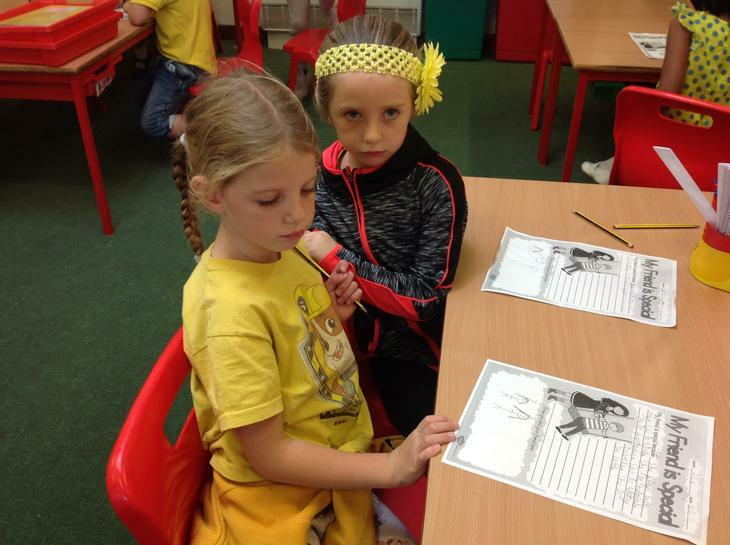 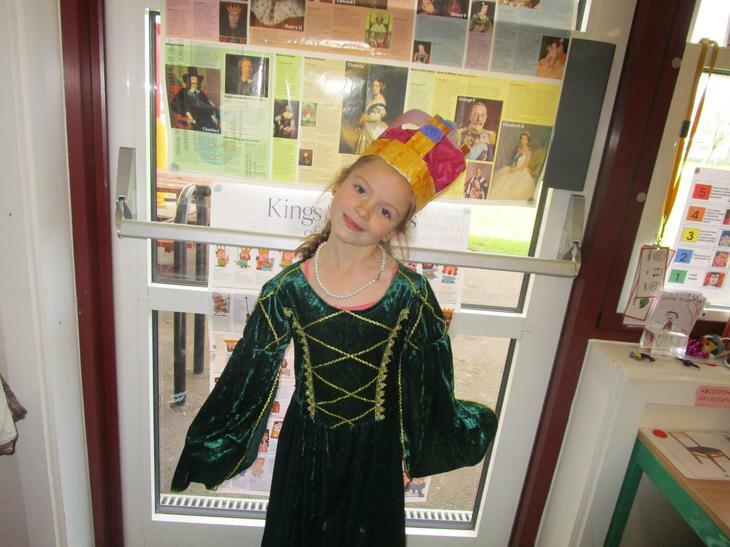 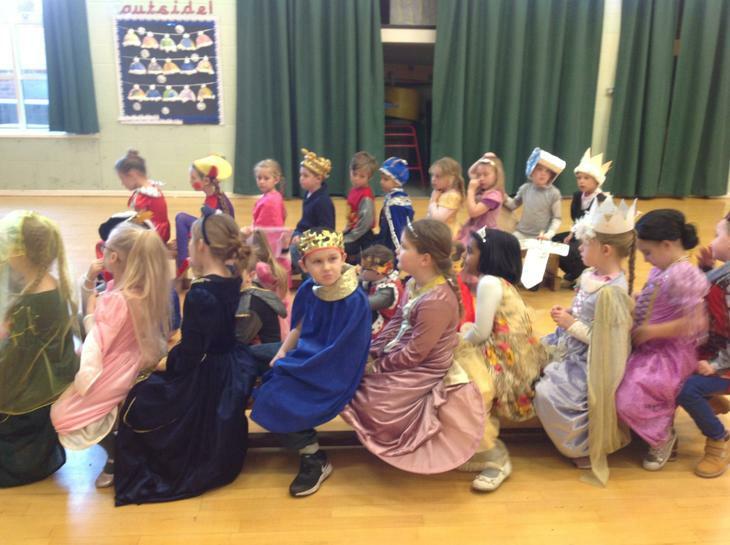 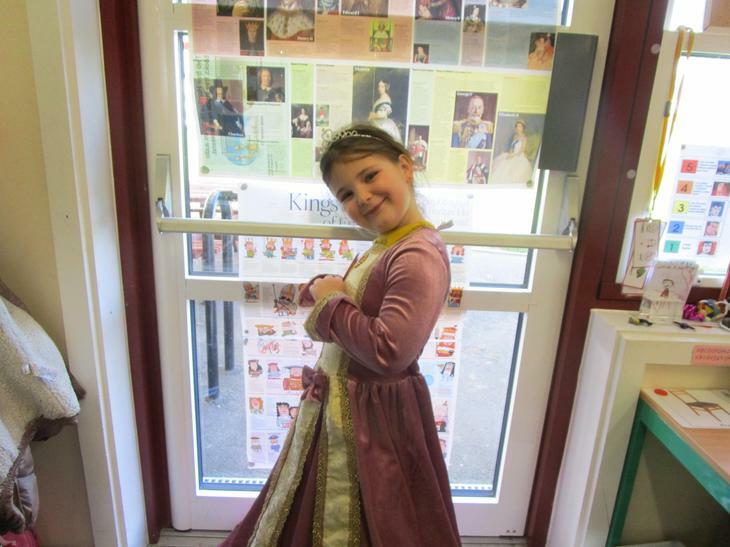 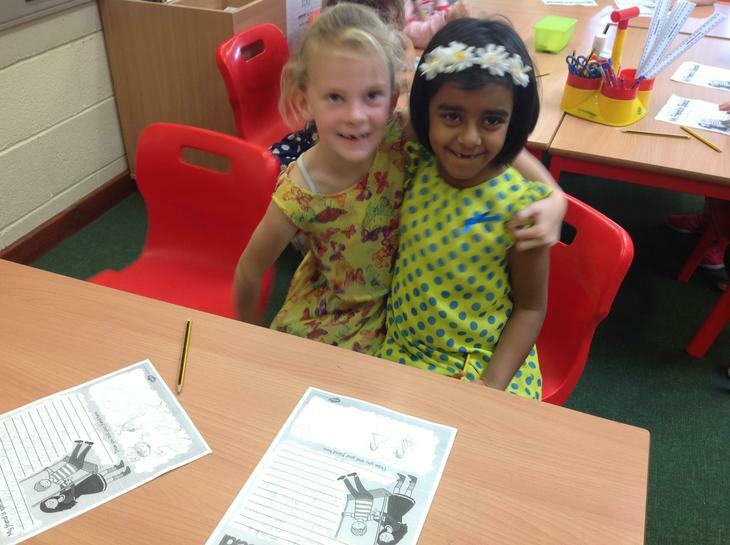 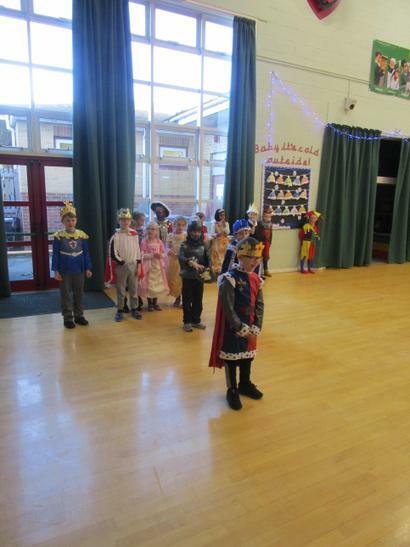 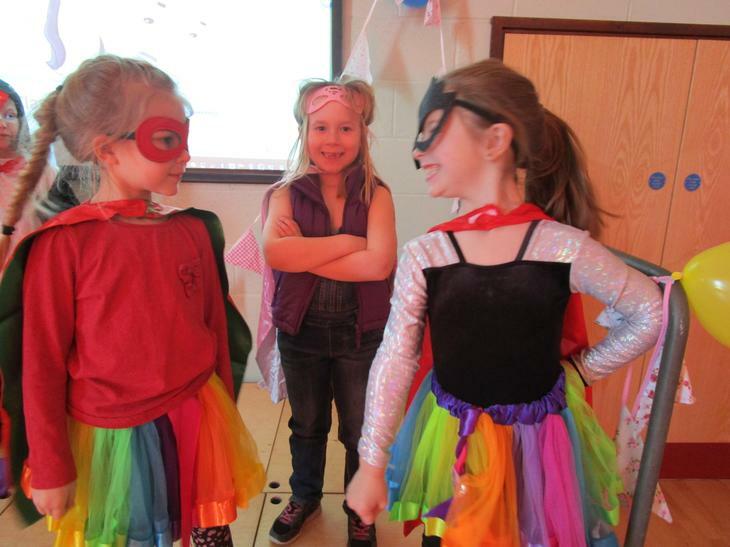 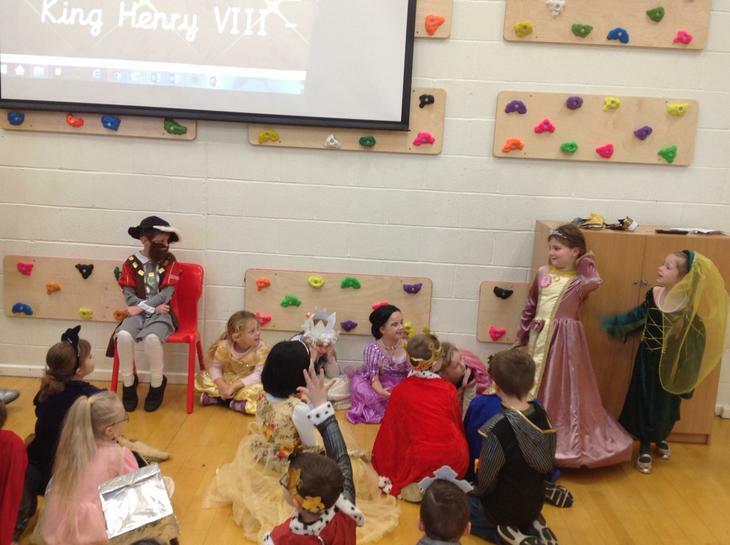 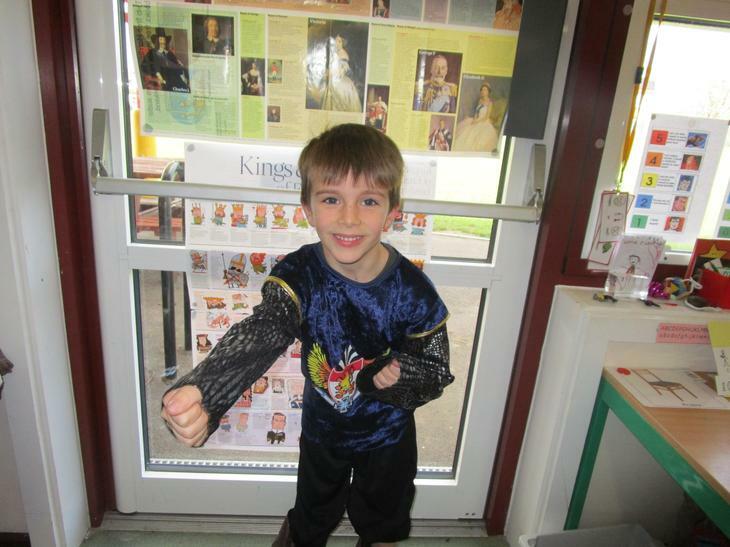 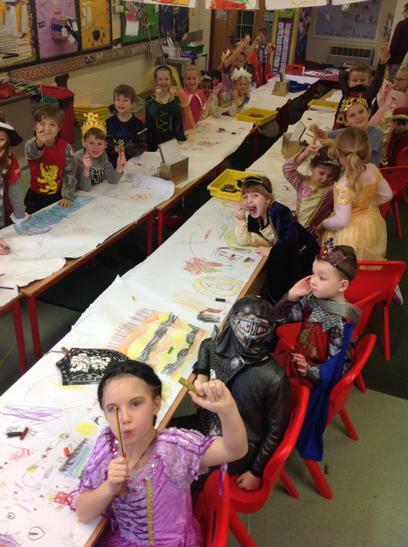 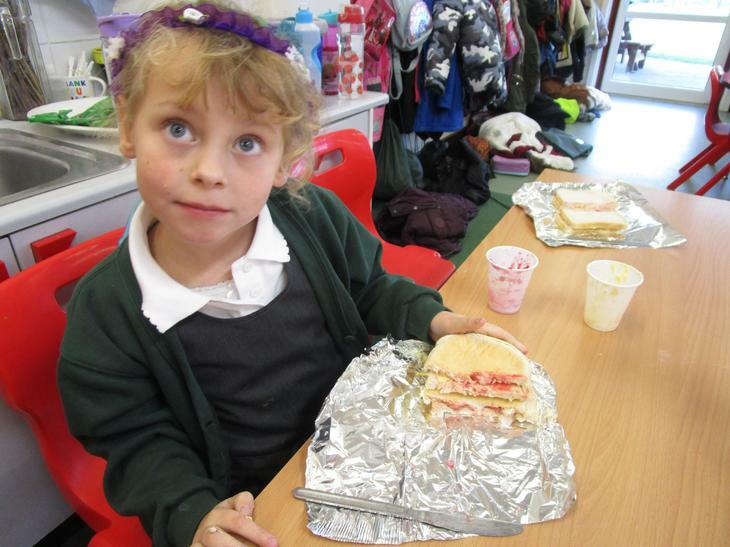 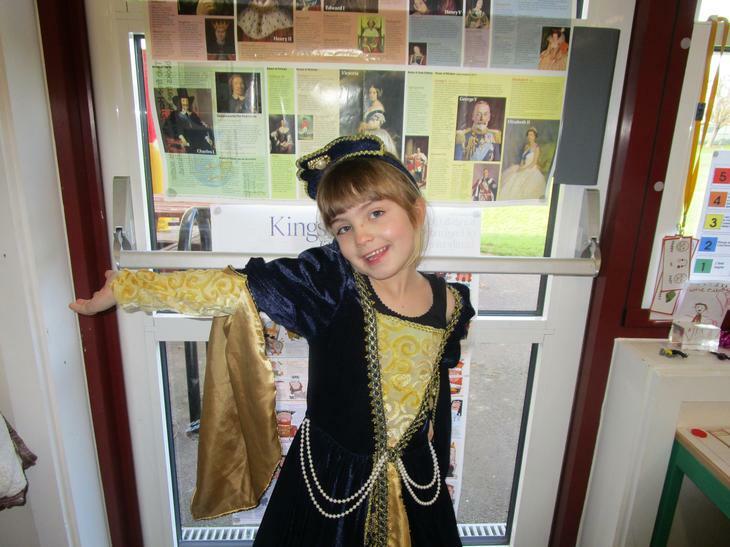 Year 2 Kings and Queens Topic Day! 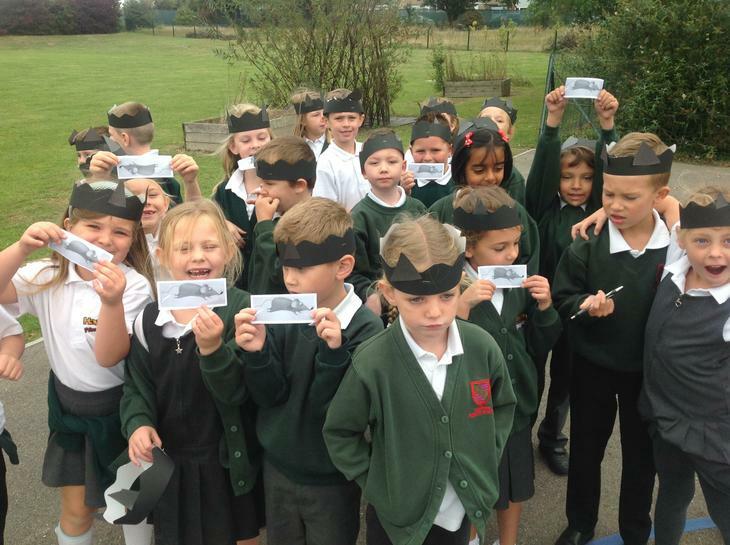 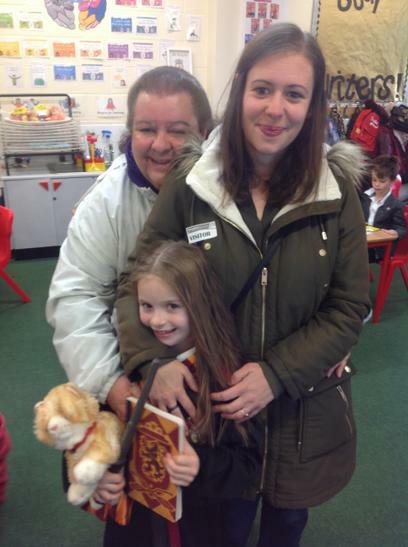 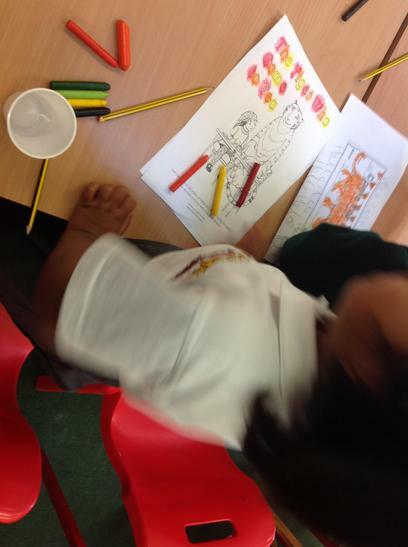 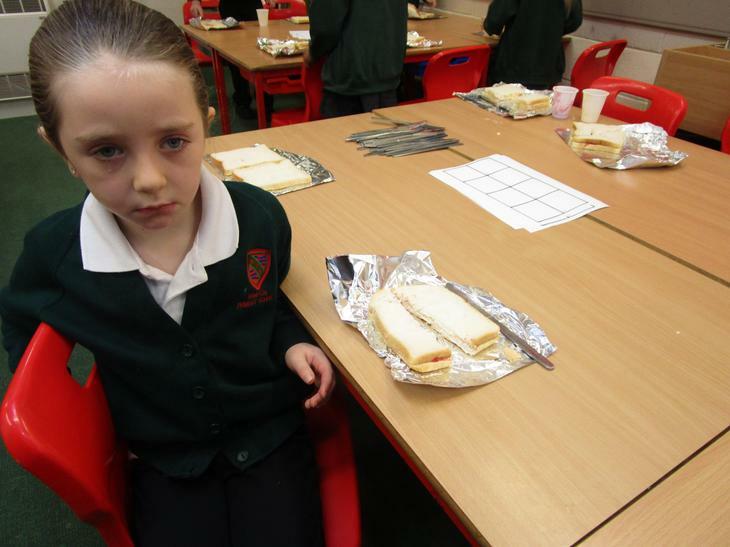 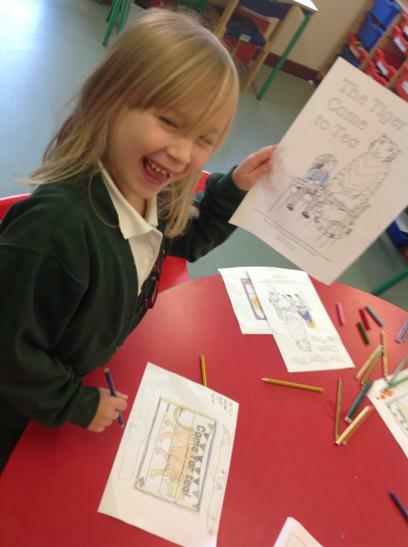 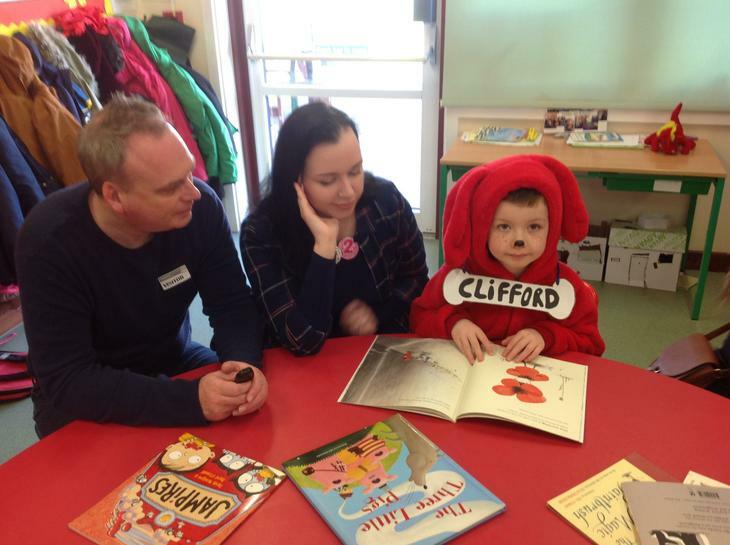 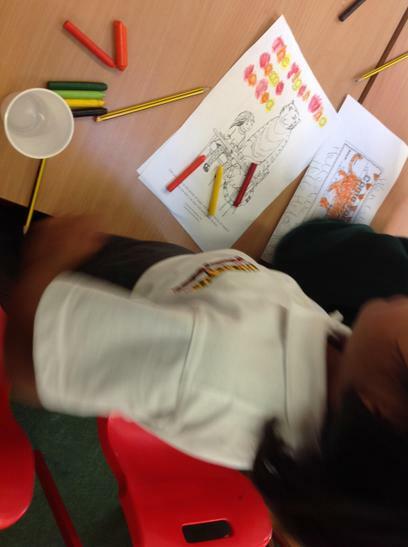 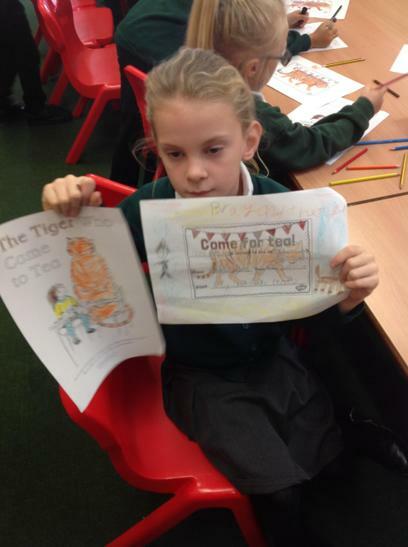 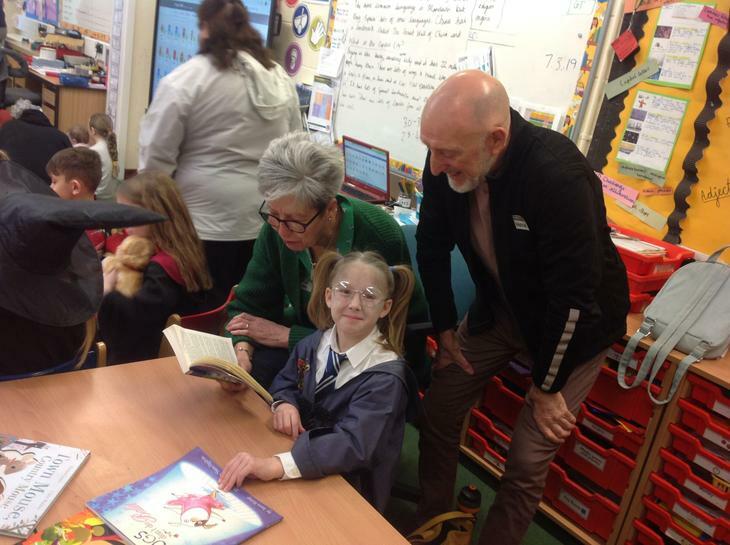 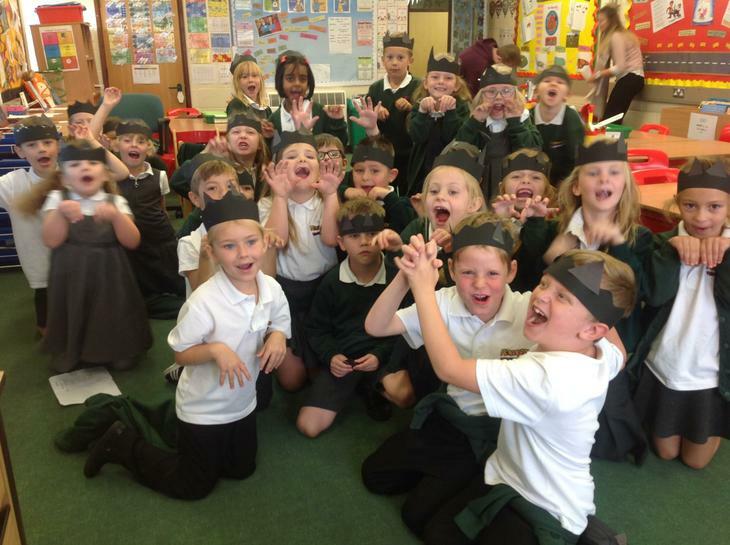 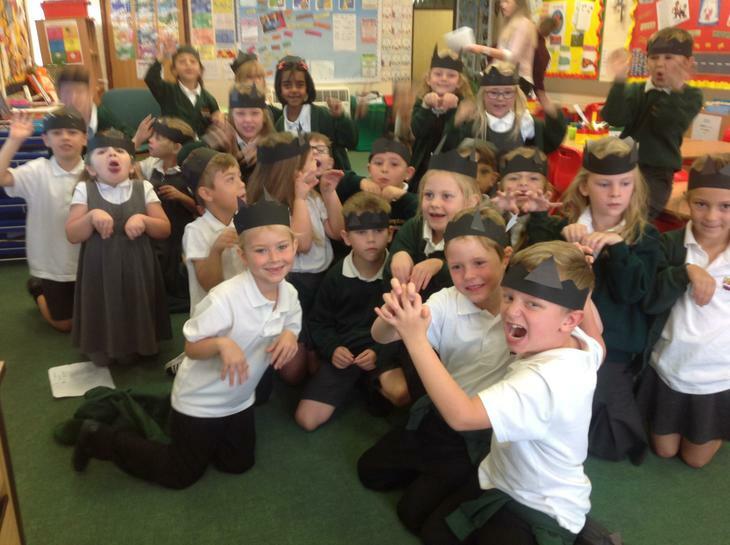 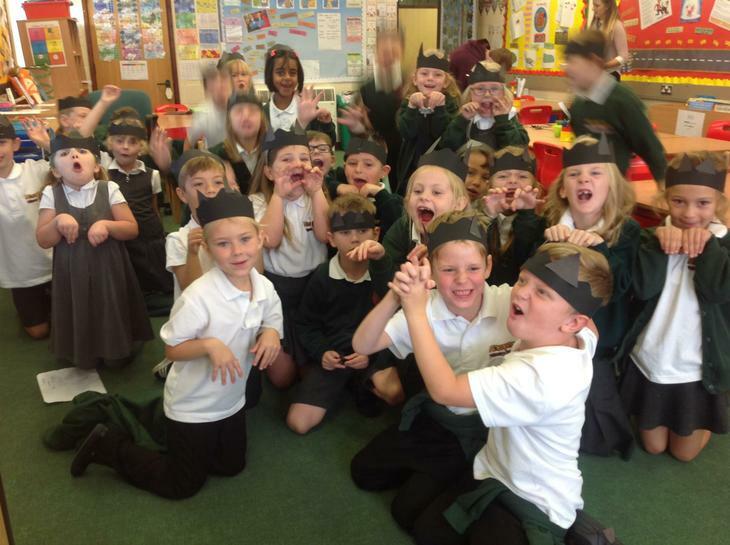 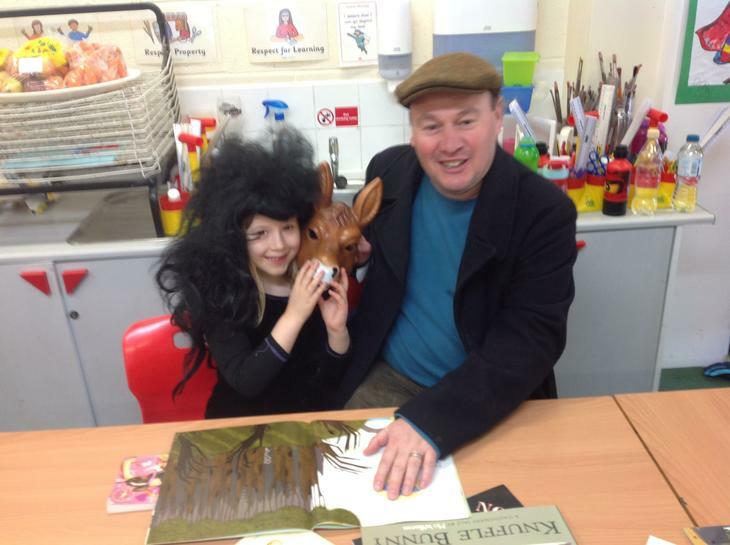 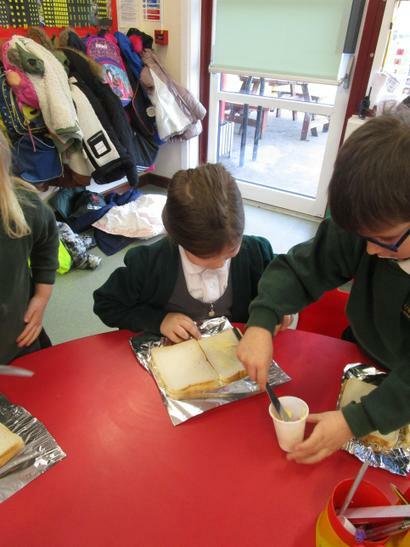 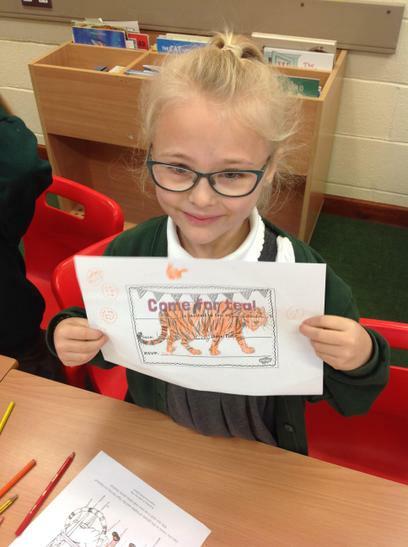 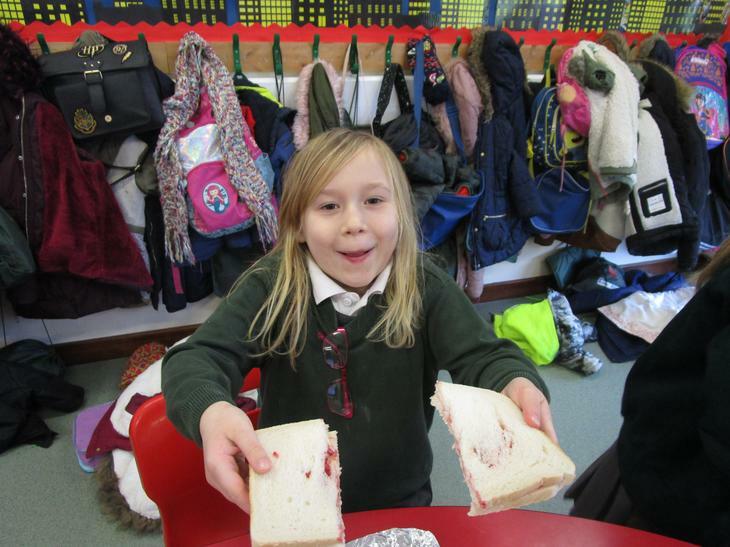 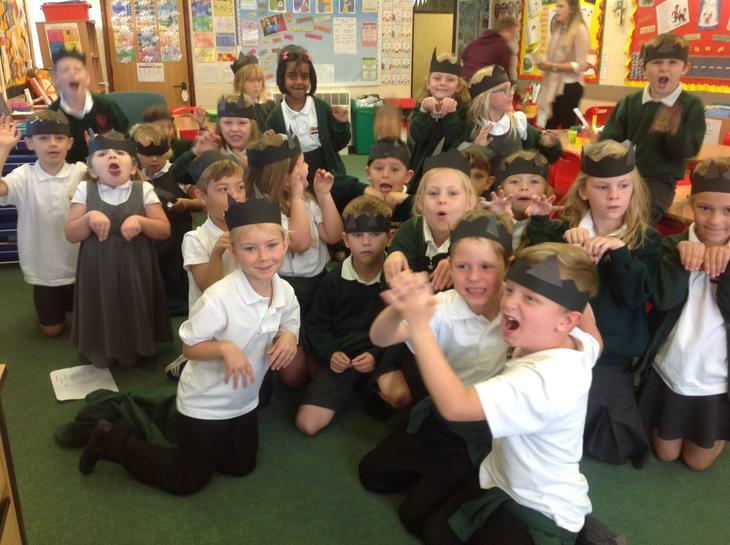 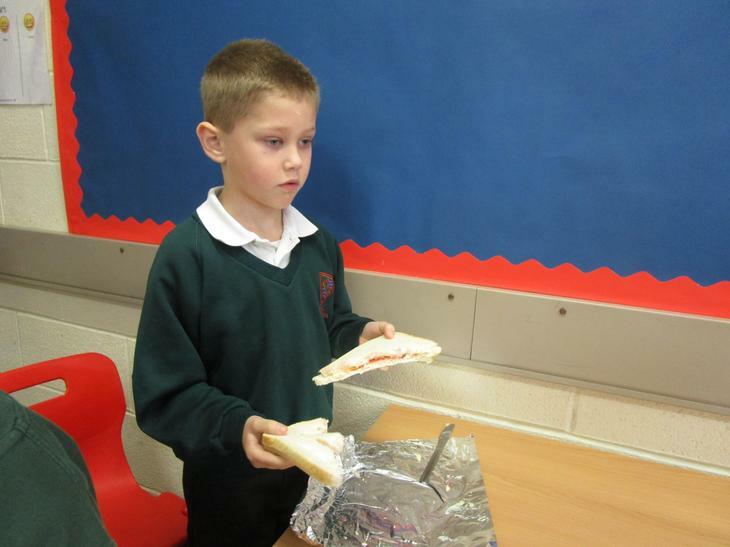 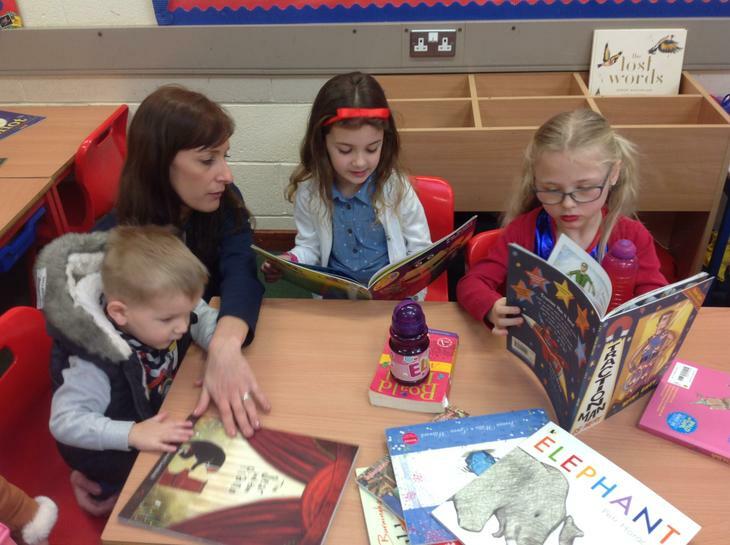 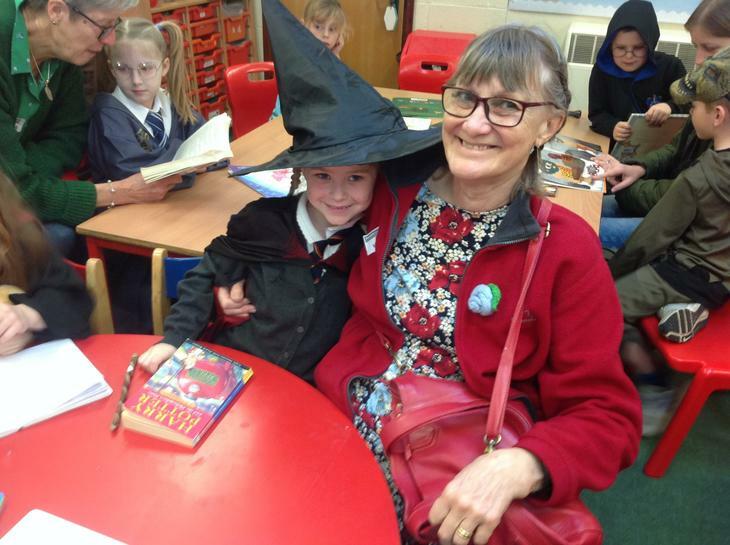 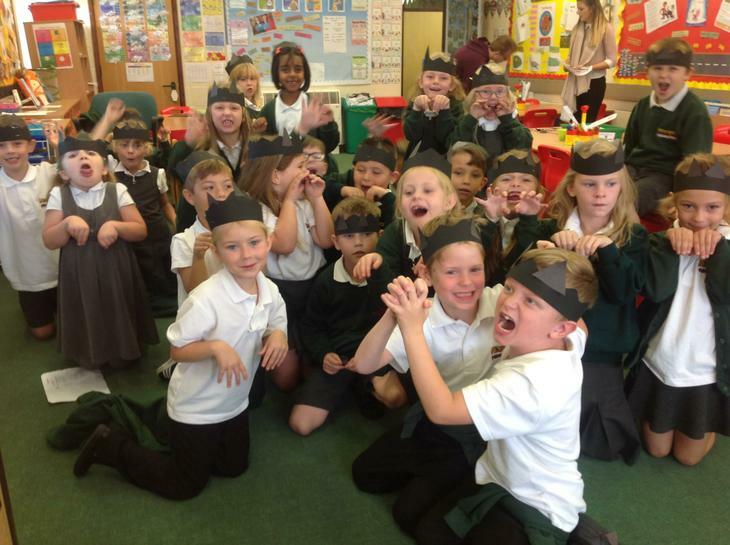 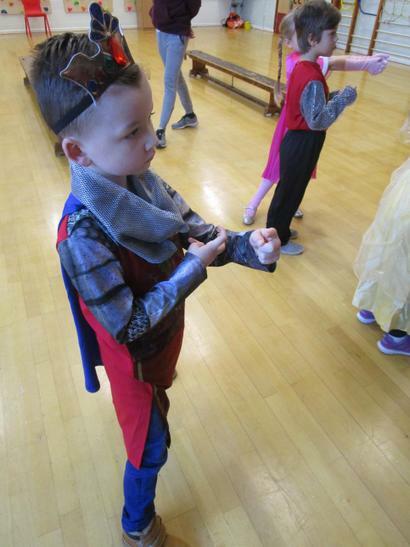 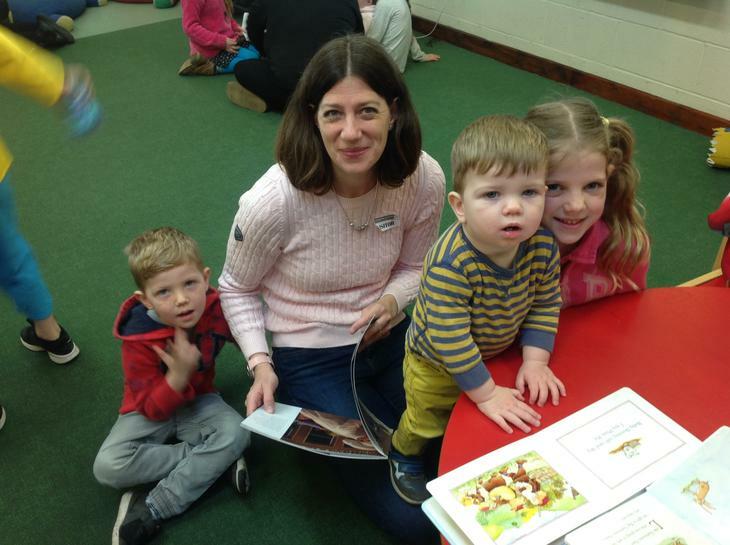 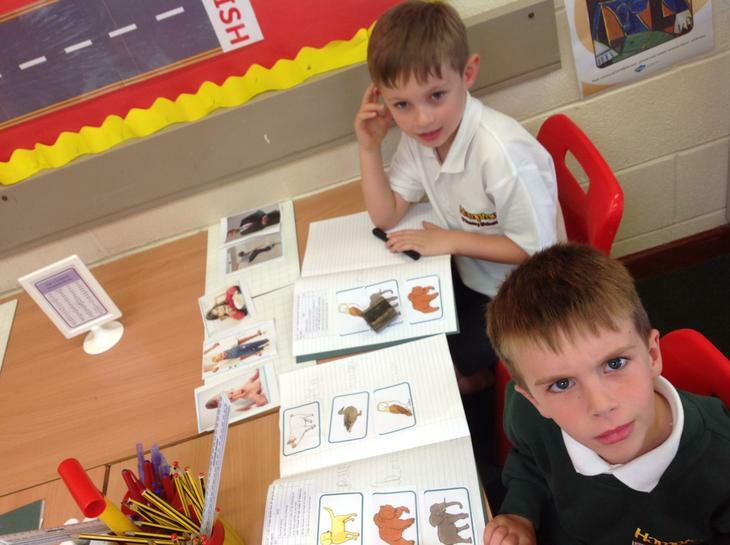 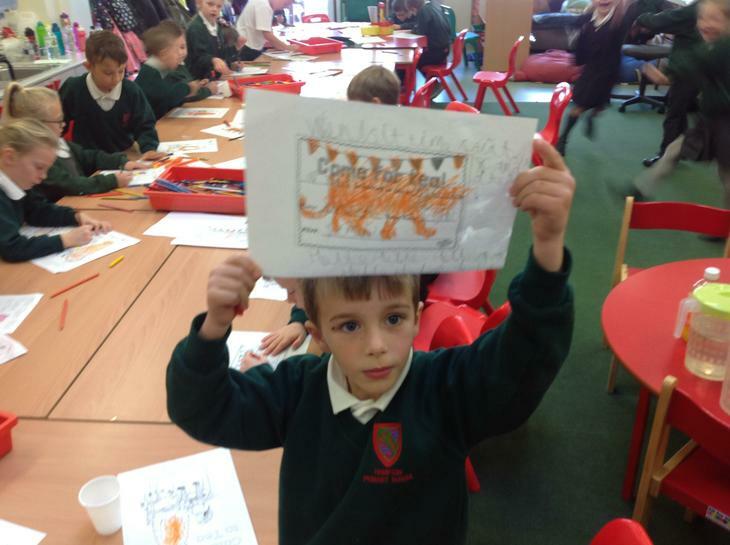 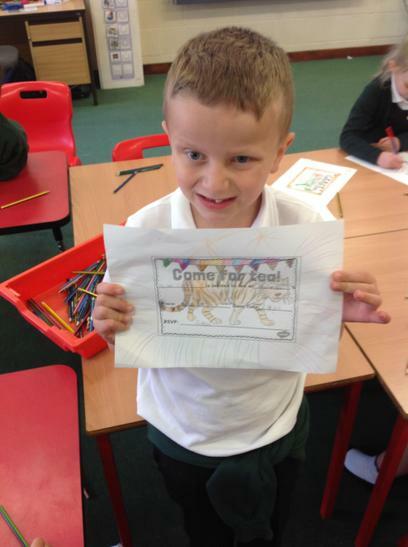 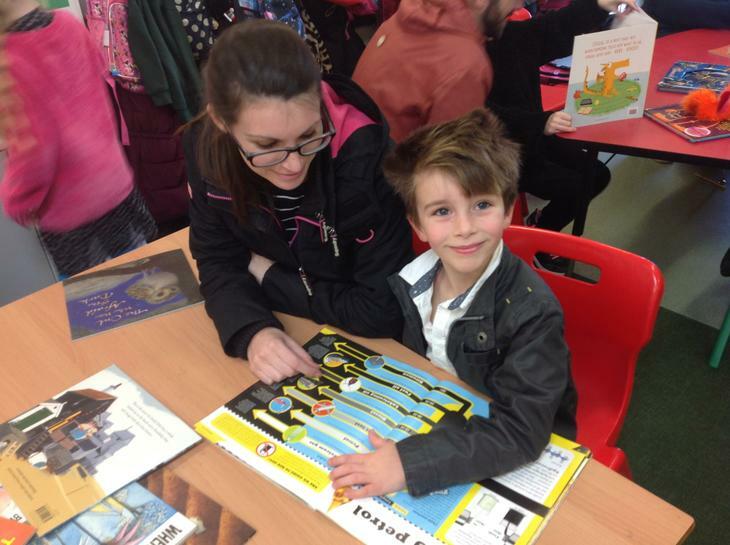 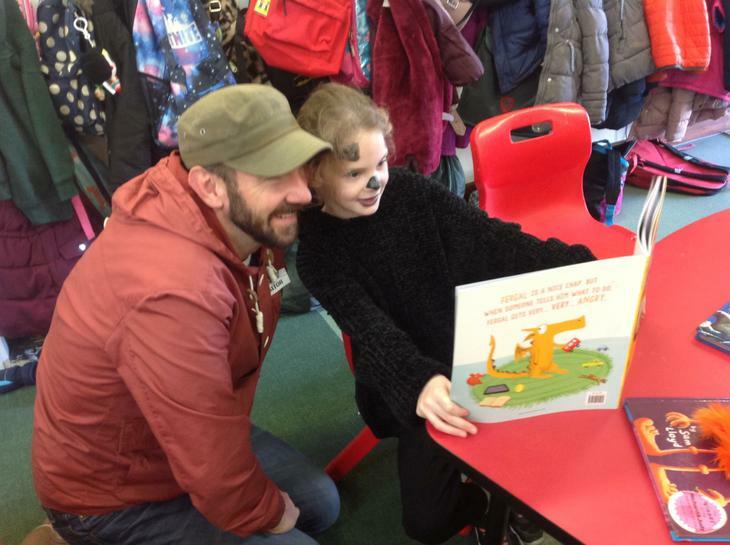 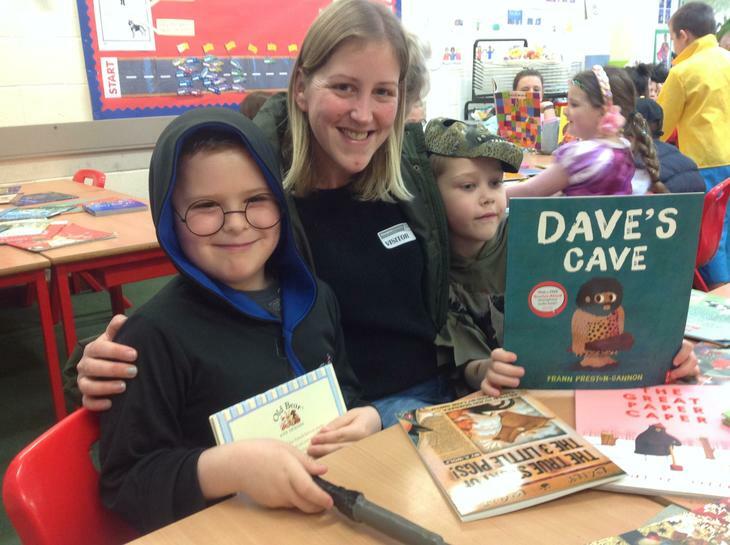 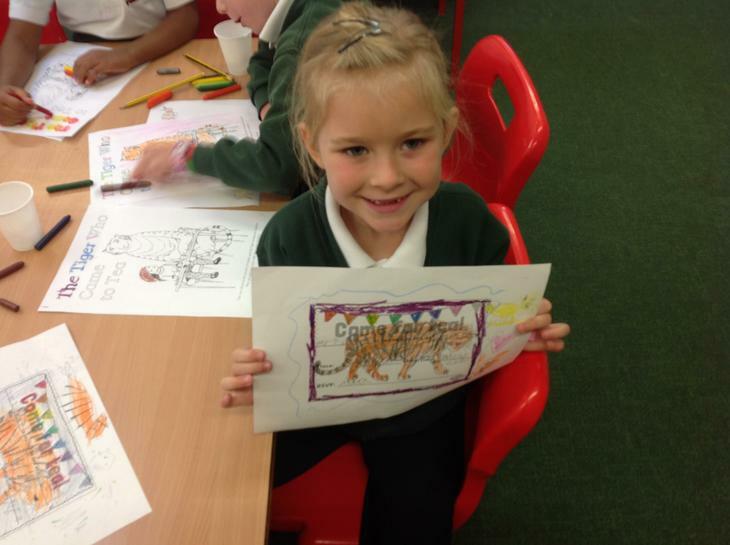 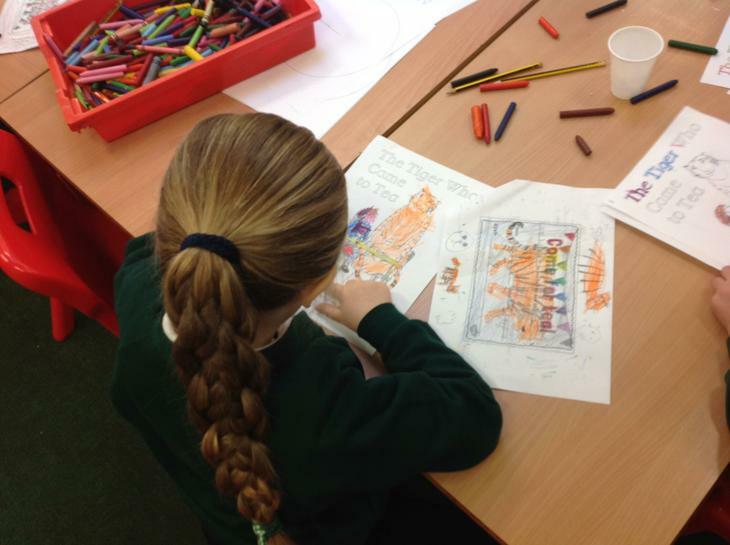 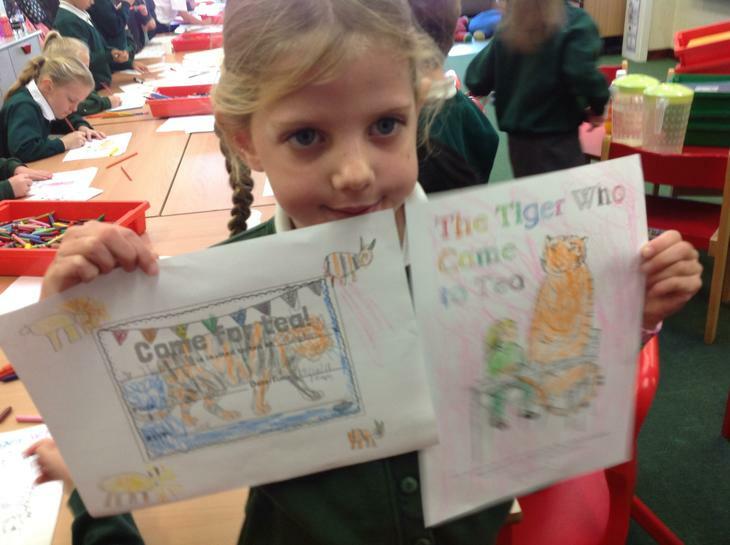 'The Tiger Who Came to Tea' Experience Lesson! 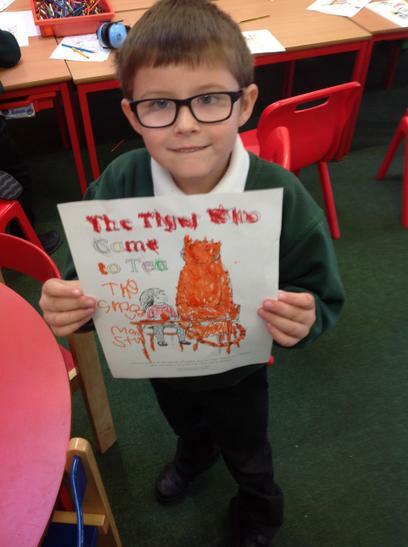 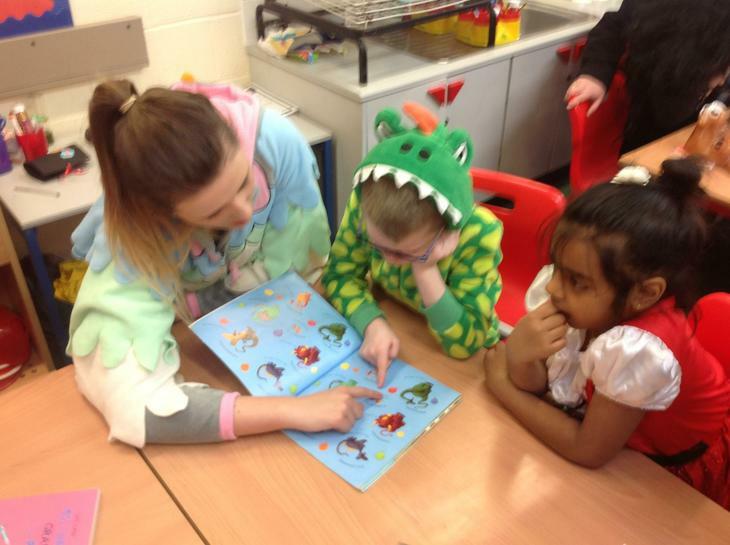 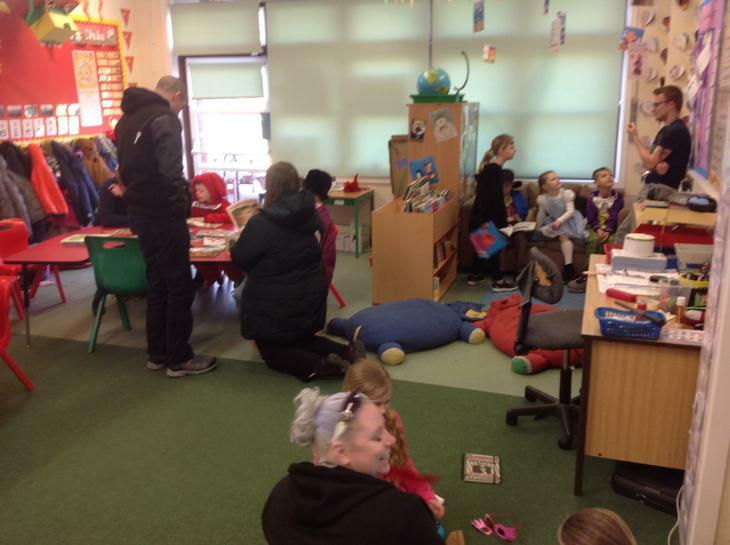 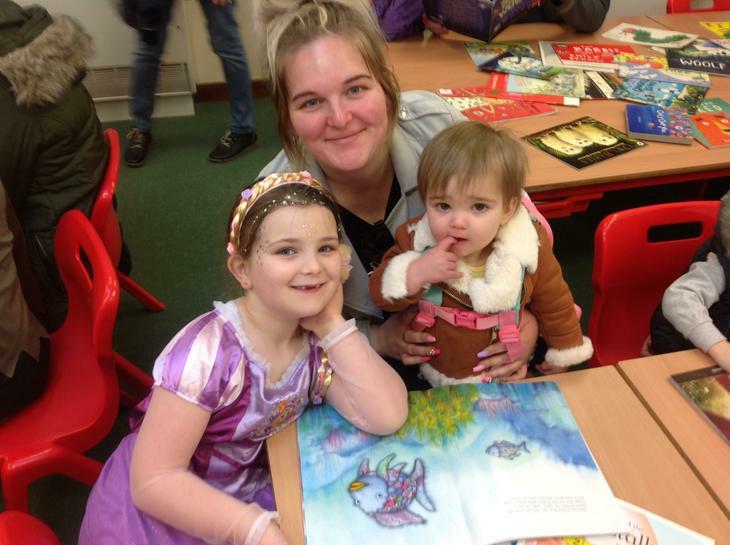 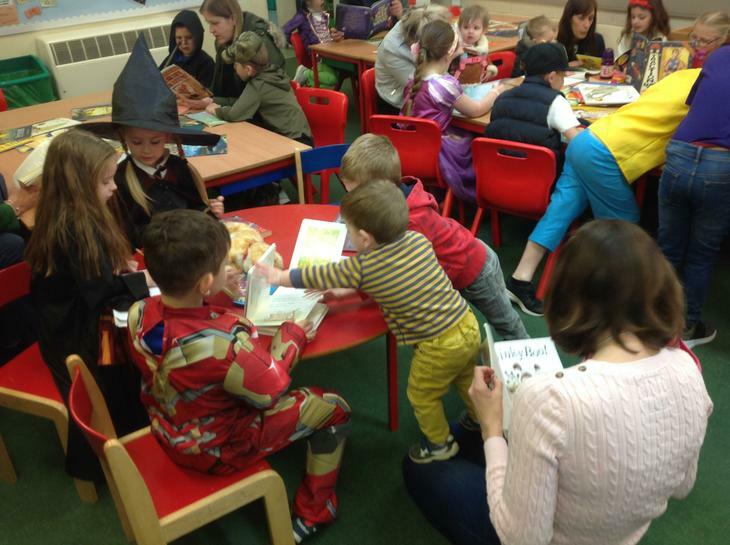 As part of our Tiger Who Came to Tea literacy topic we started by reading the story and having our very own tea party in class! 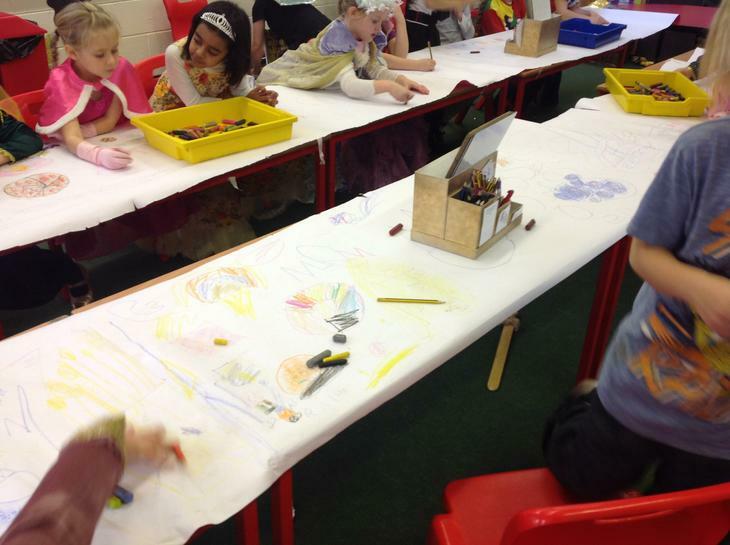 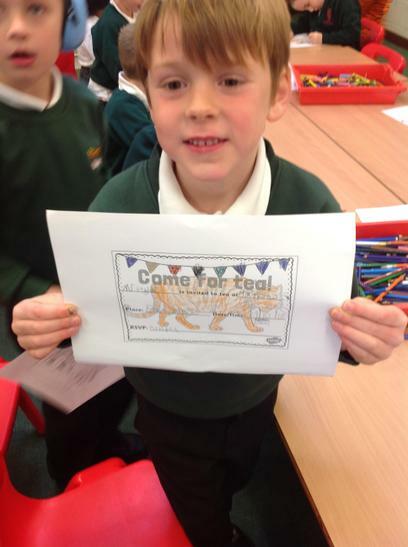 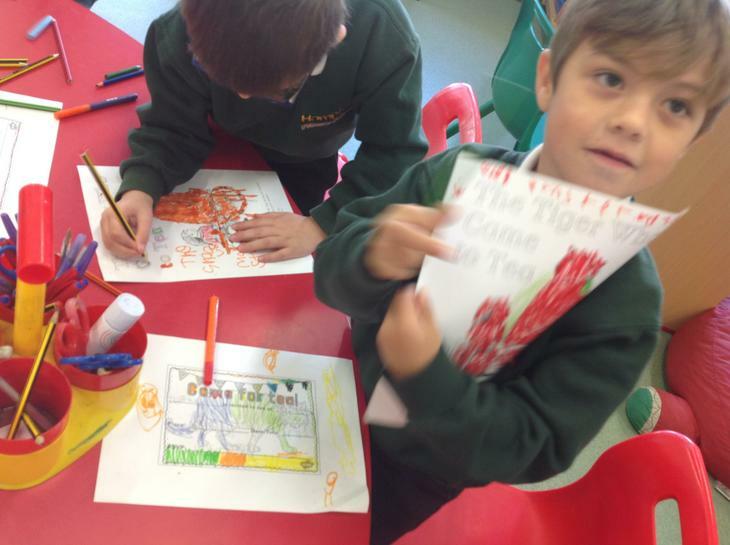 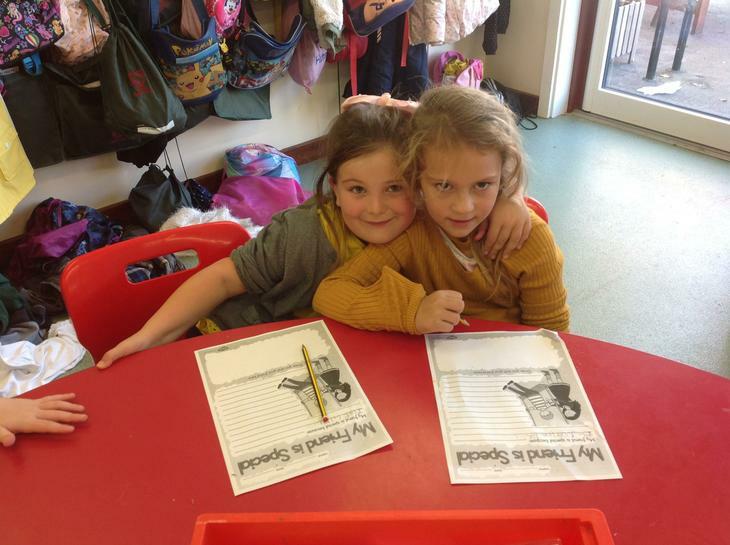 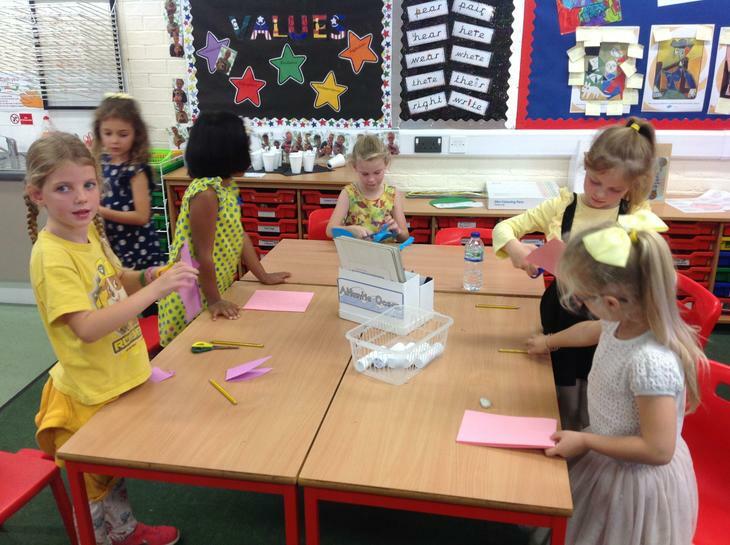 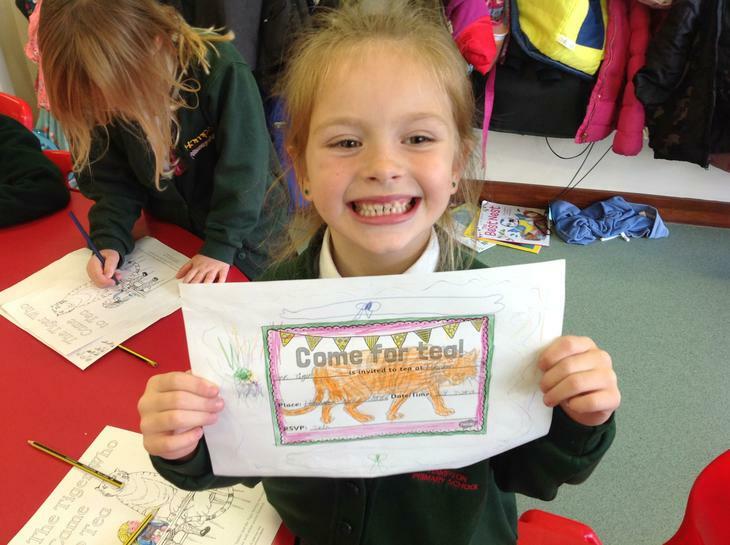 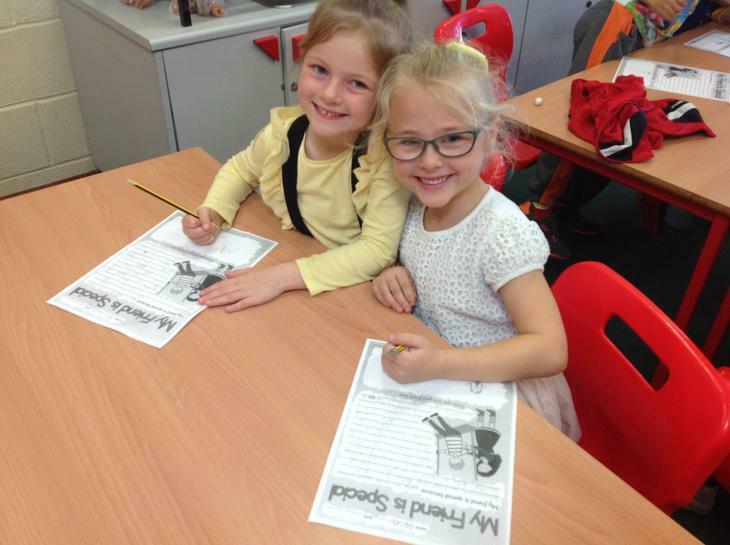 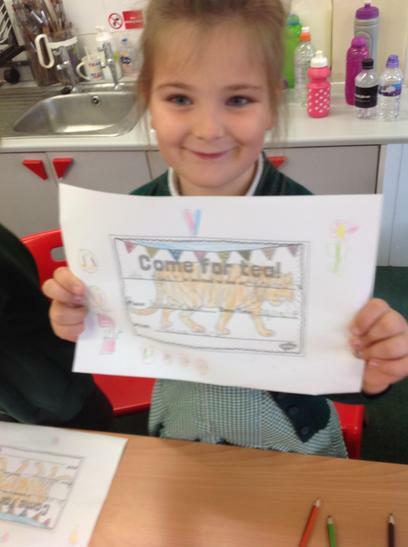 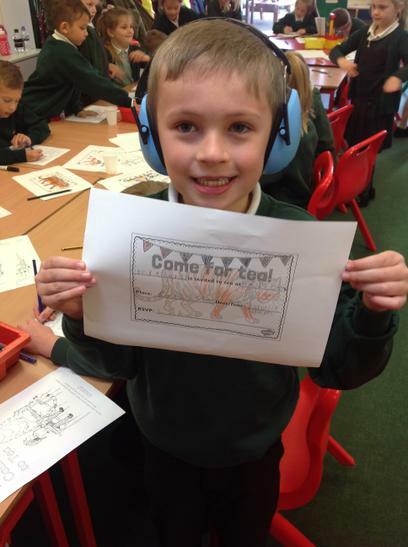 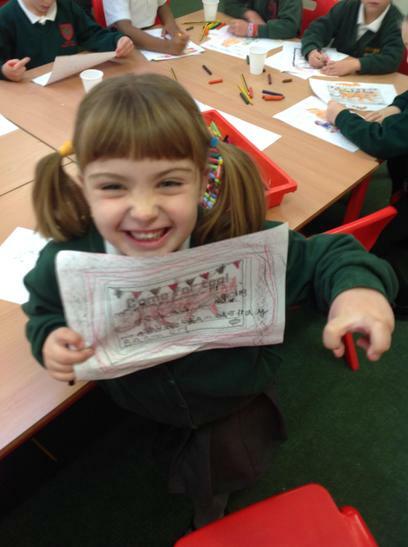 We created invitations to ask the tiger to come to our tea party. 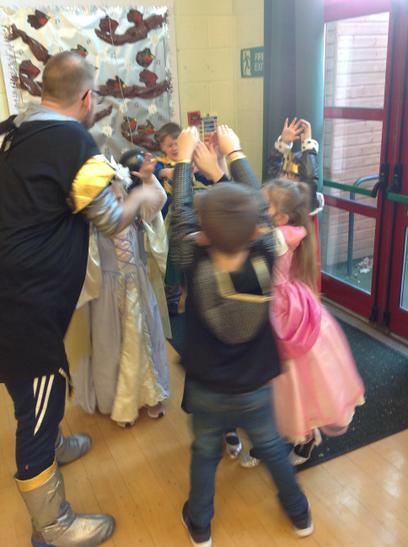 Mr W dressed up as a tiger and surprised us! 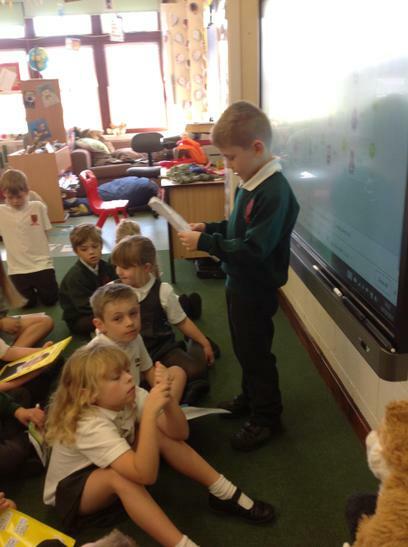 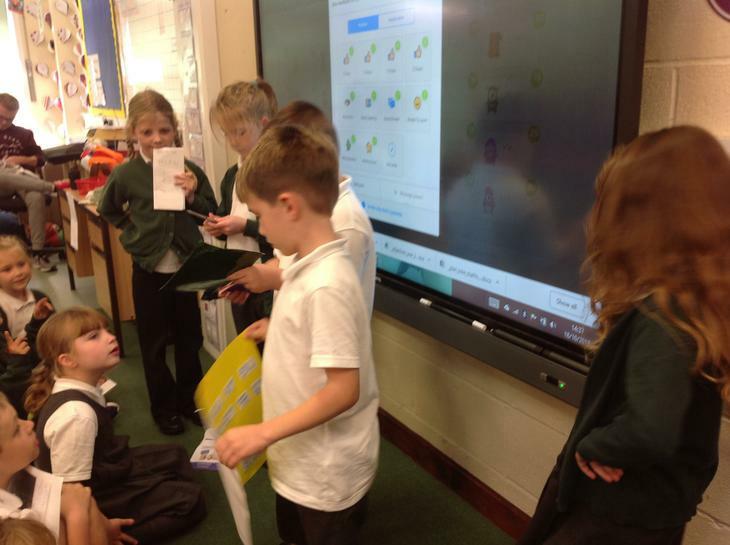 We shared our 'Ourselves' challenge work with our friends in class, explaining the work we had completed and answering questions from our peers. 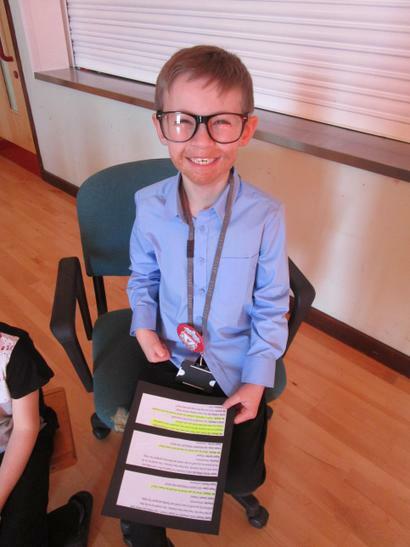 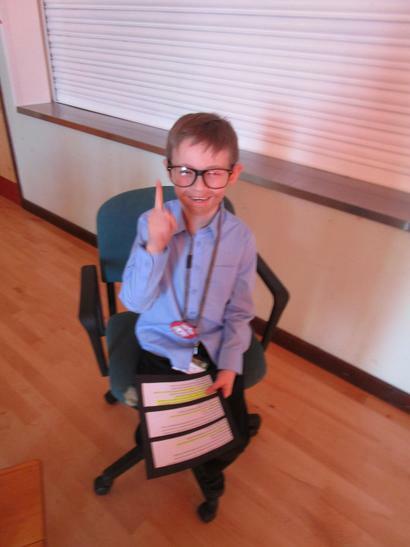 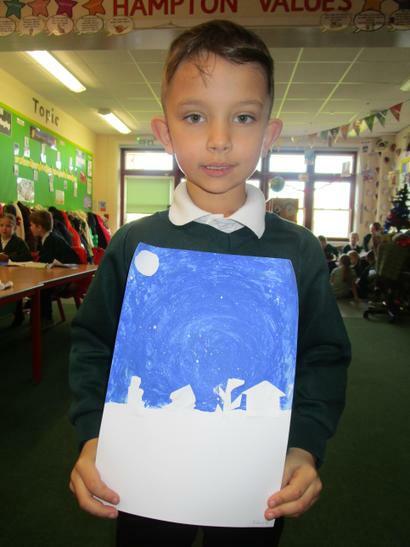 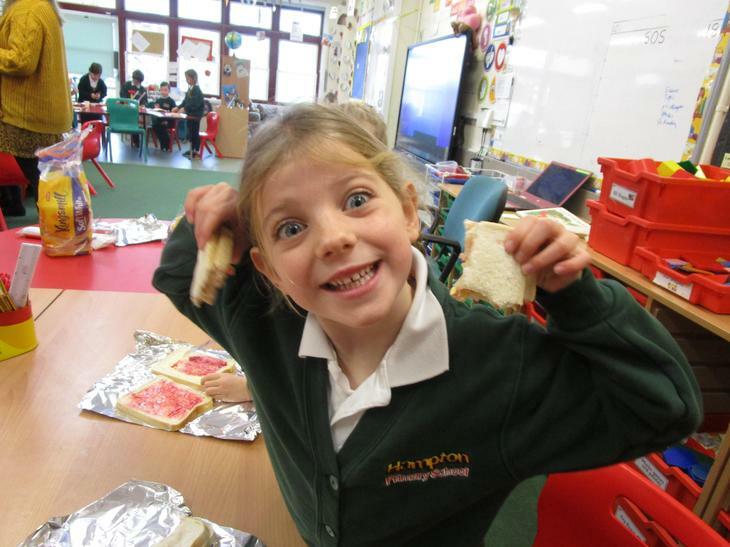 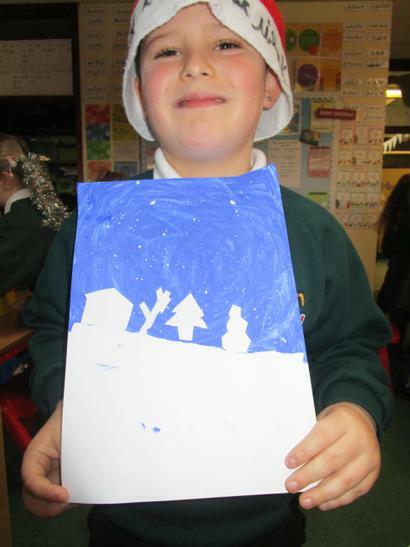 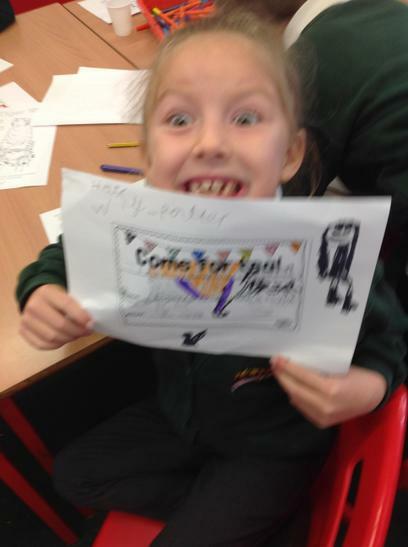 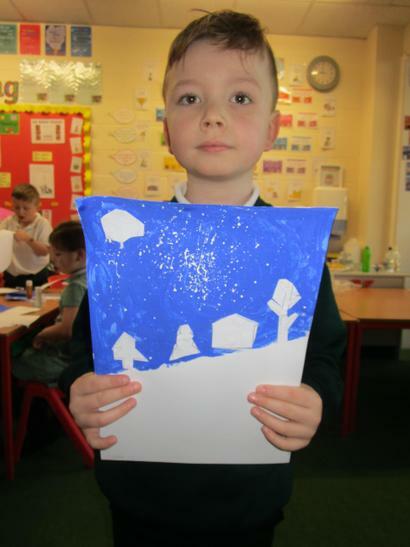 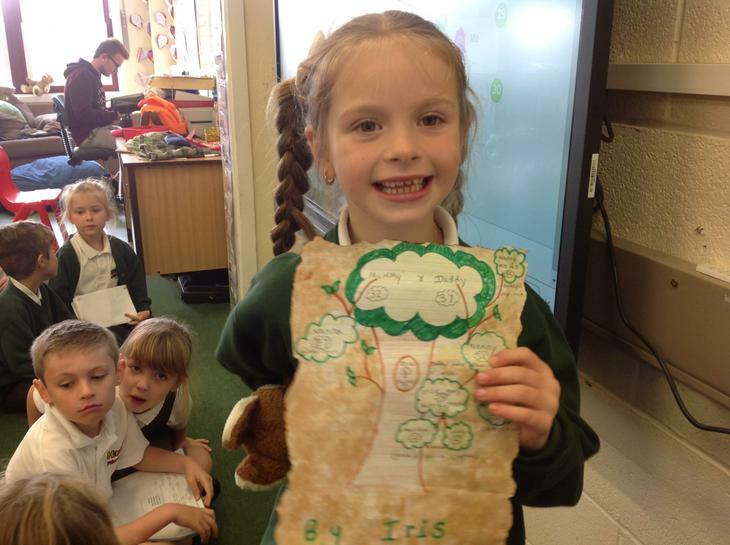 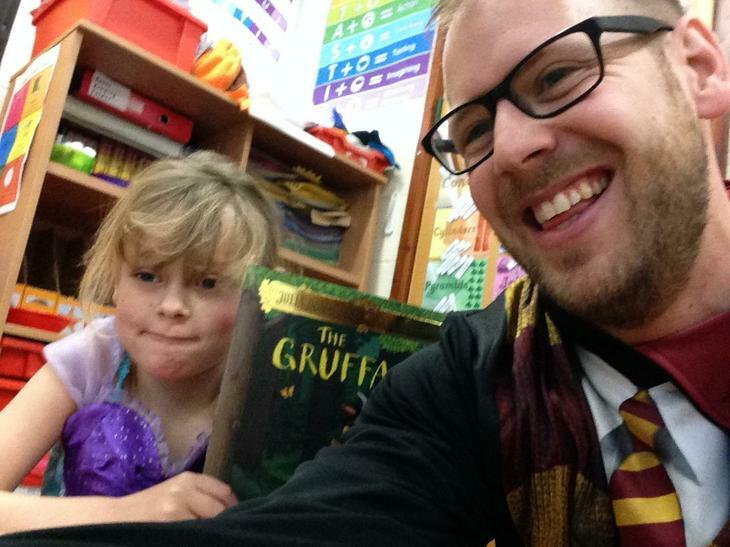 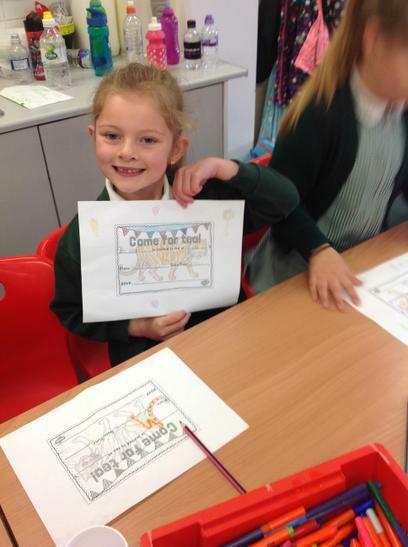 Mr W was extremely proud of our amazing projects! 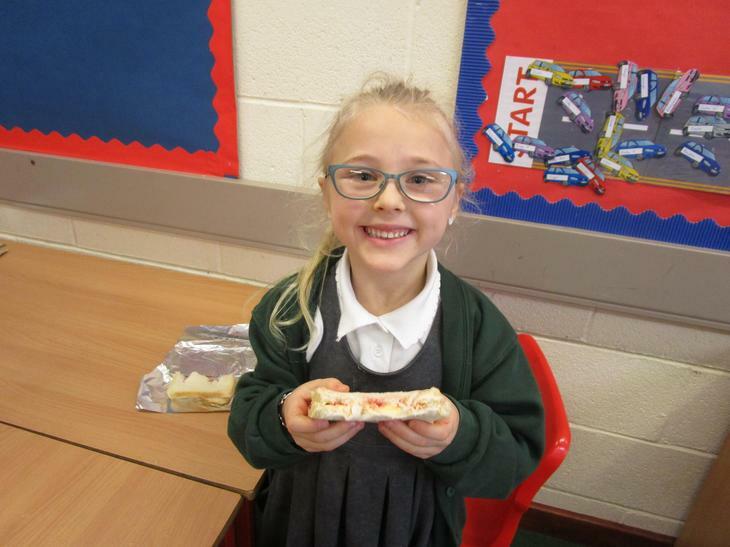 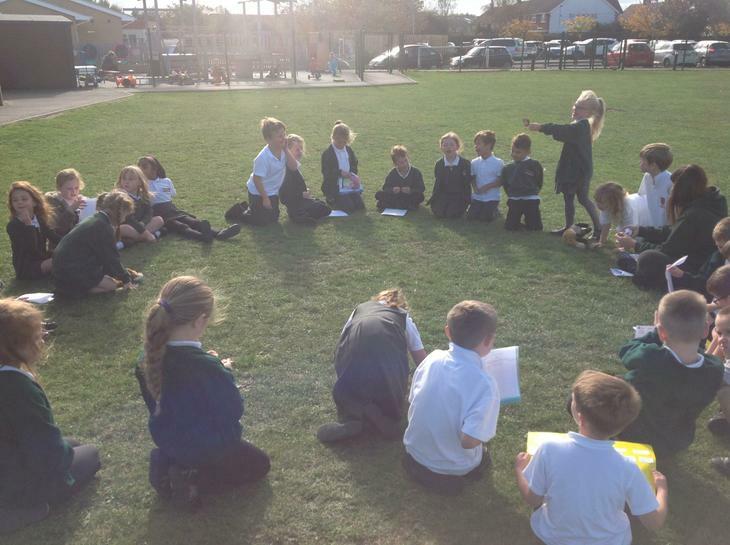 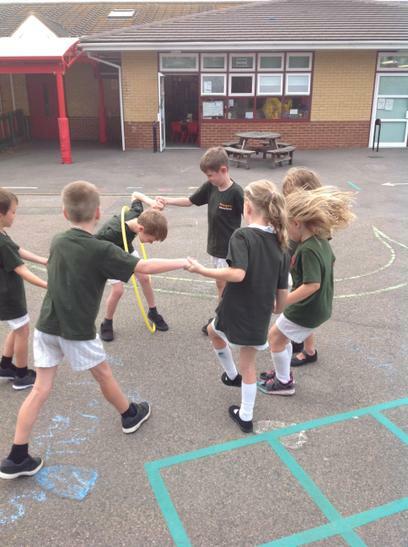 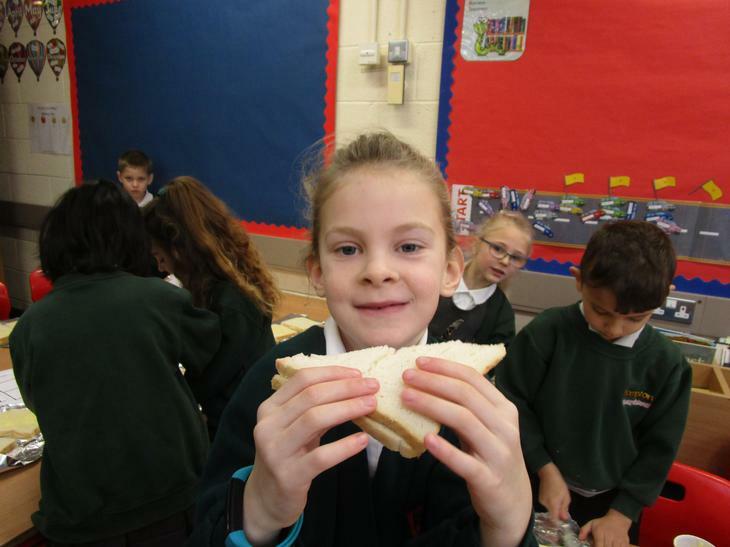 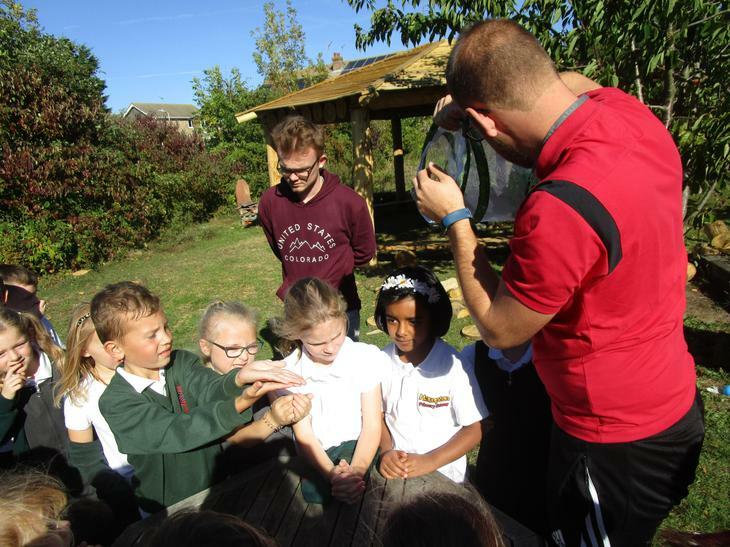 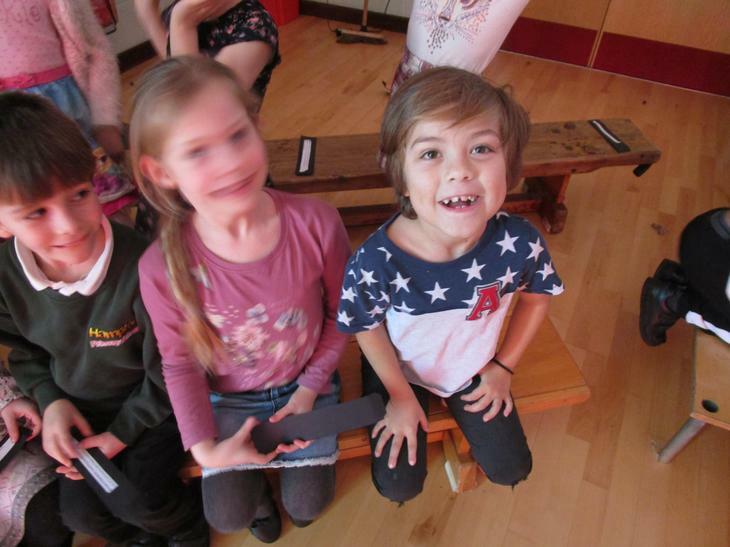 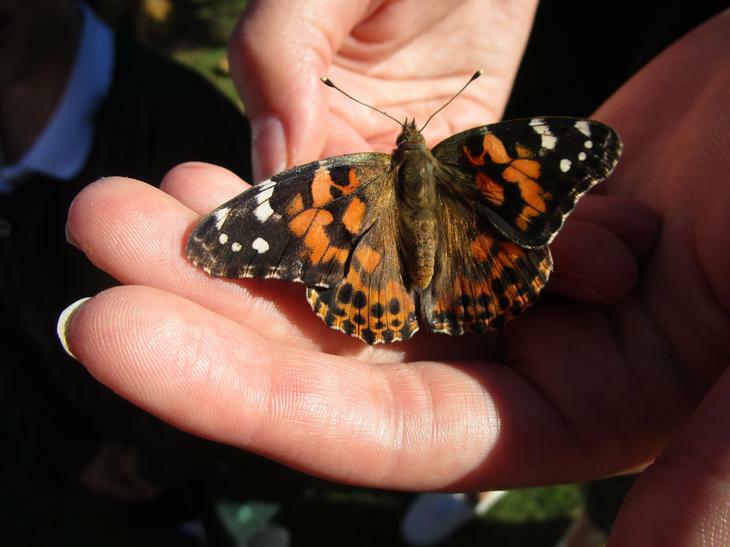 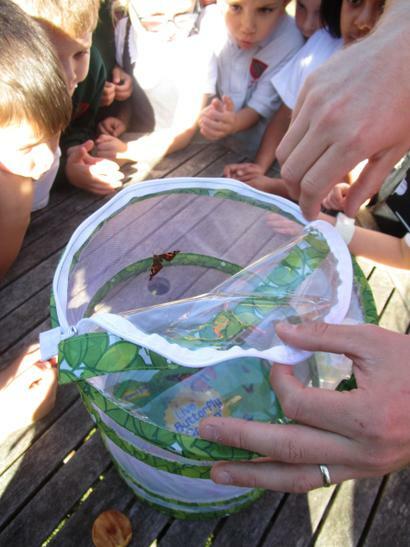 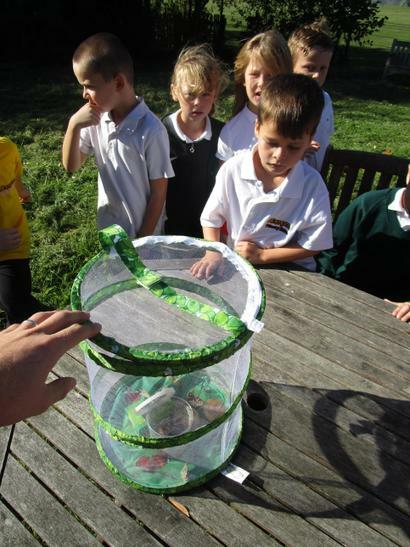 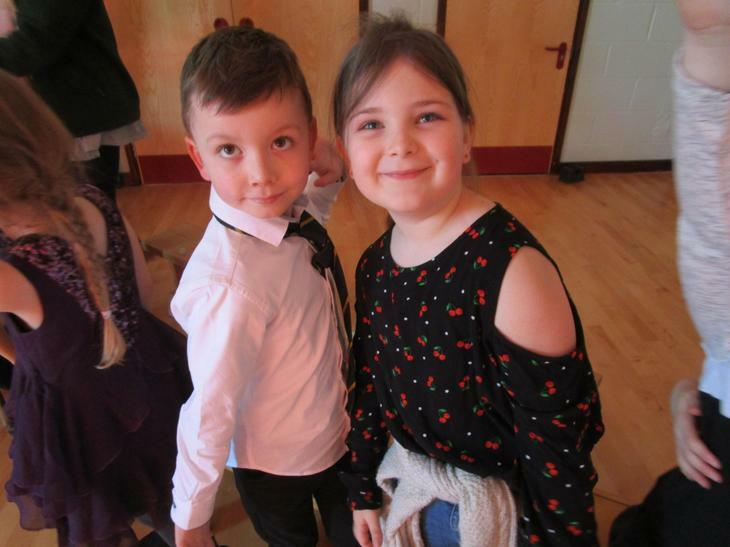 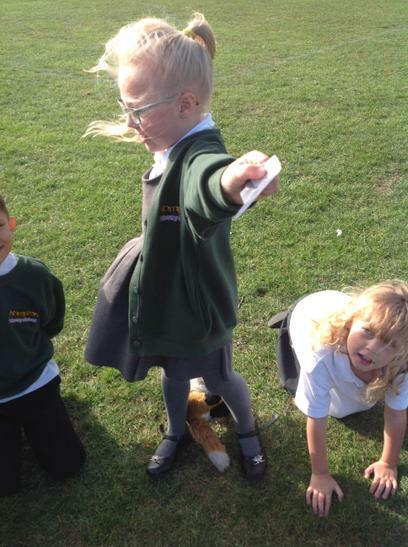 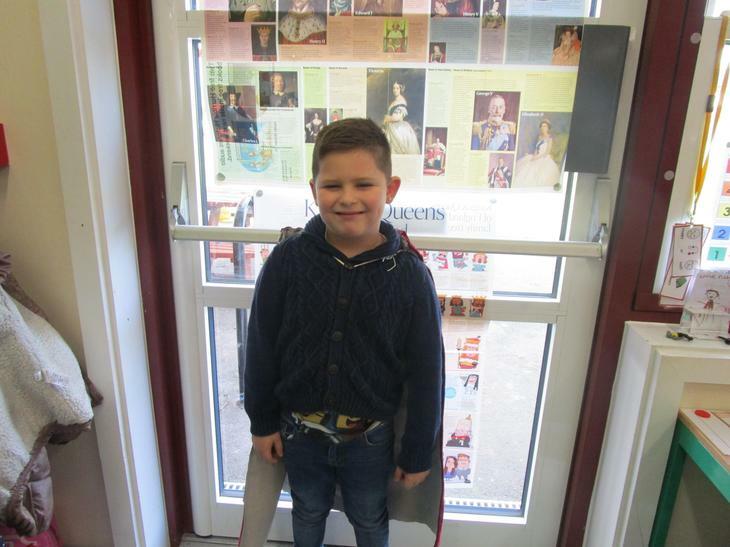 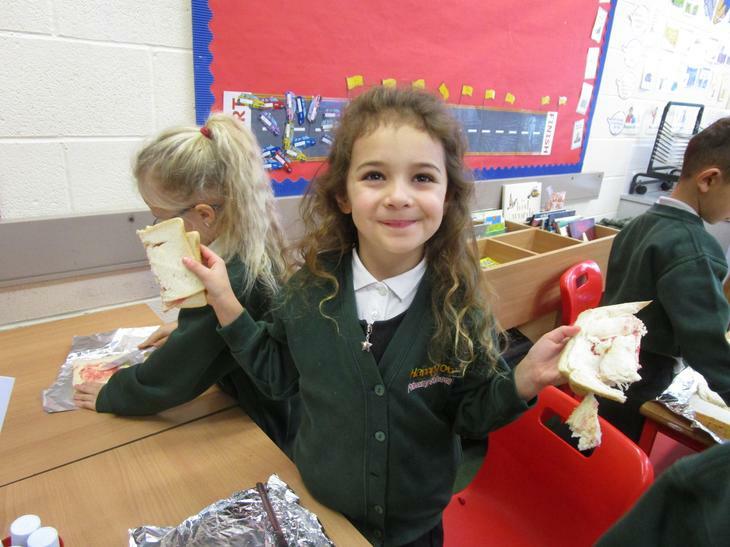 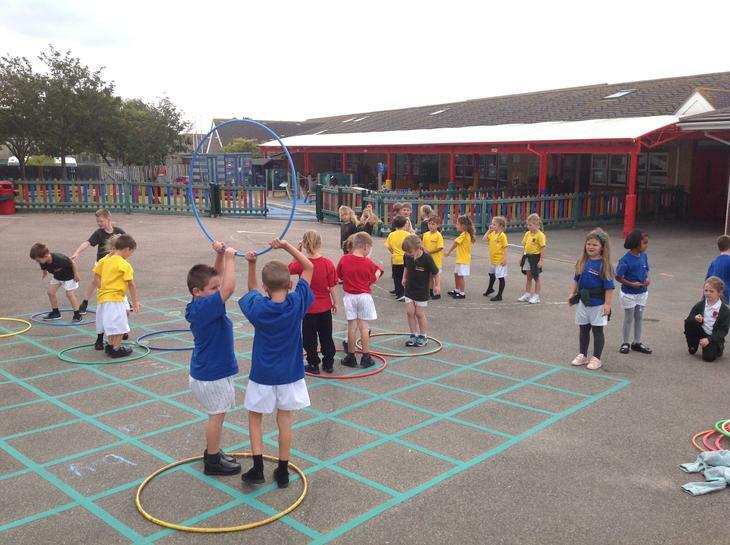 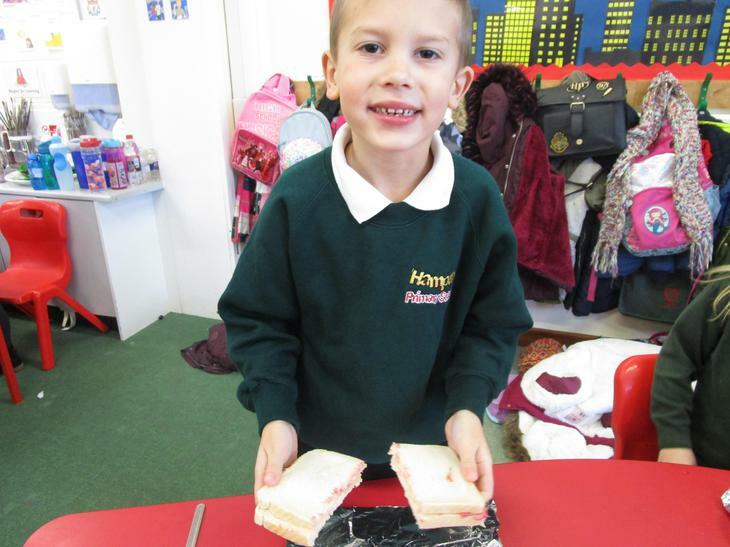 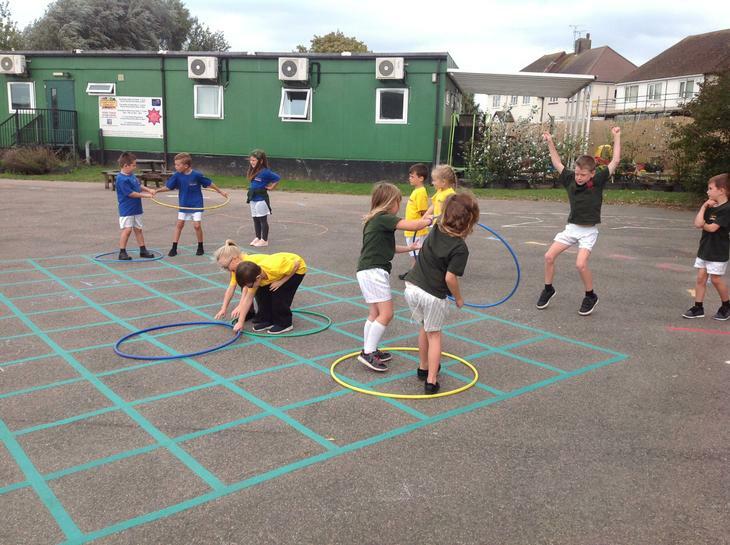 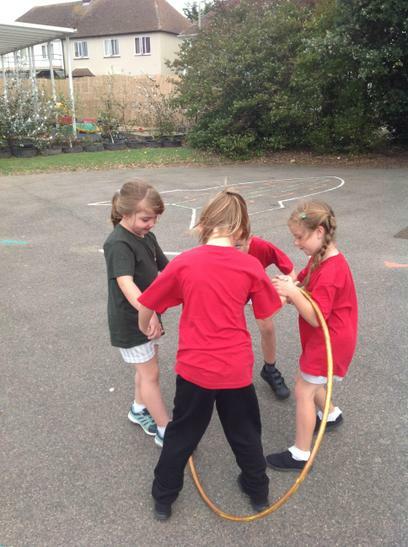 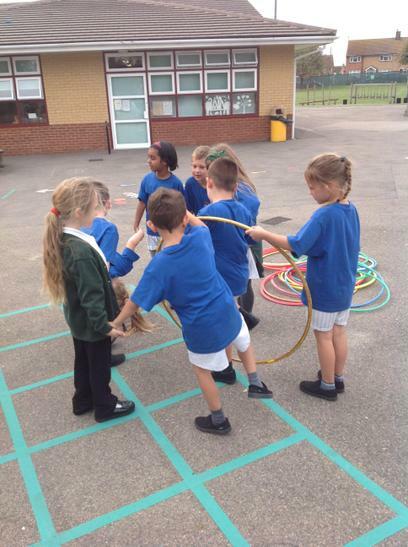 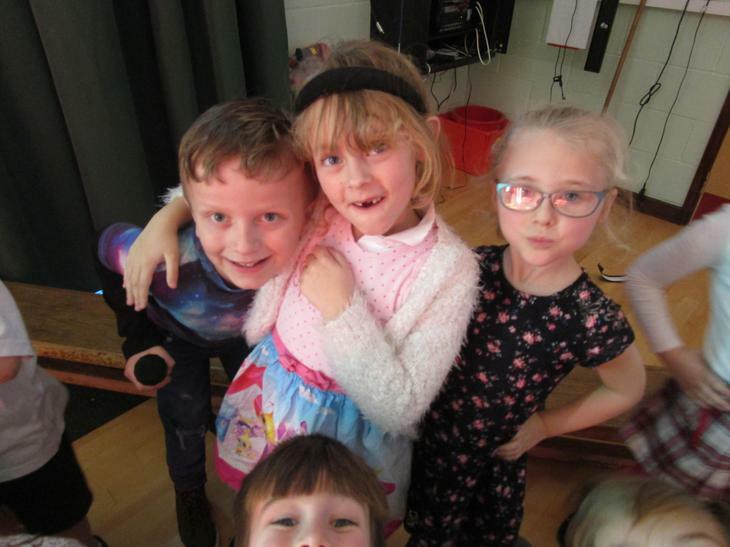 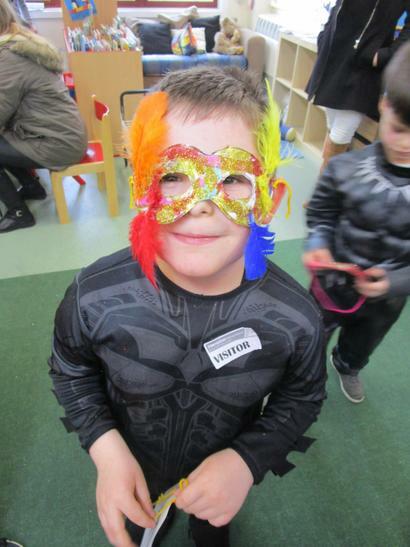 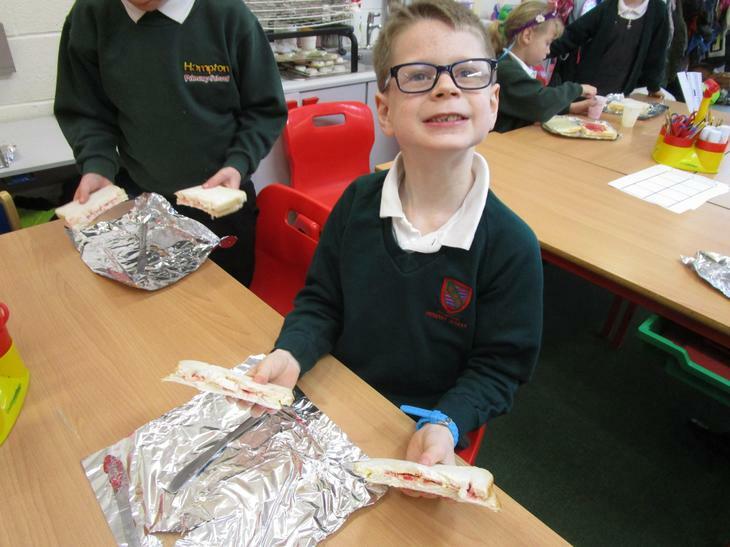 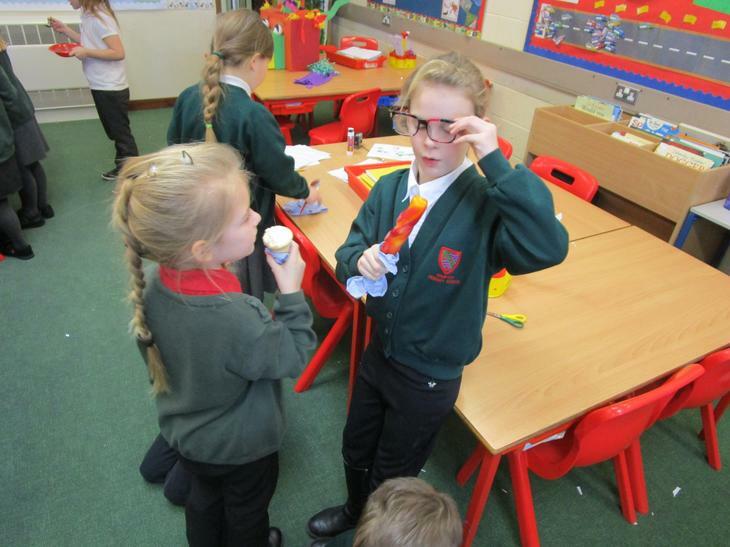 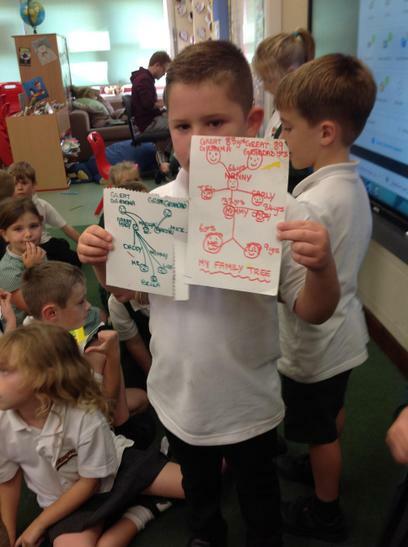 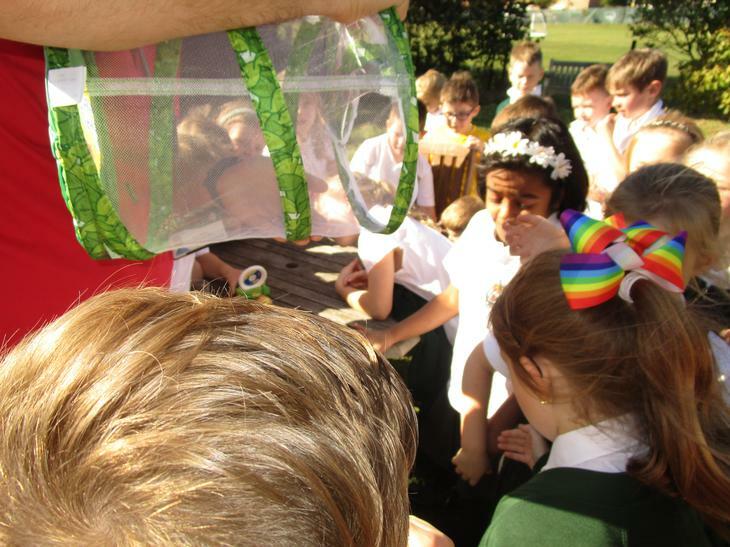 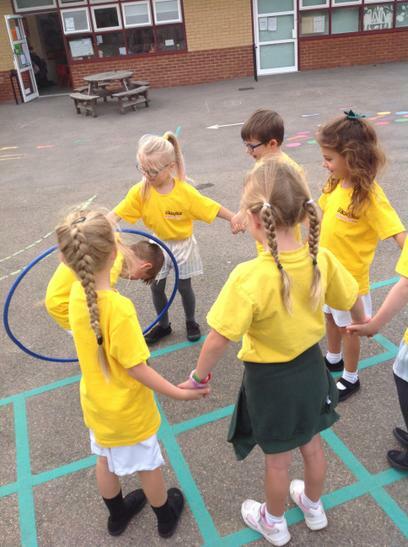 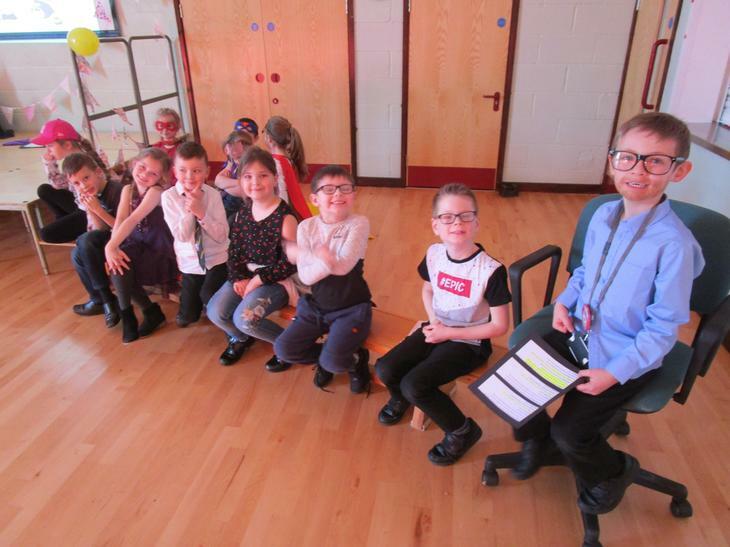 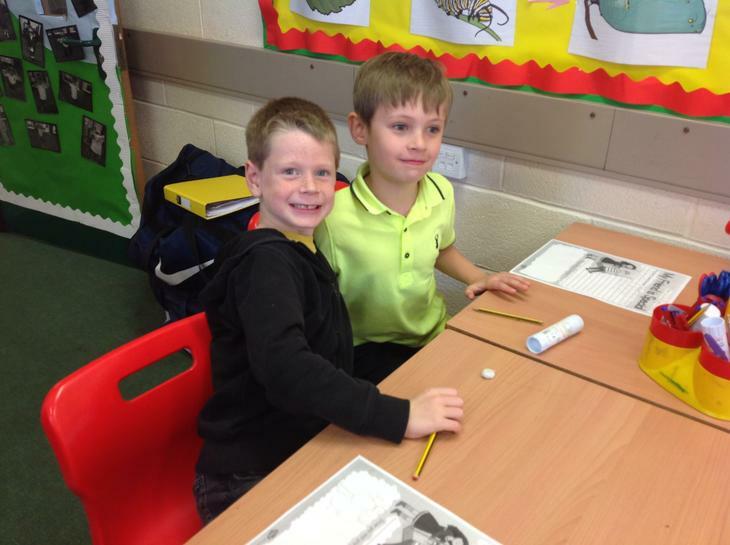 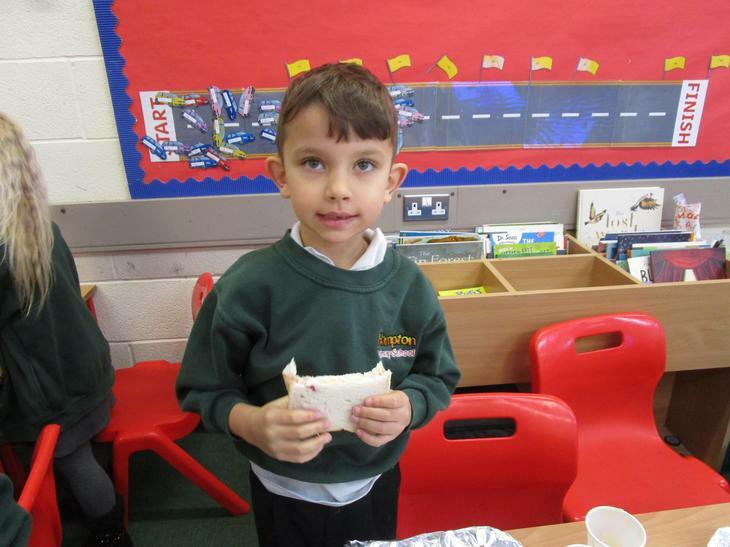 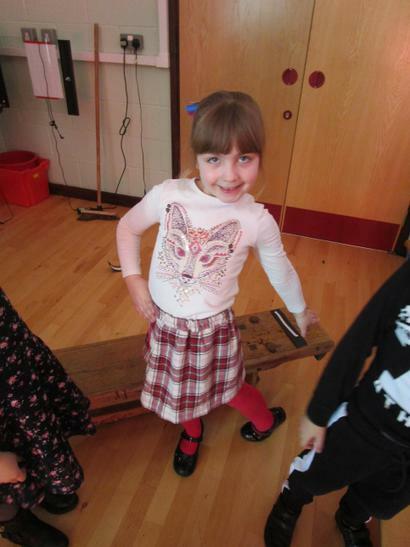 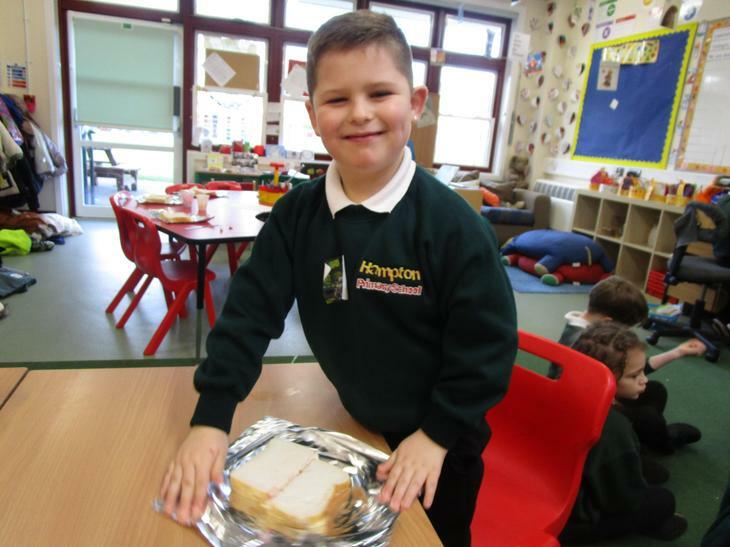 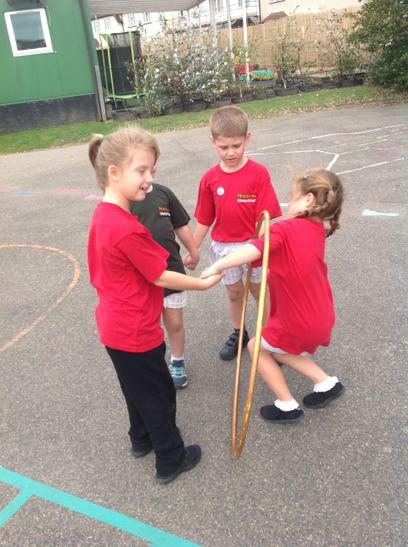 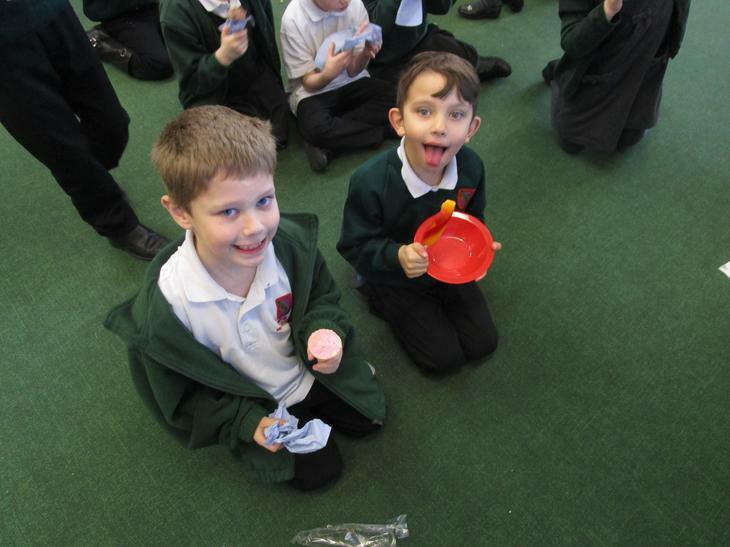 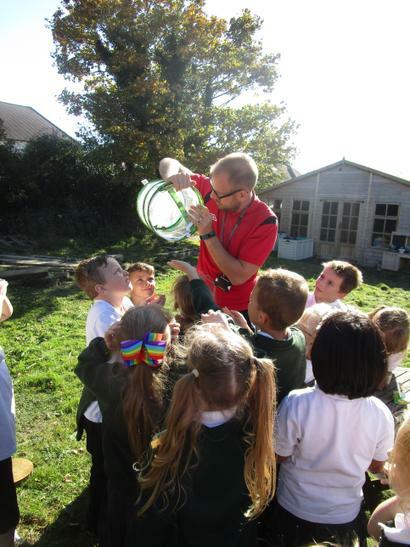 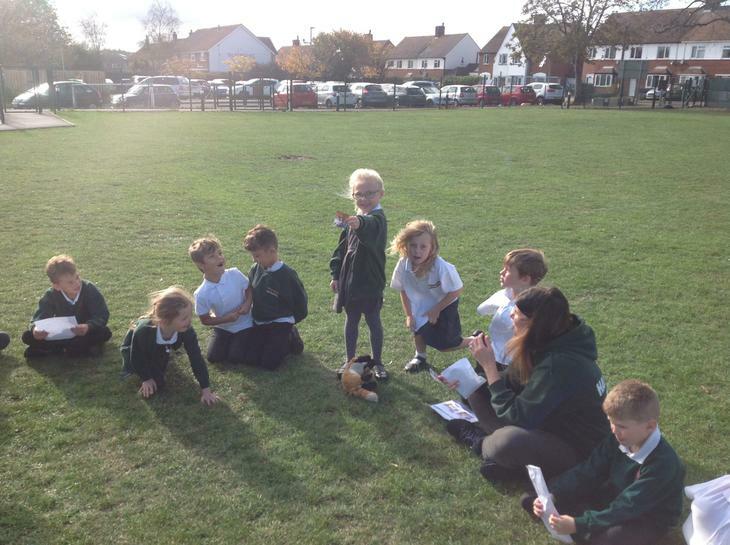 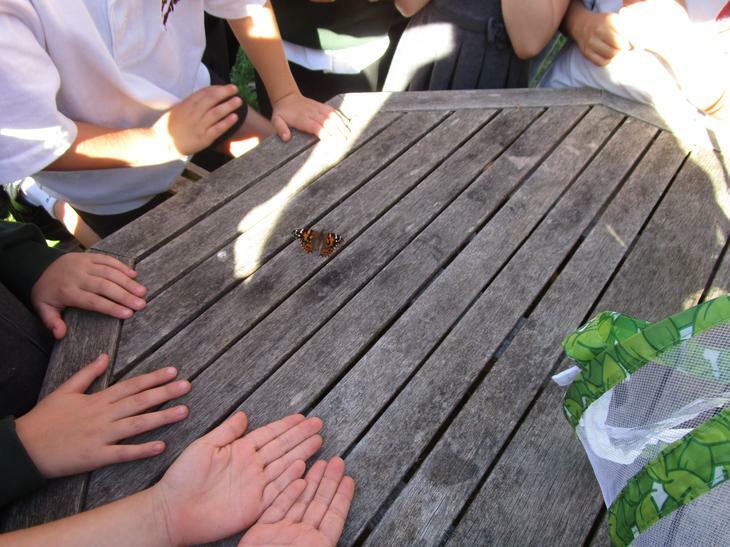 As part of our Science topic; 'Animals including humans' we learned about life cycles carrying out our own investigation into the stages of a butterfly life cycle. 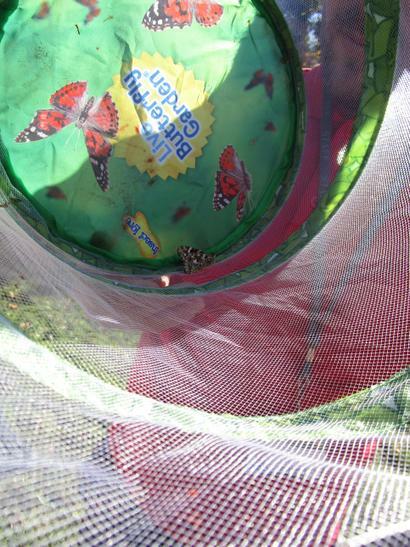 We watched the caterpillars turn into a chrysalis and then become butterflies over a period of a month. 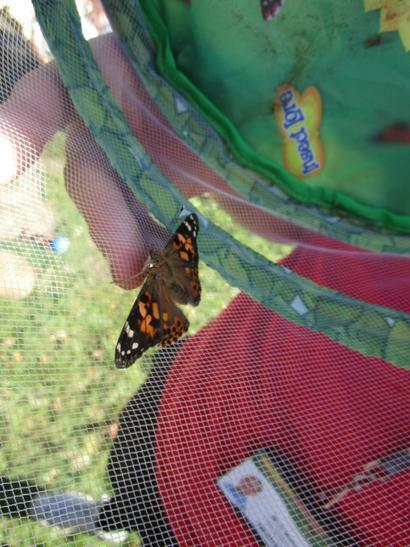 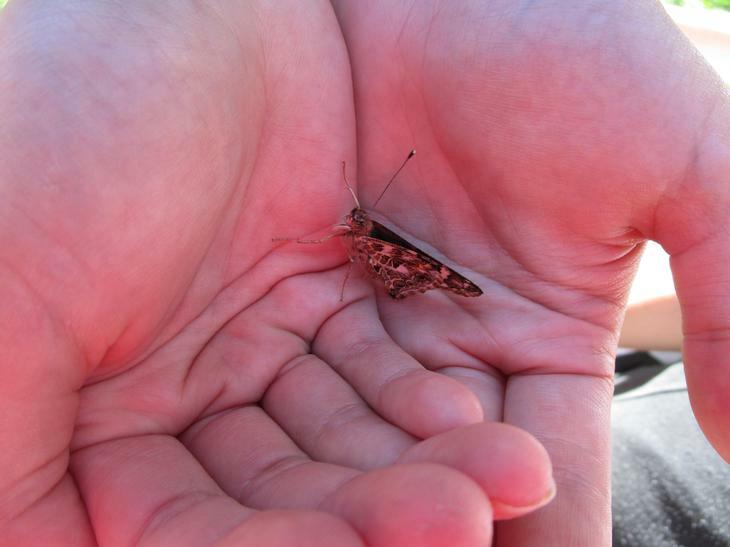 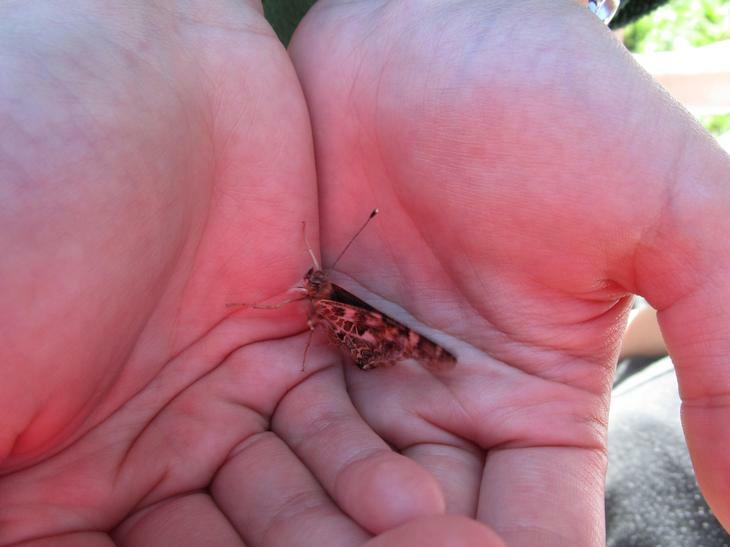 Then we released them in the meadow. 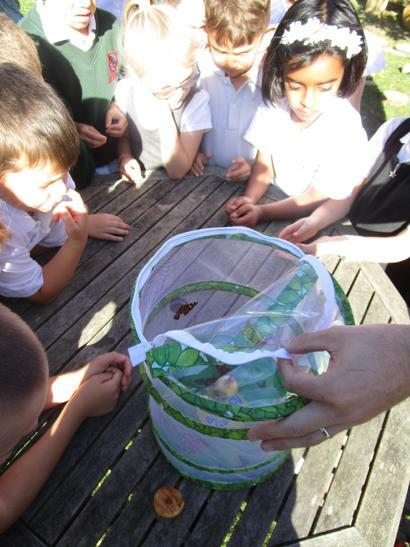 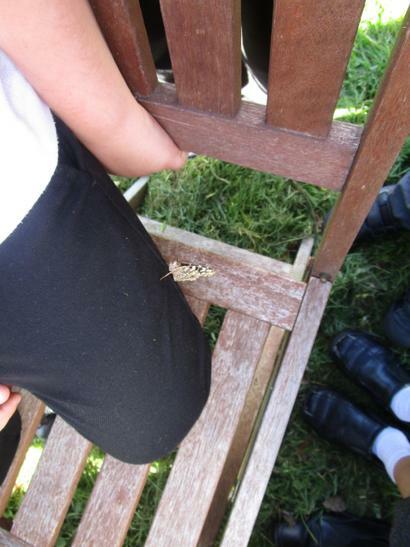 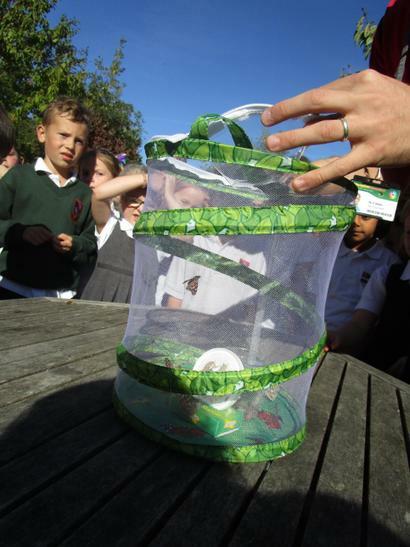 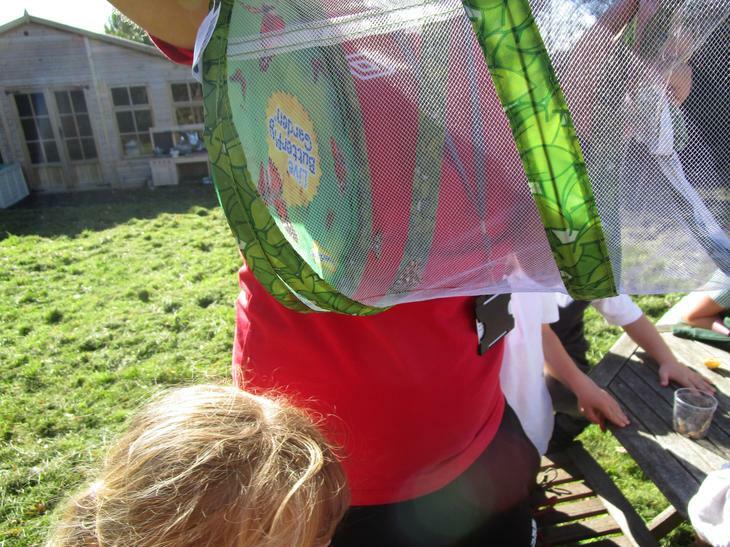 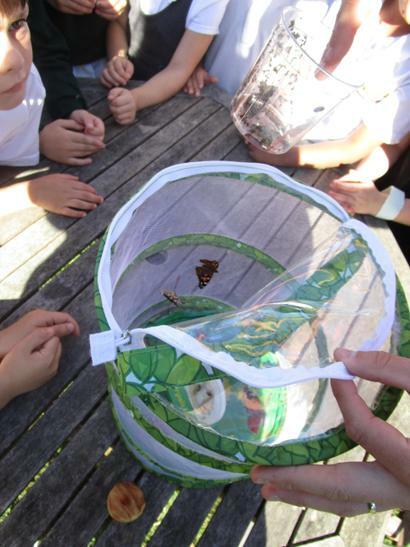 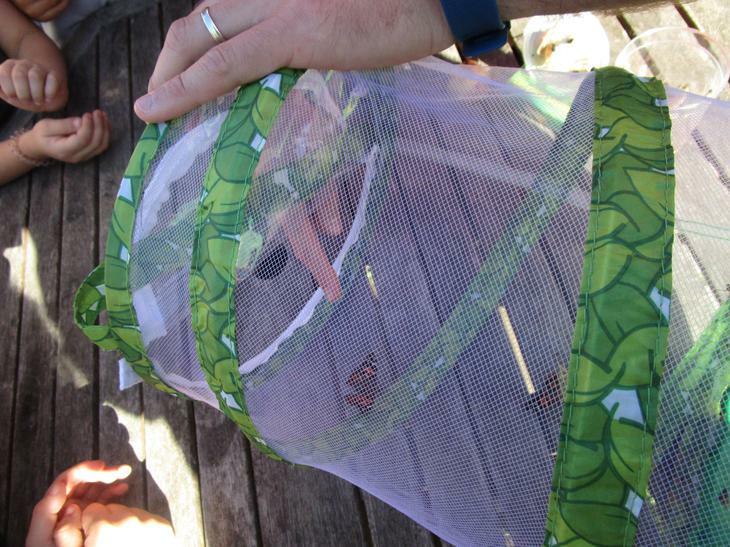 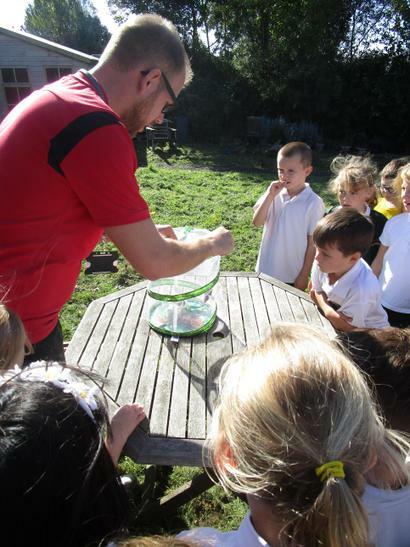 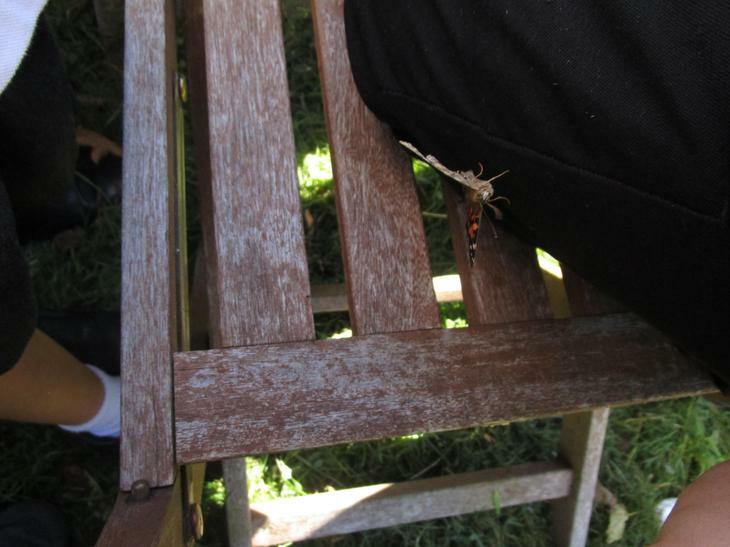 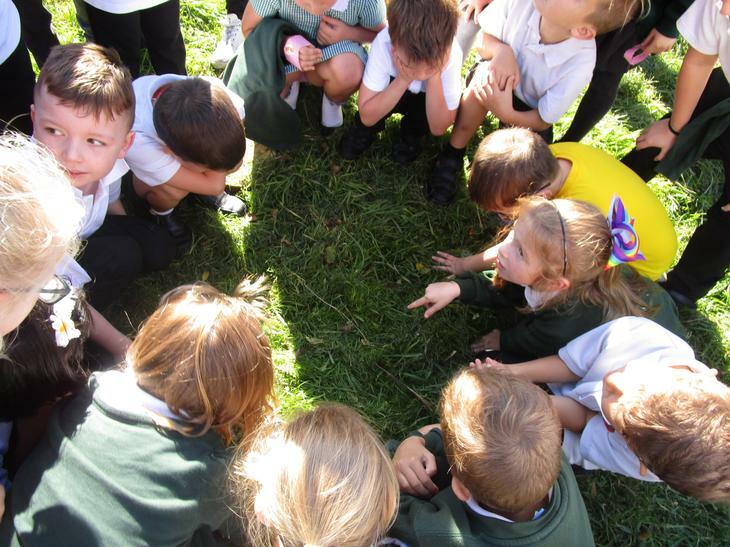 We had great fun watching the butterflies develop and seeing the different stages up close! 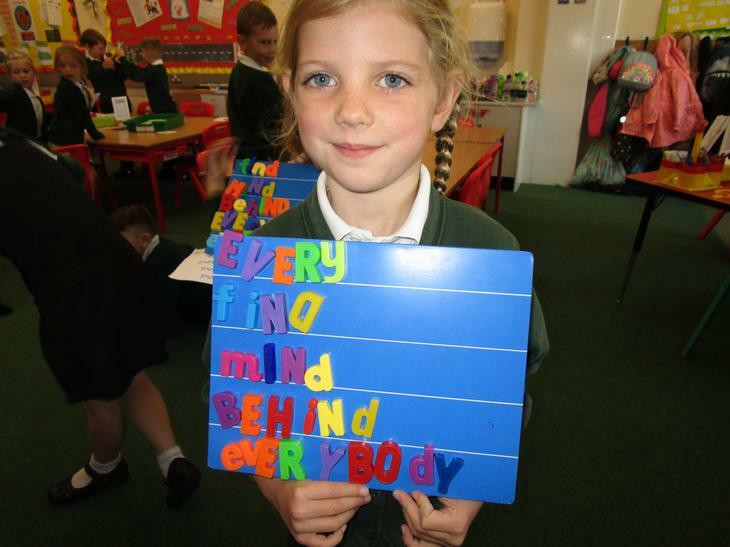 World Mental Health Awareness Day! 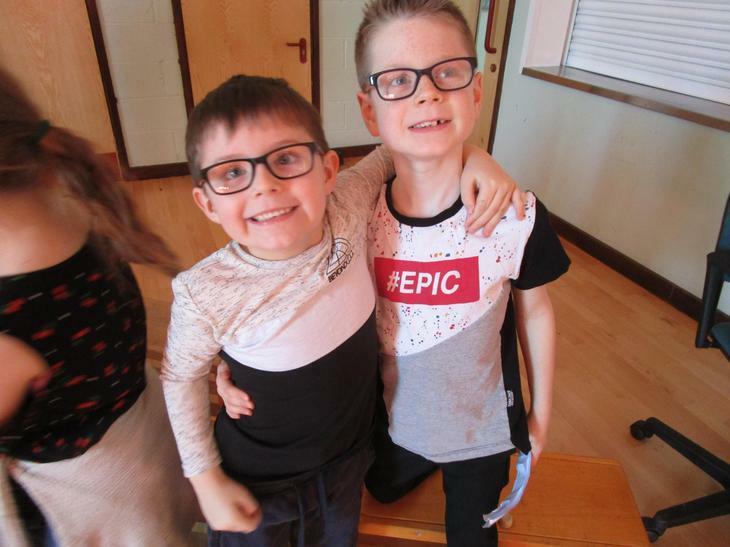 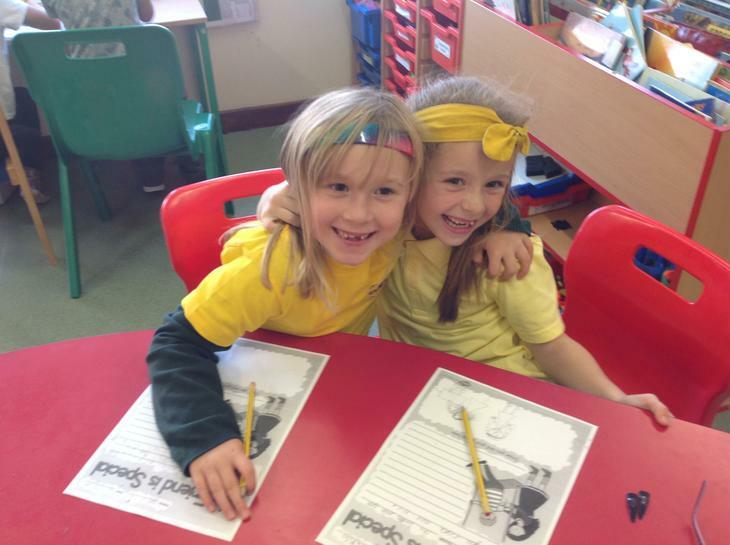 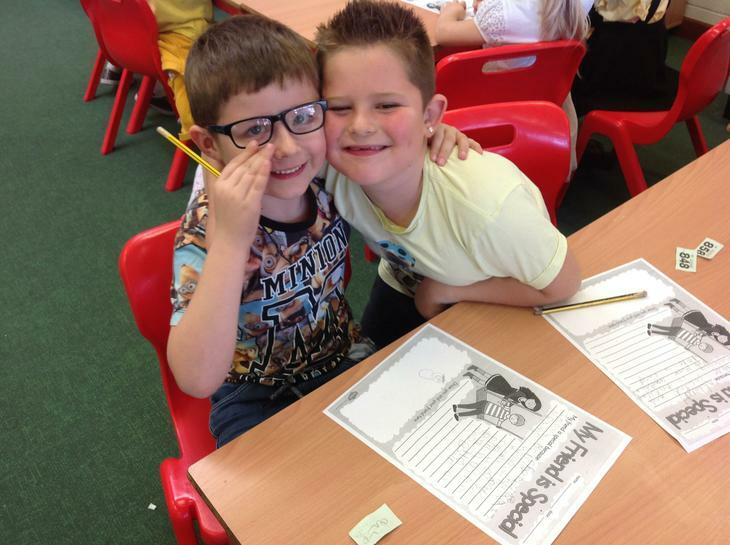 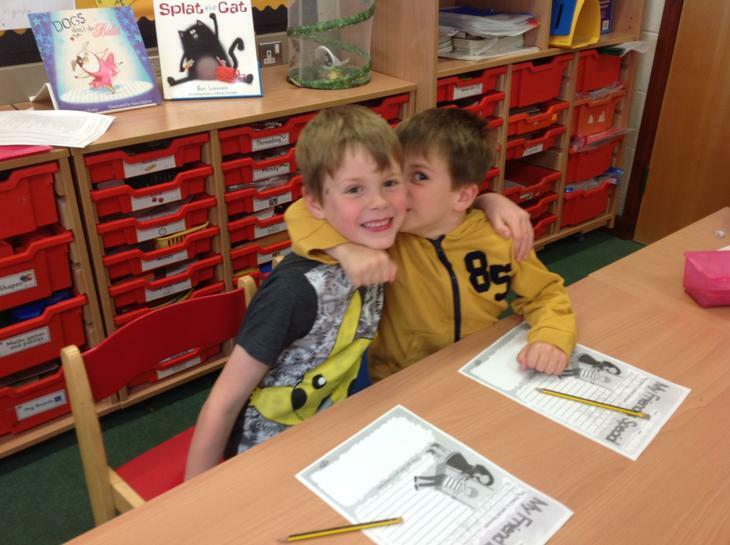 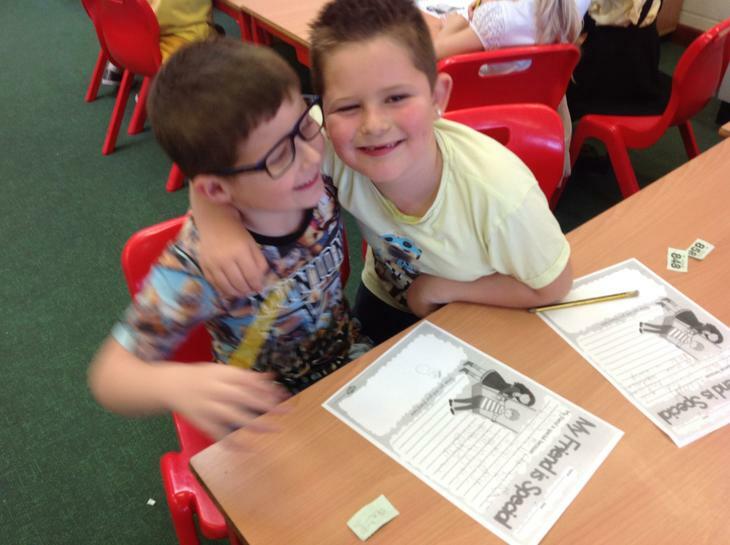 On World Mental Health Awareness Day we thought about what it takes to be a good friend, how it feels to be happy and wrote positive compliments about our friends to see them smile! 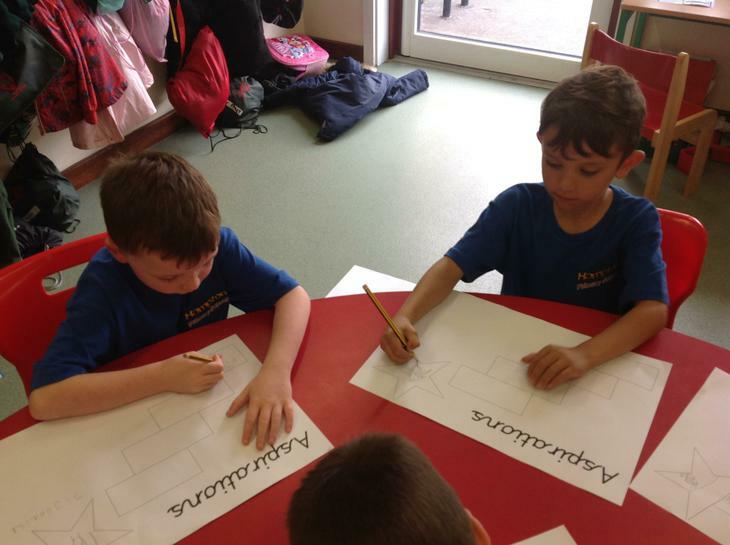 In Spelling lessons we use magnetic letters to spell words, we play on spelling shed on Mr W's interactive whiteboard, we play spelling pong and do staircase spellings too! 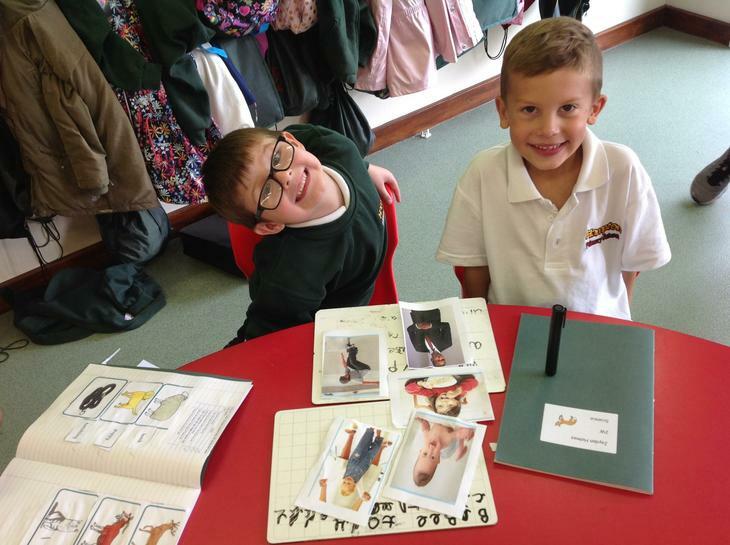 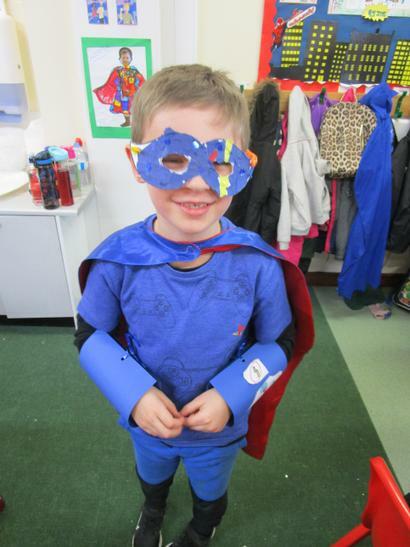 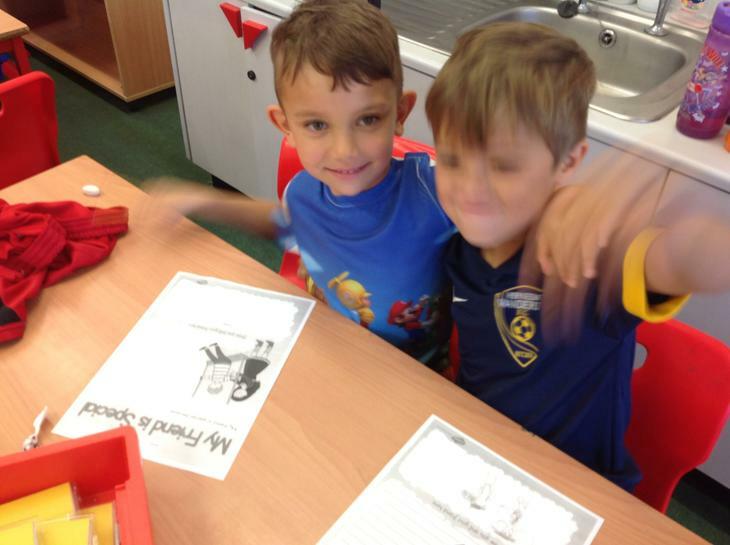 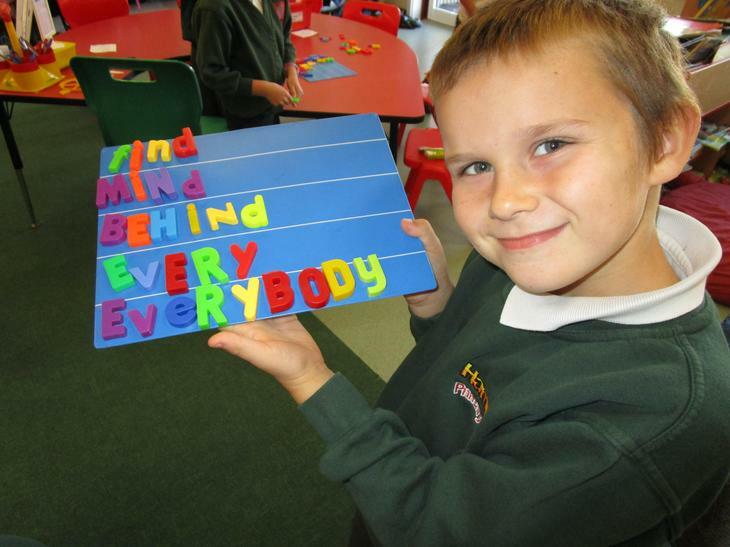 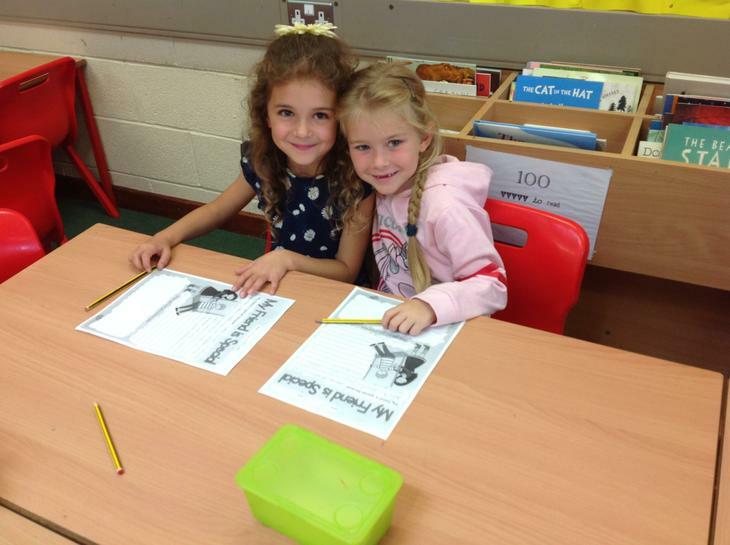 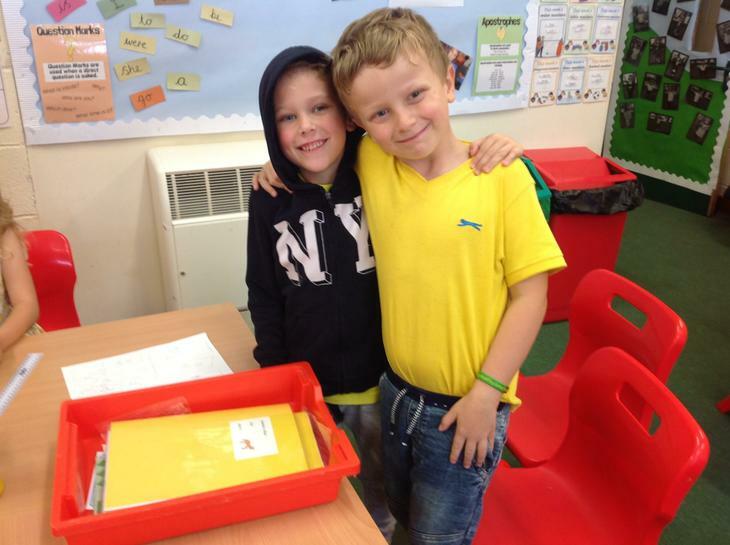 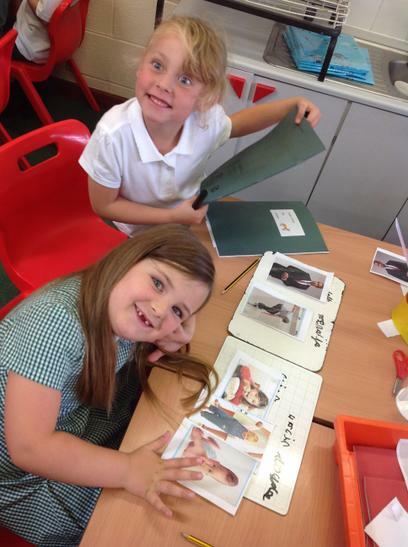 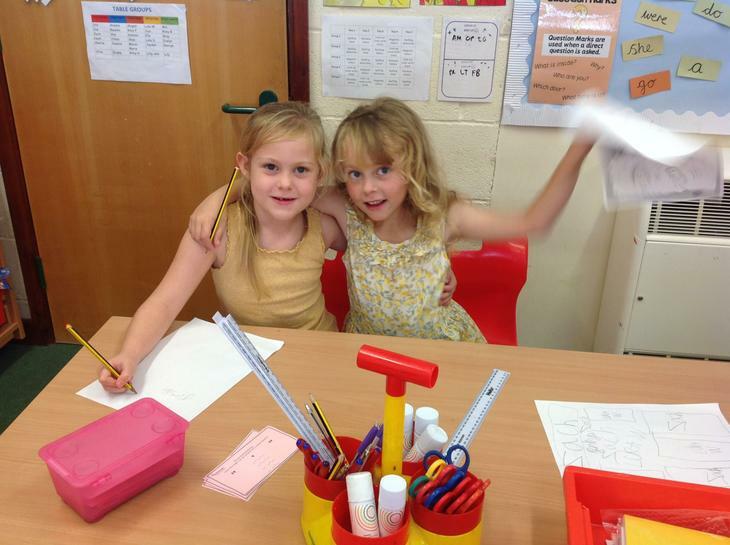 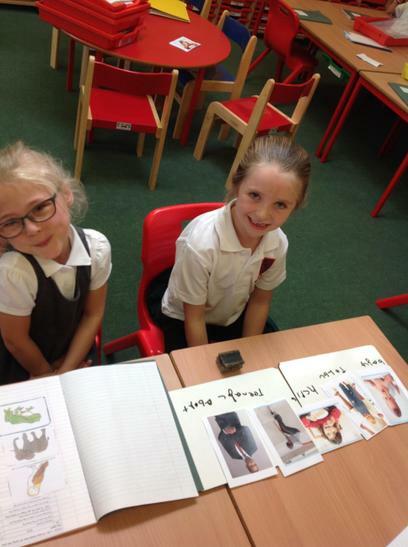 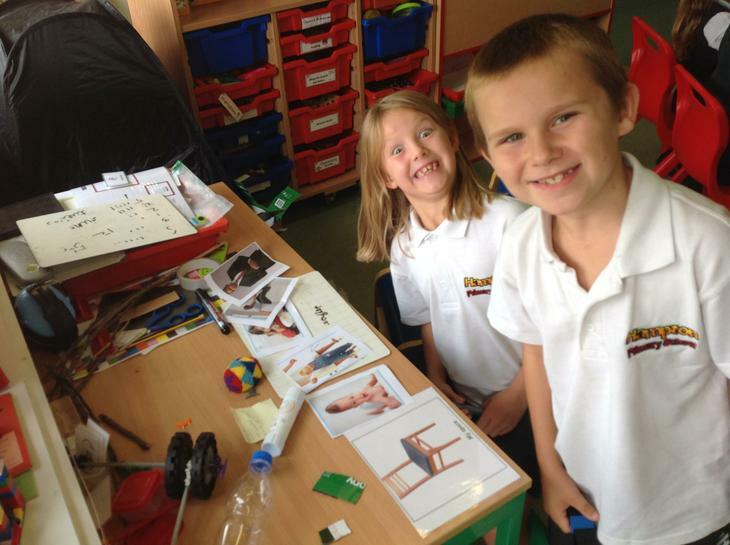 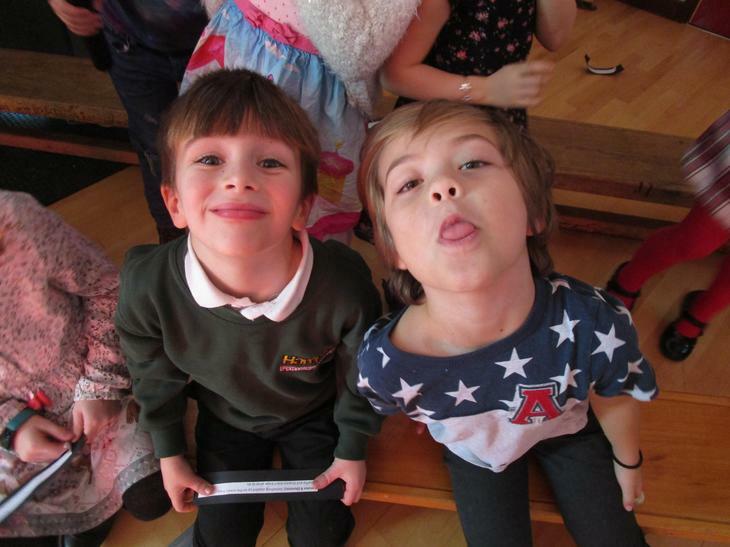 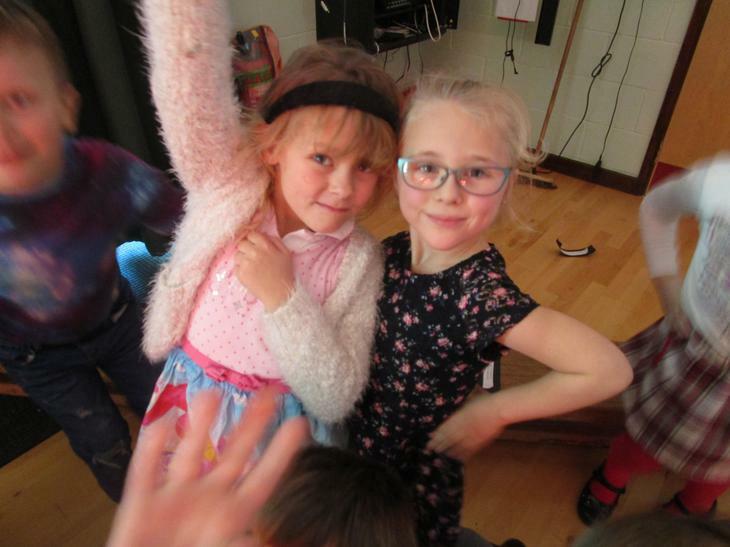 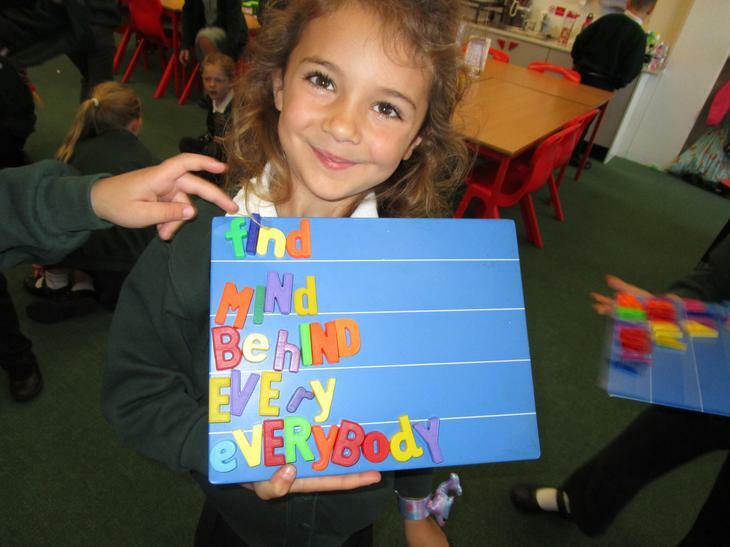 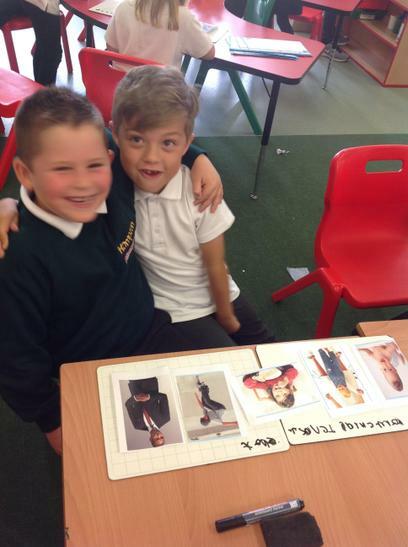 We have lots of fun learning our words each week in class! 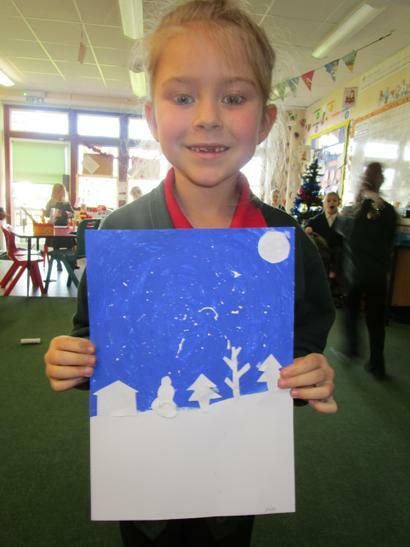 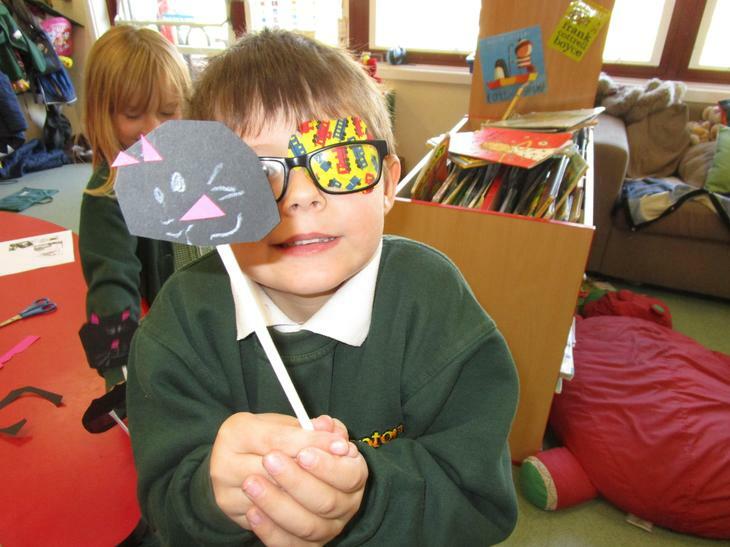 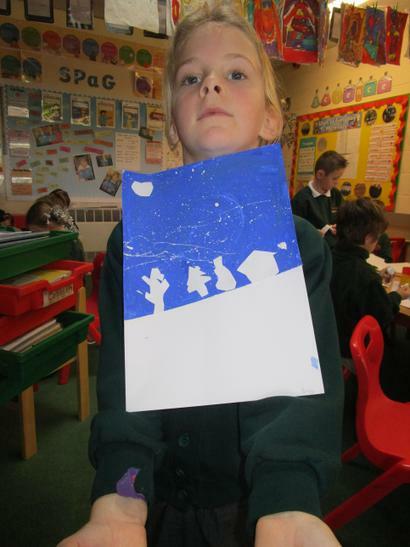 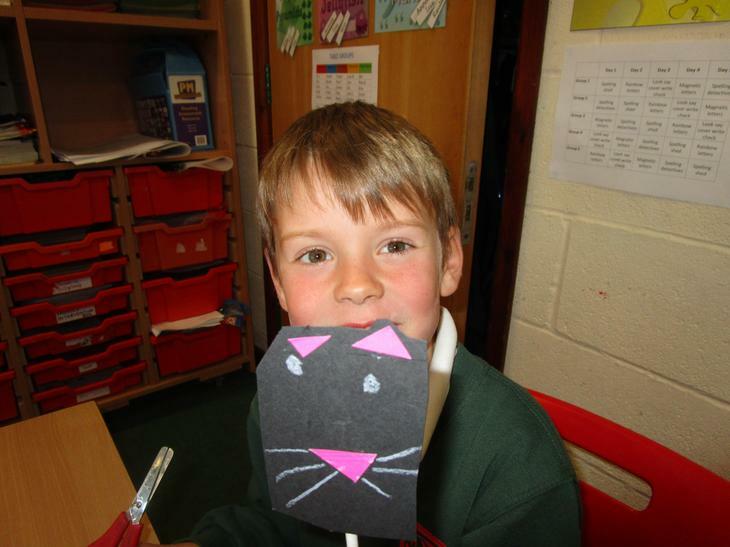 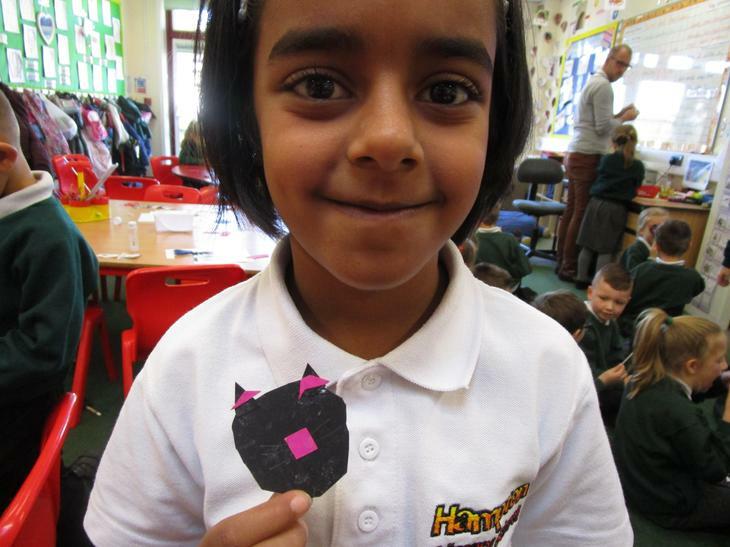 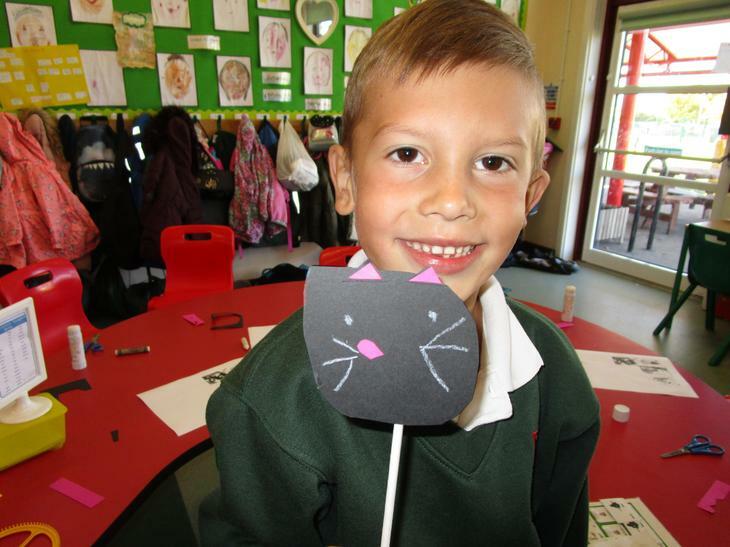 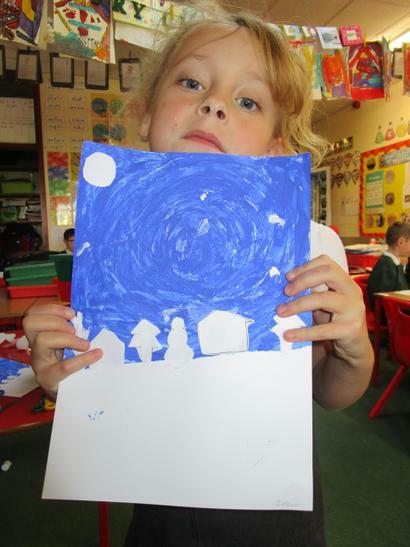 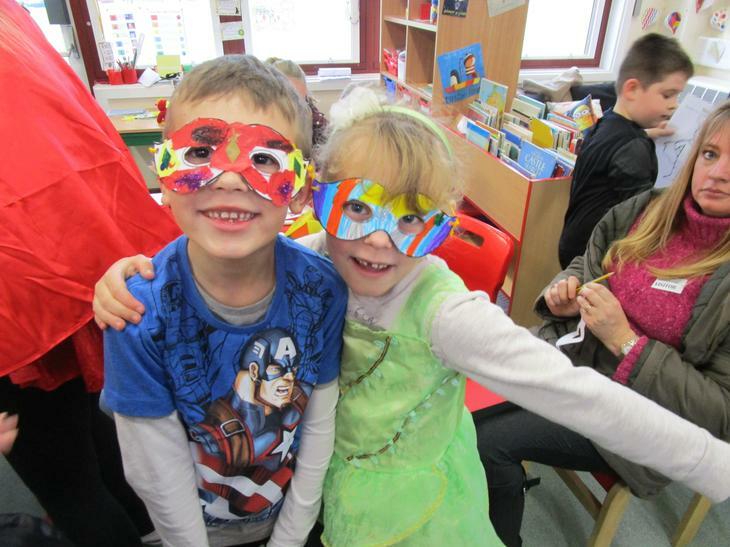 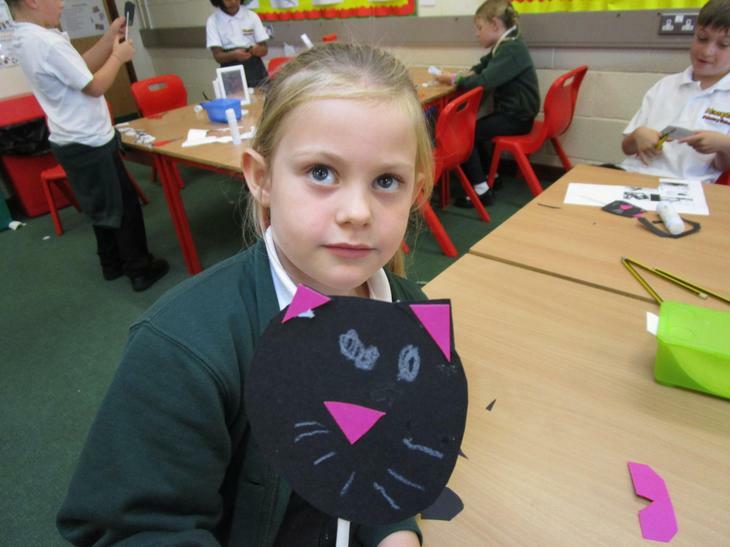 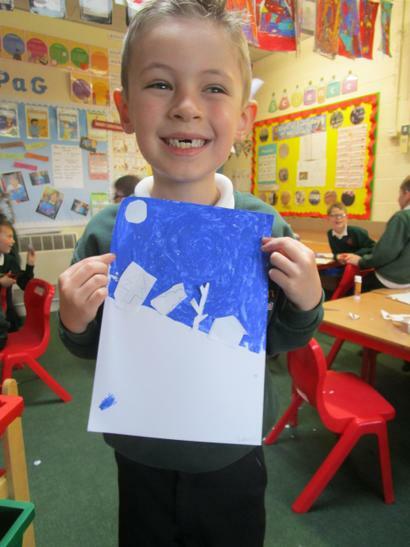 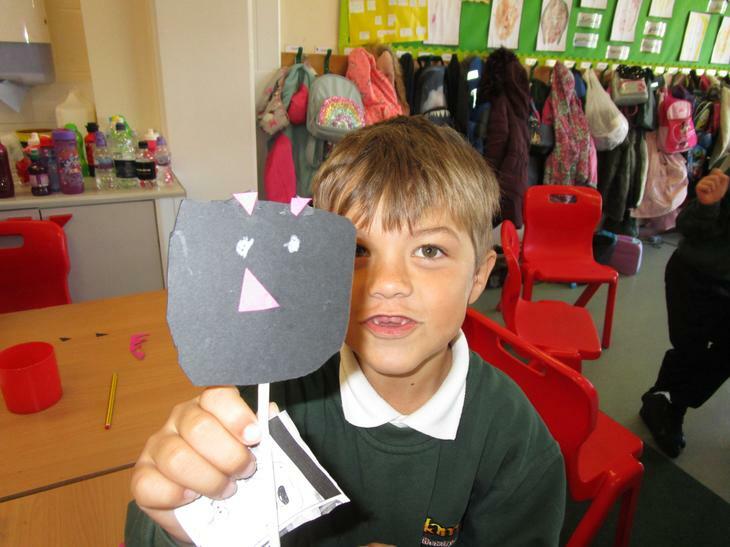 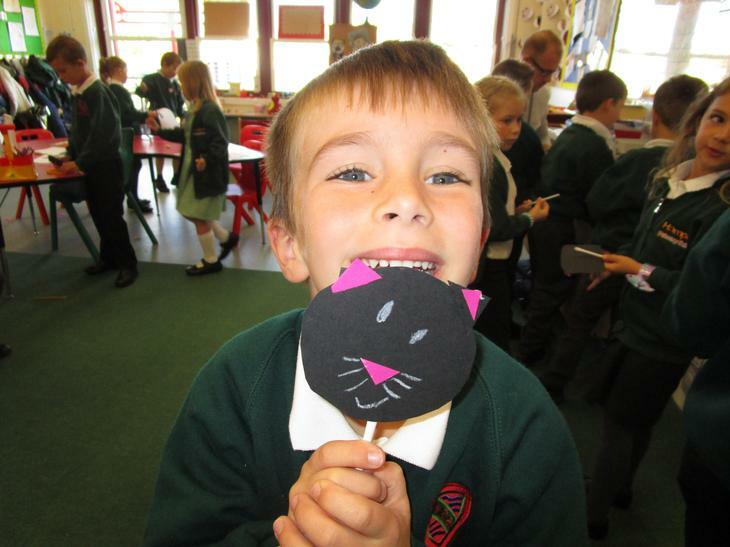 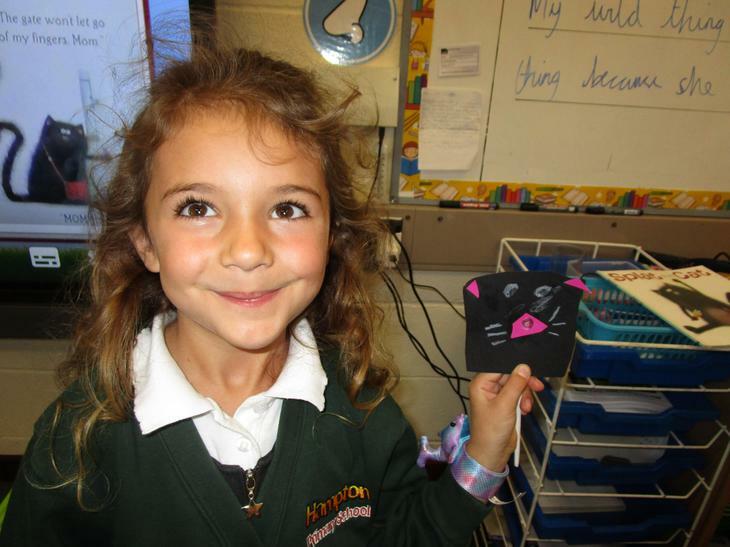 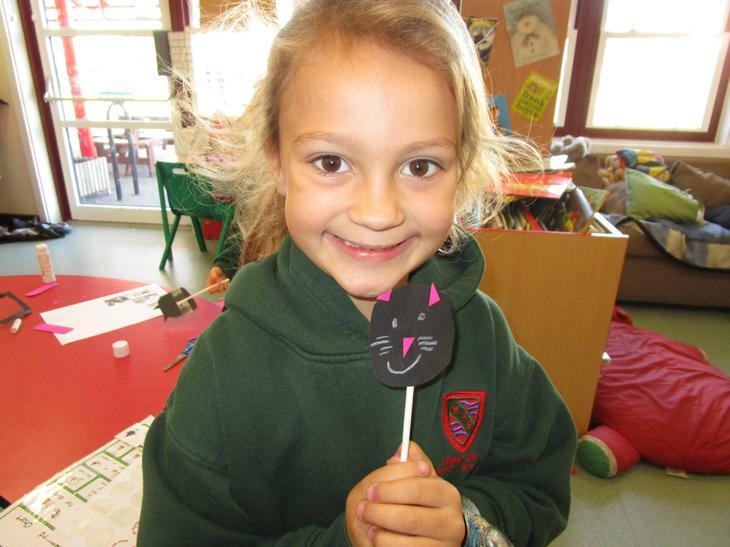 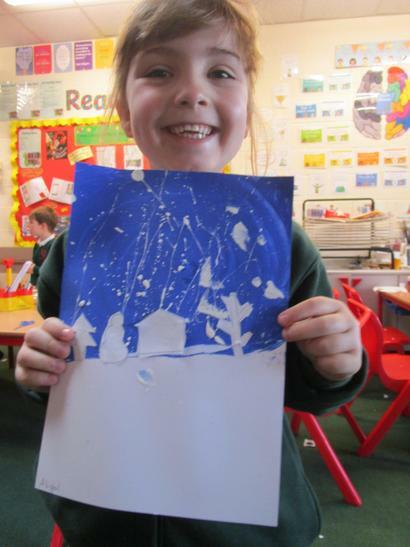 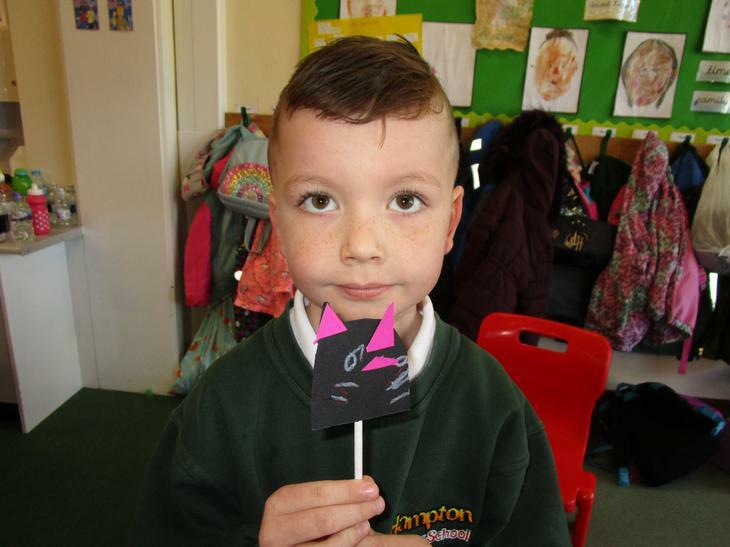 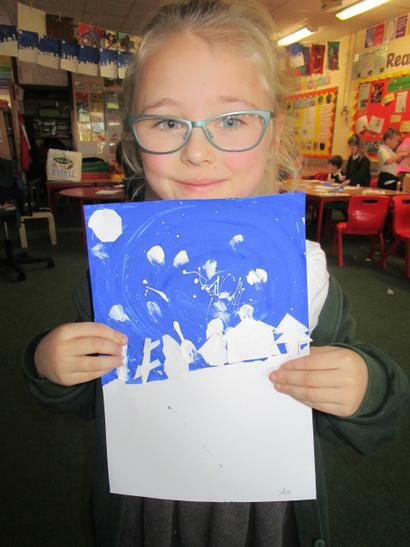 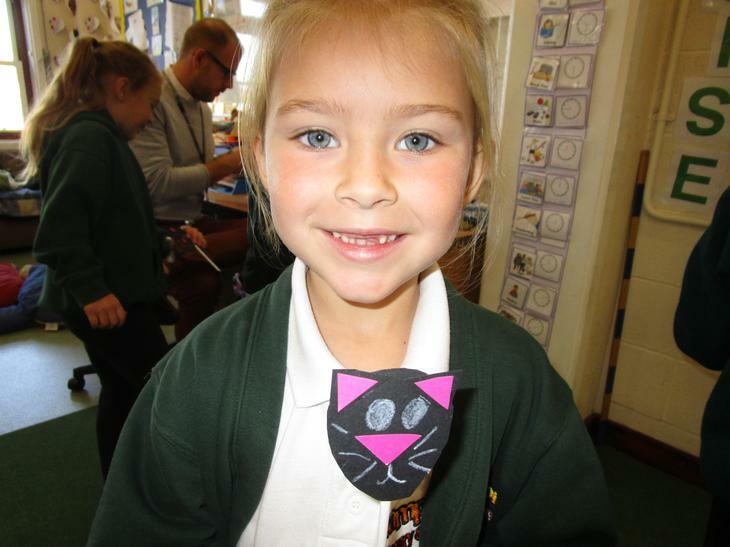 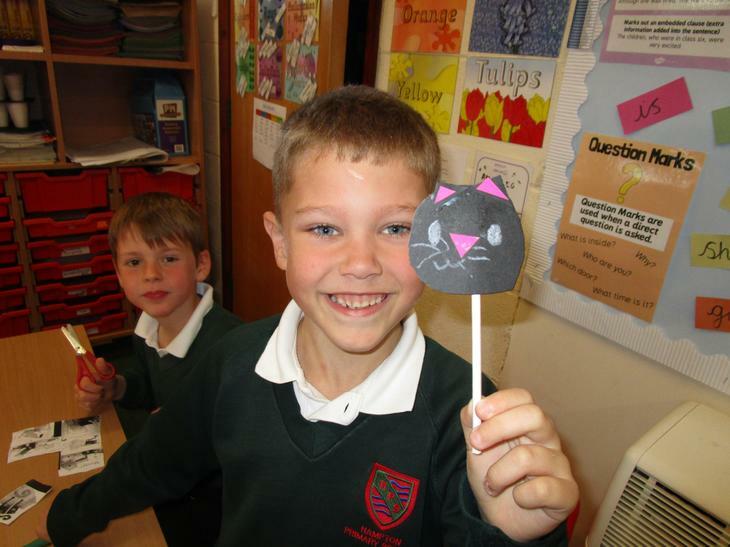 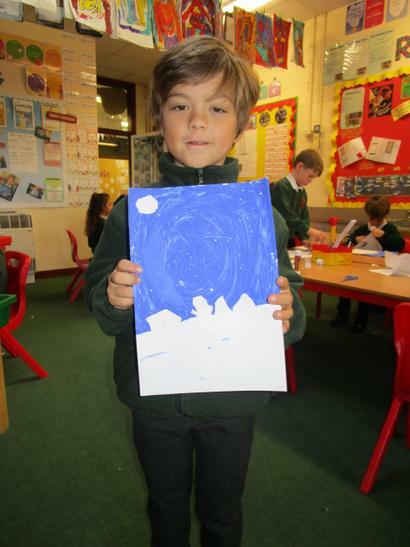 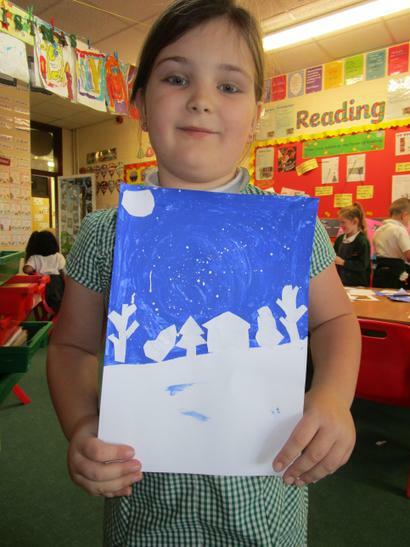 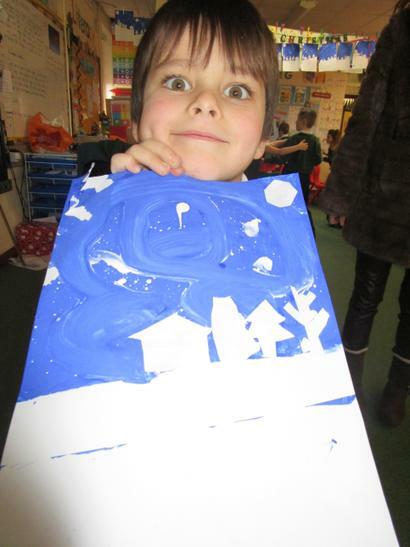 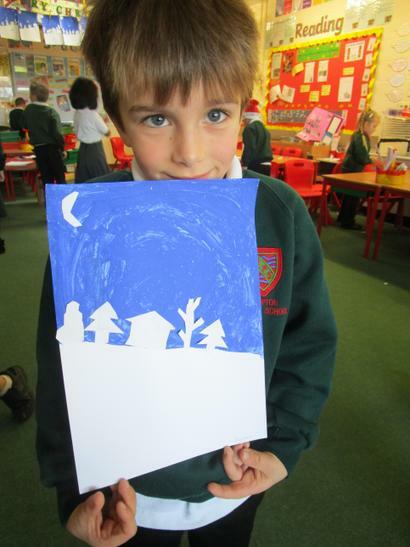 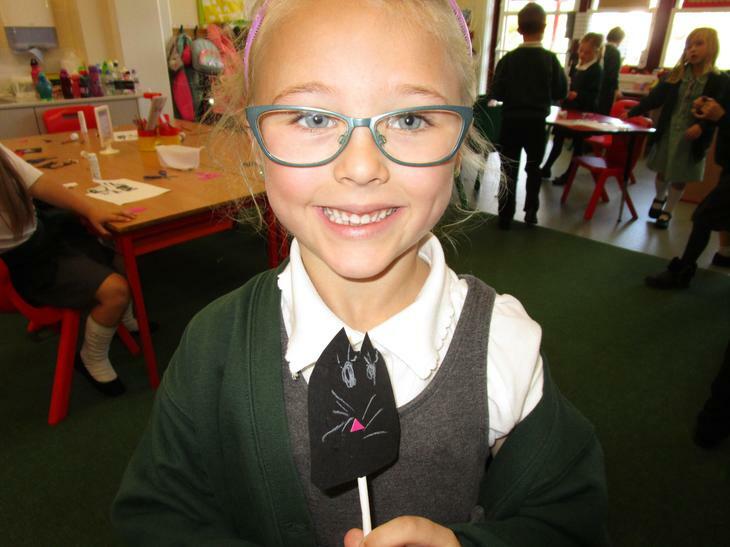 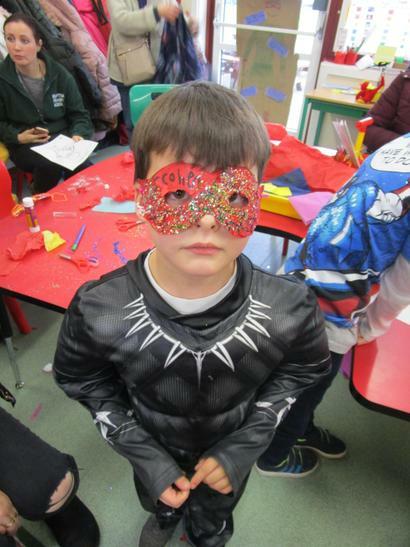 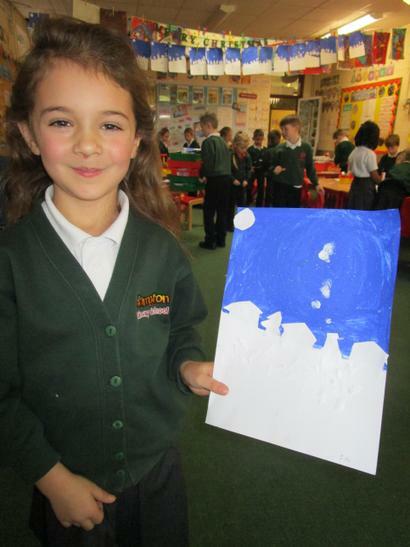 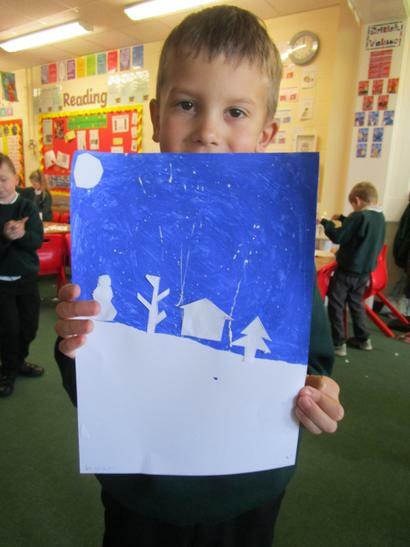 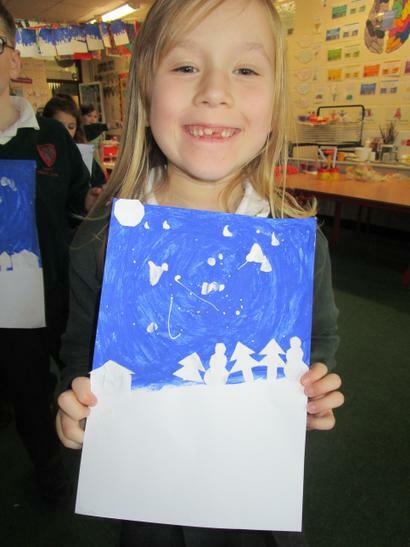 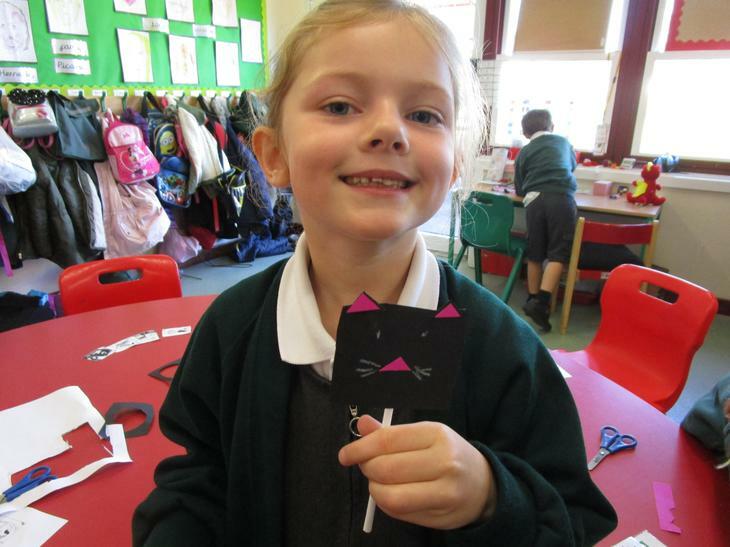 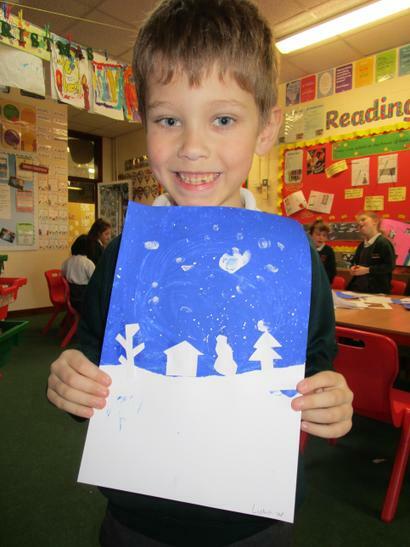 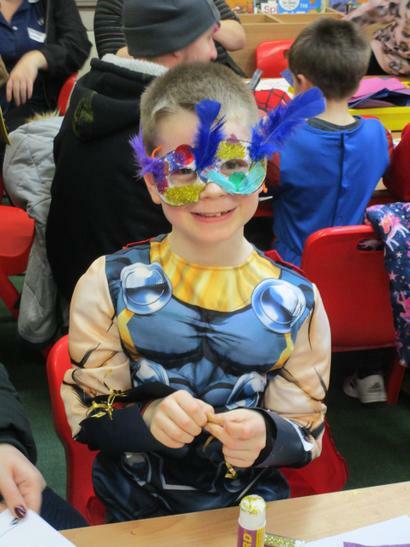 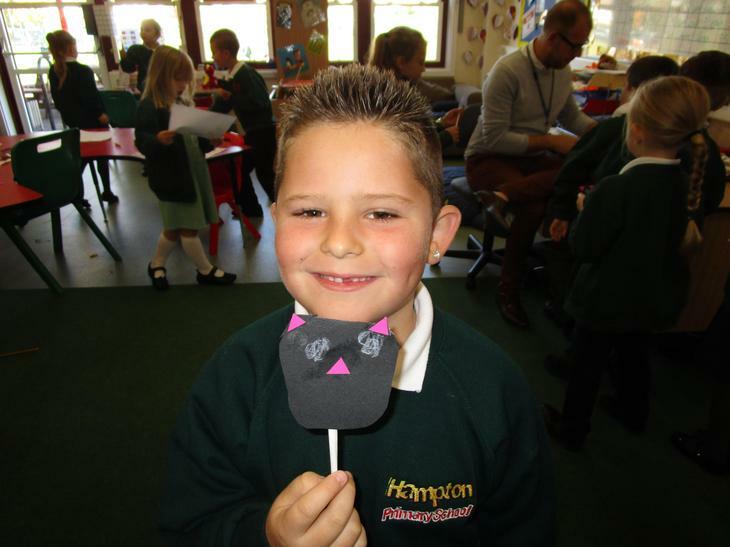 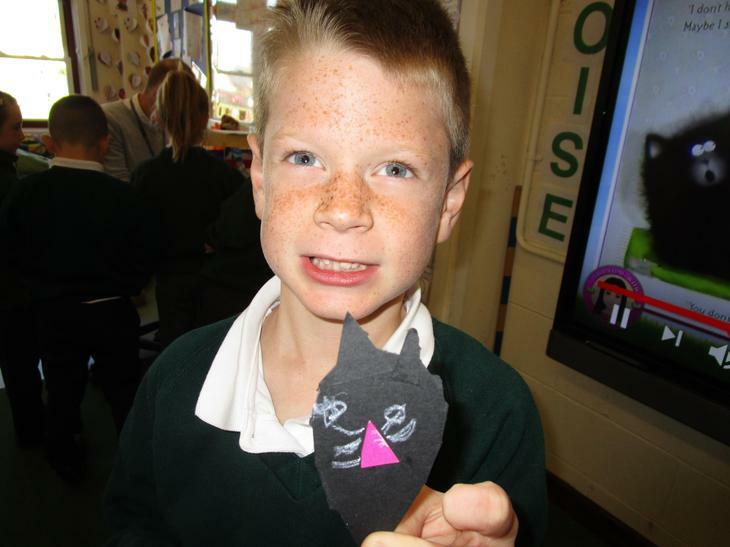 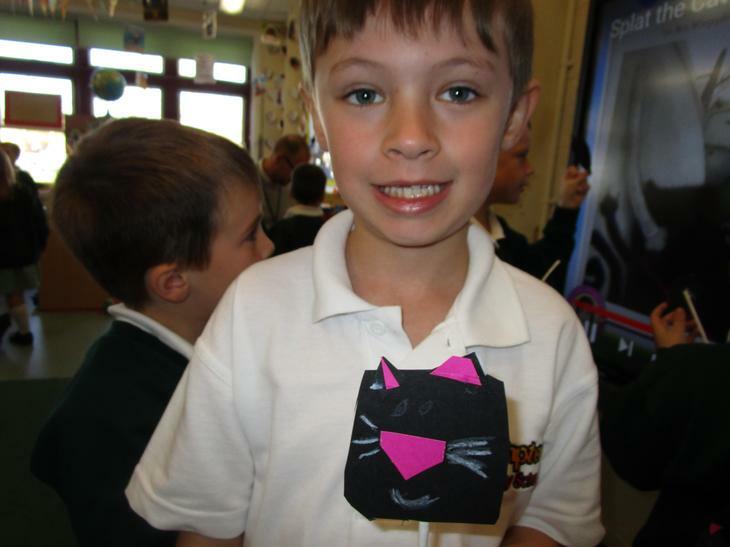 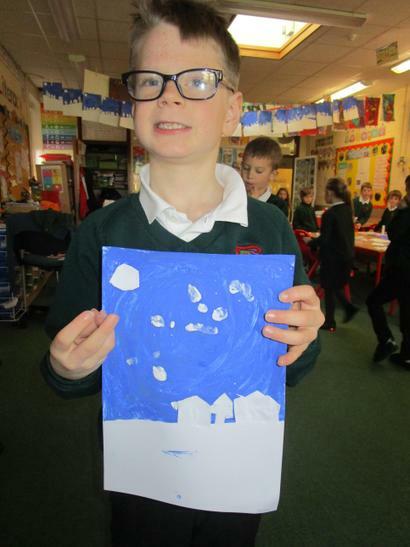 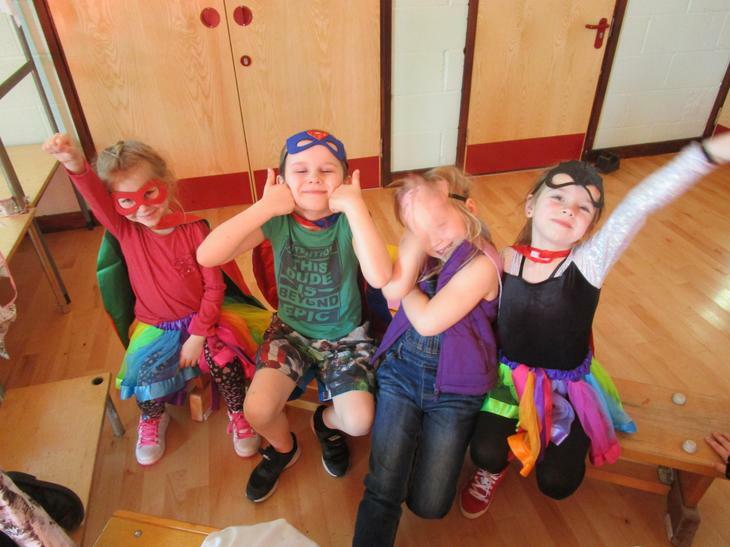 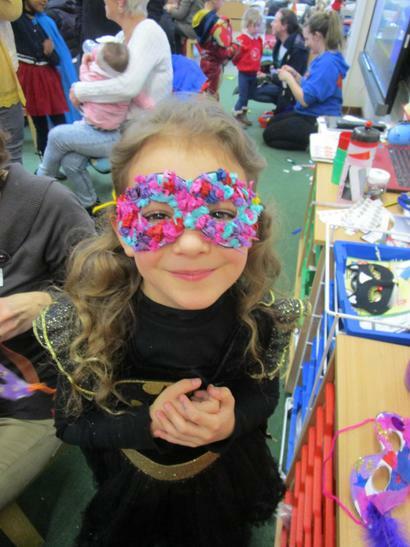 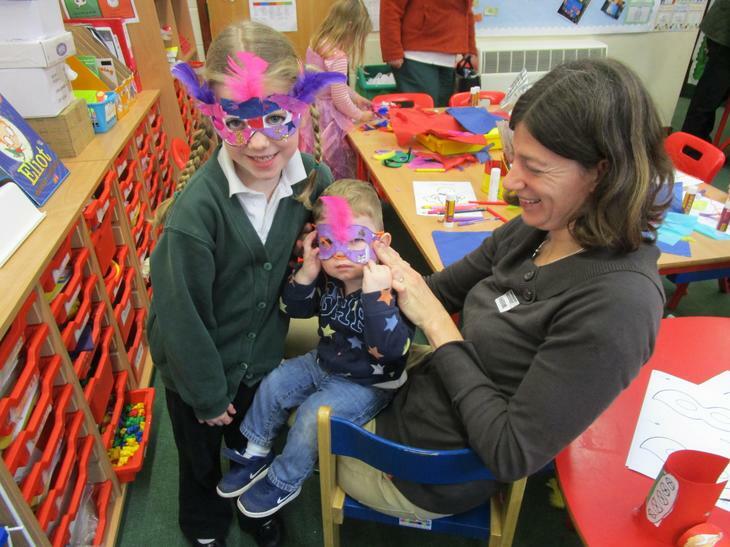 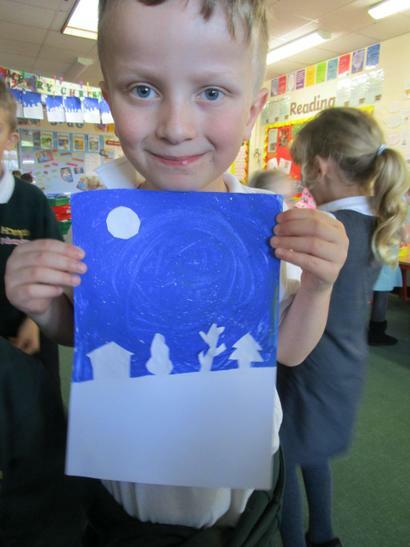 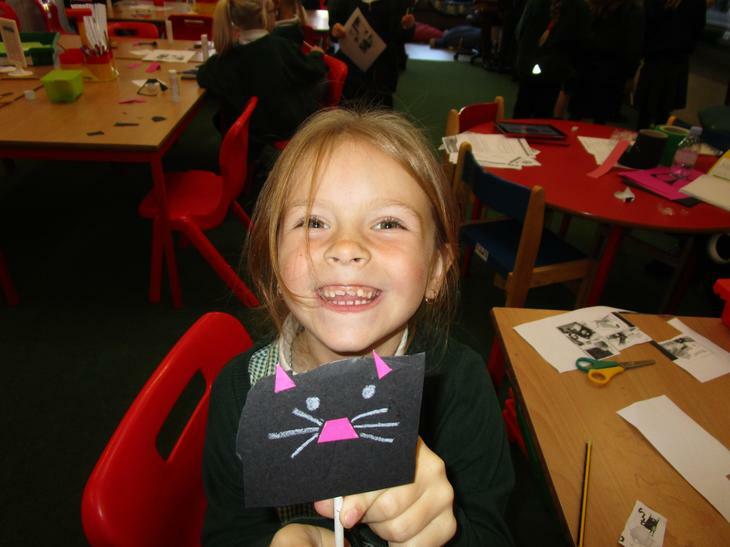 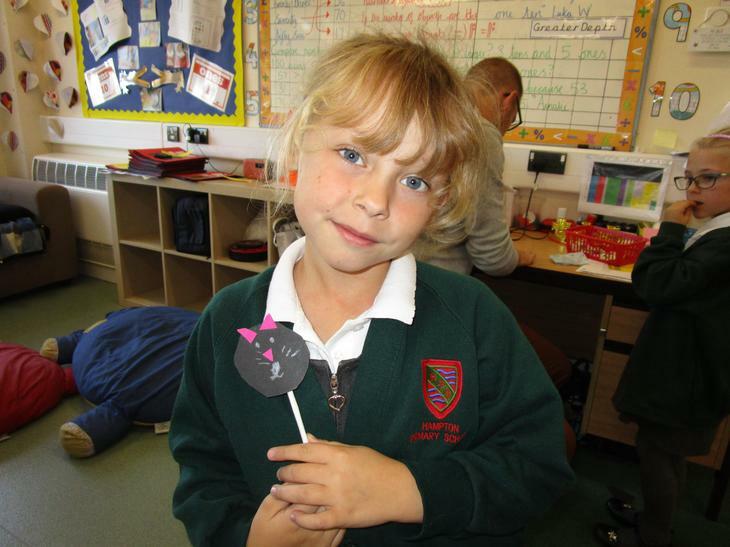 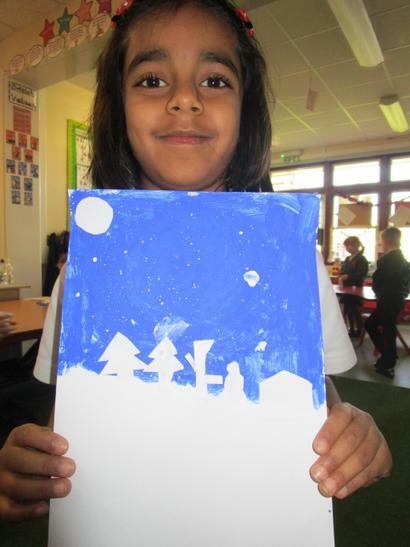 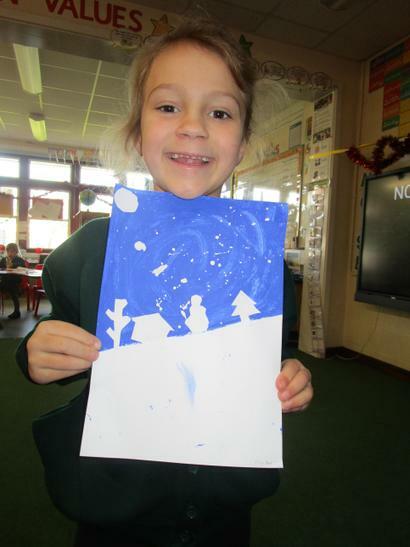 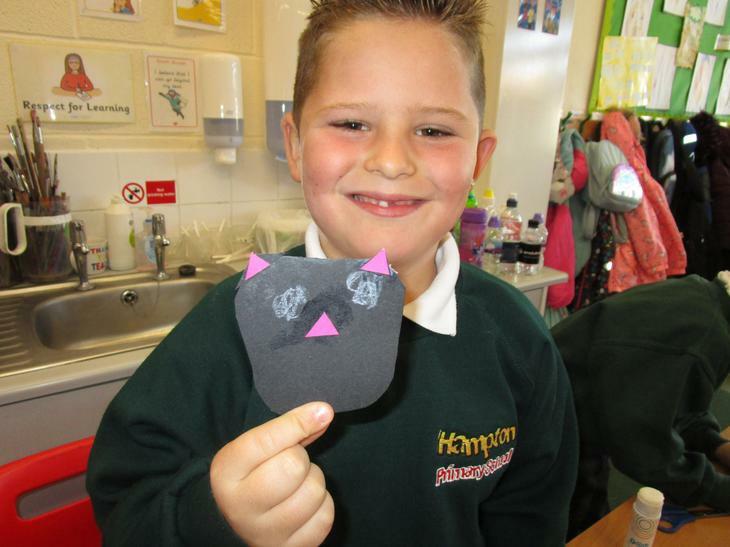 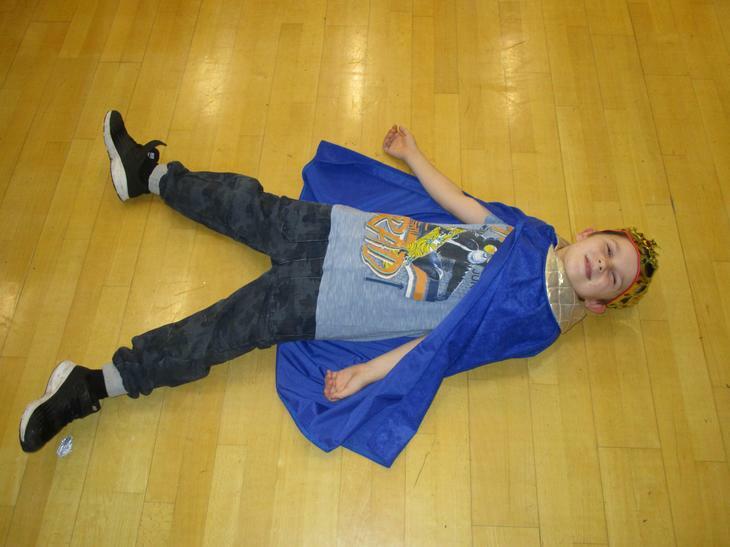 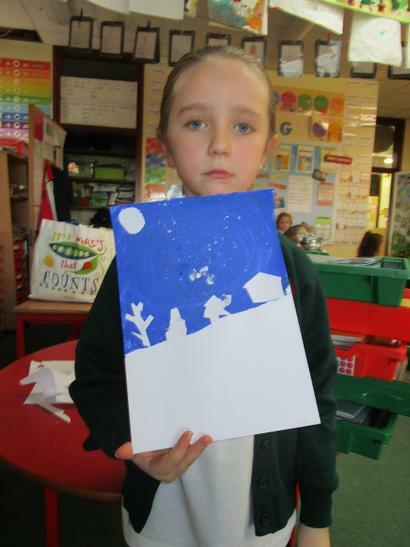 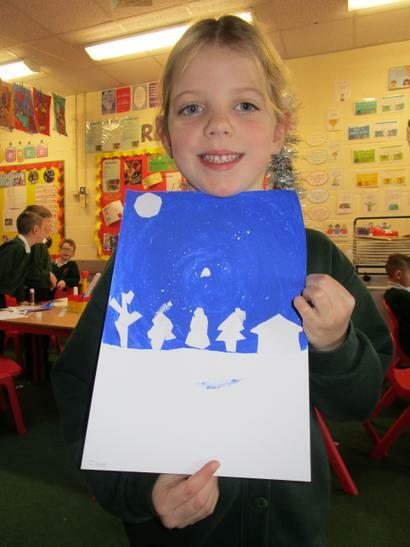 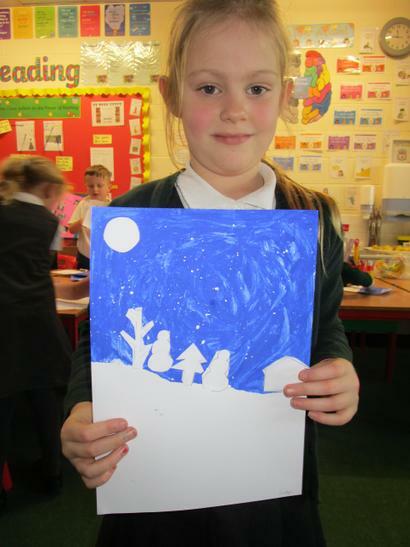 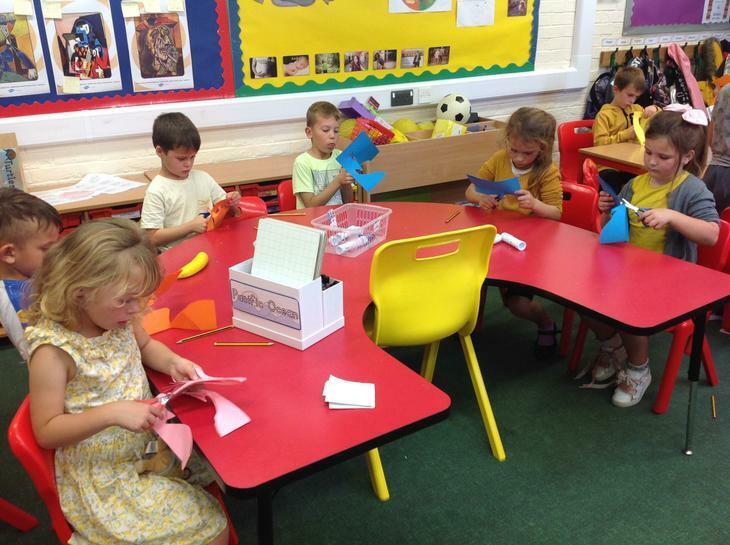 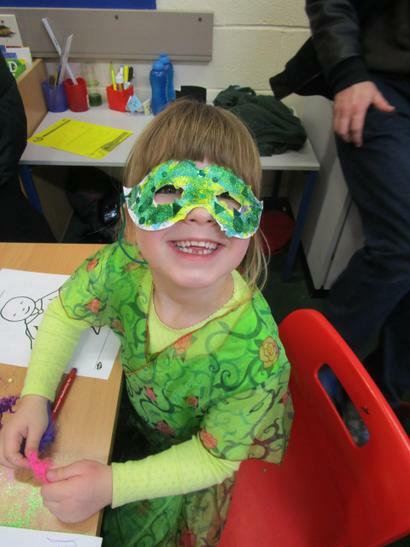 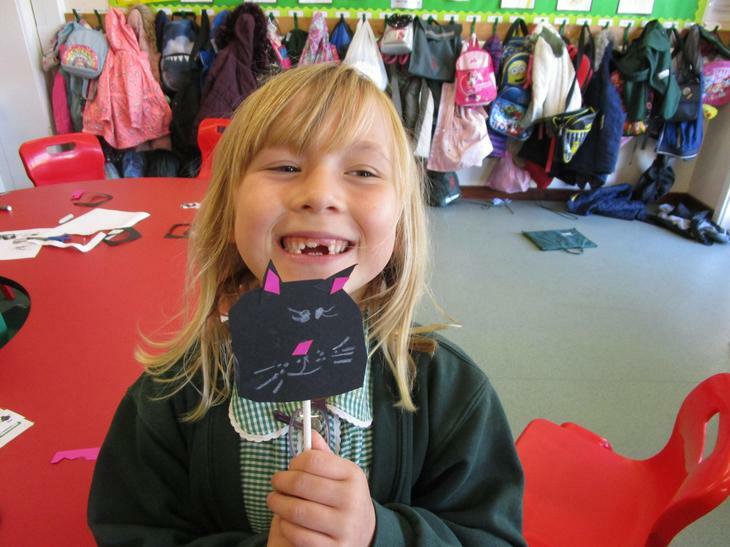 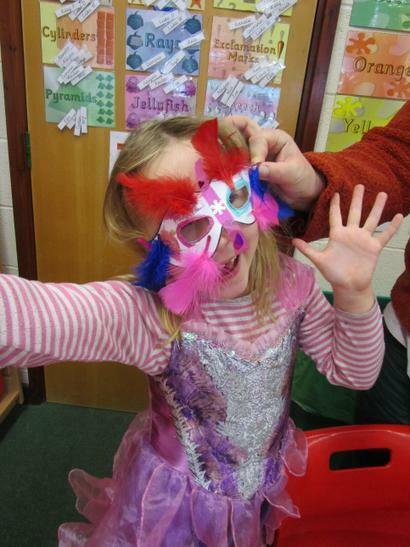 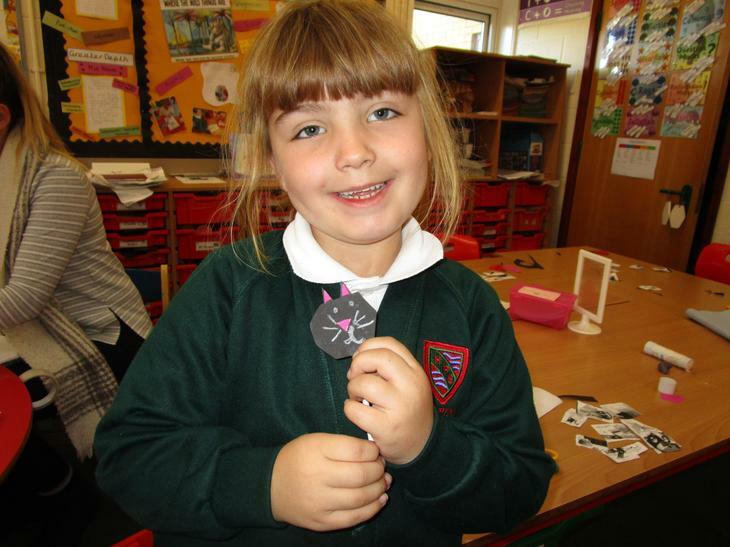 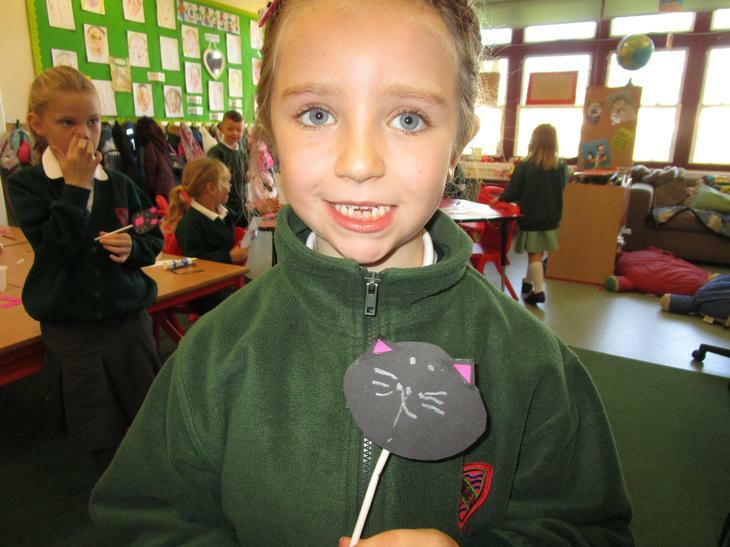 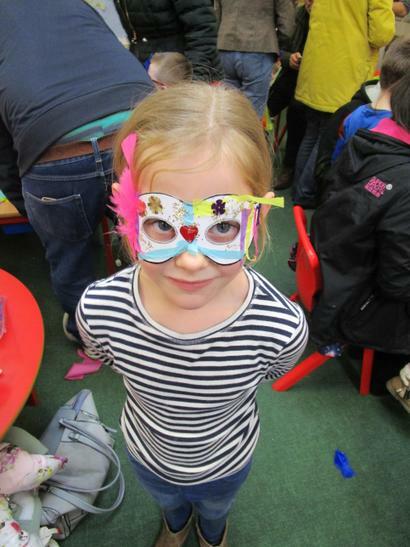 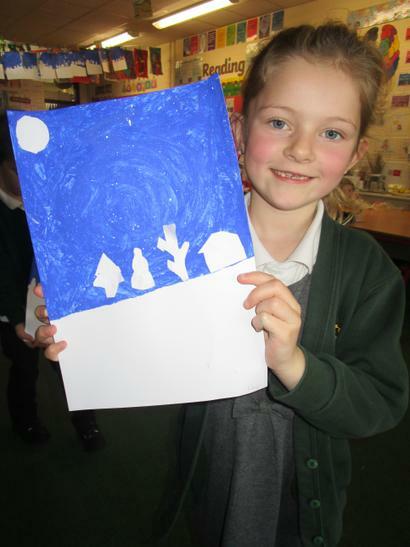 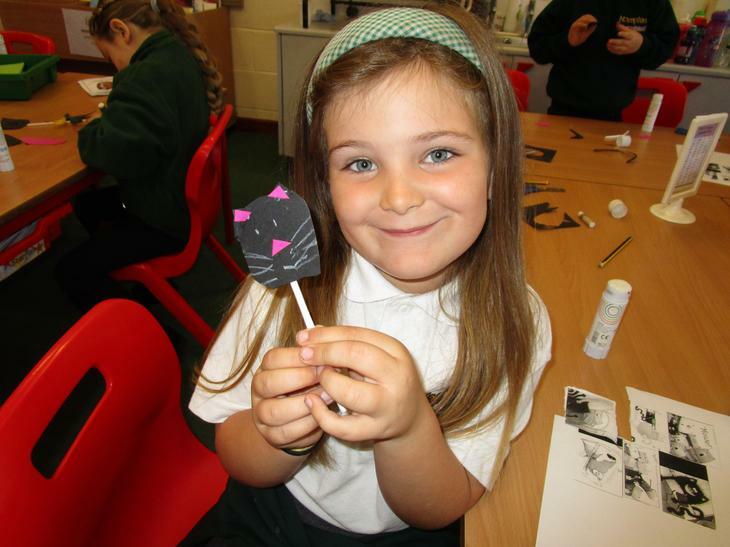 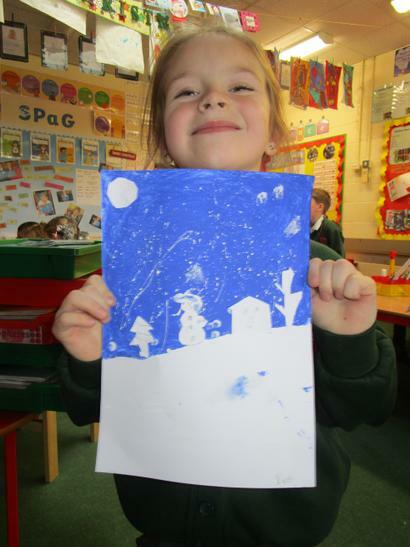 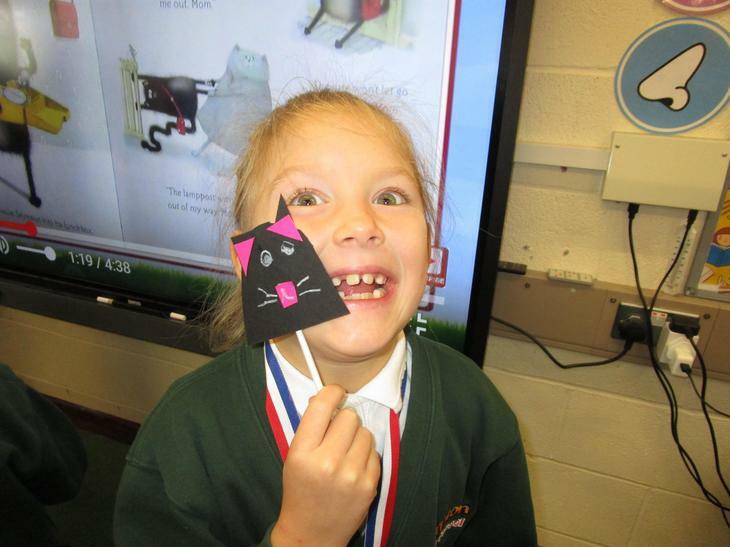 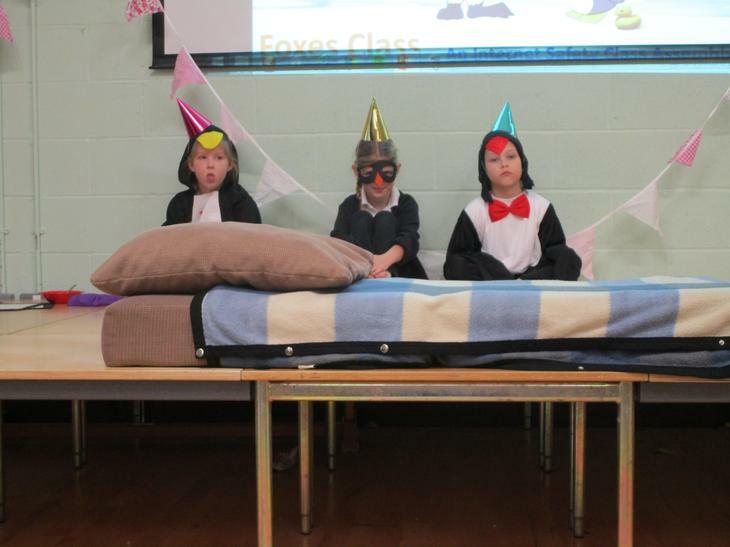 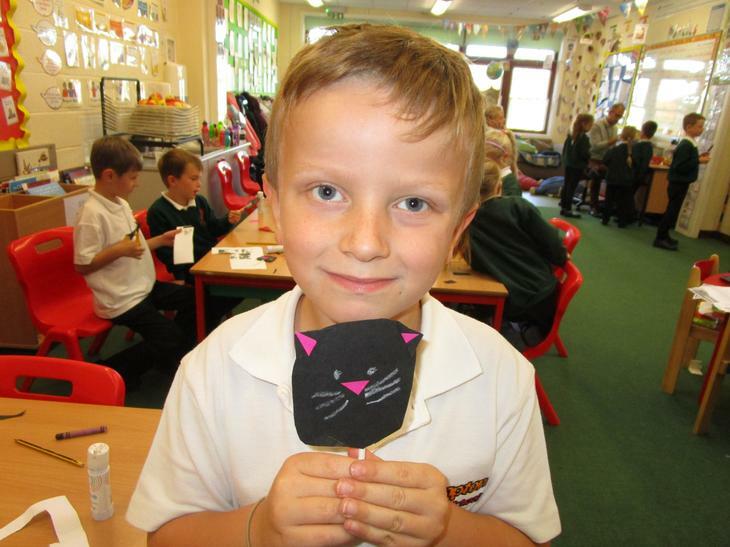 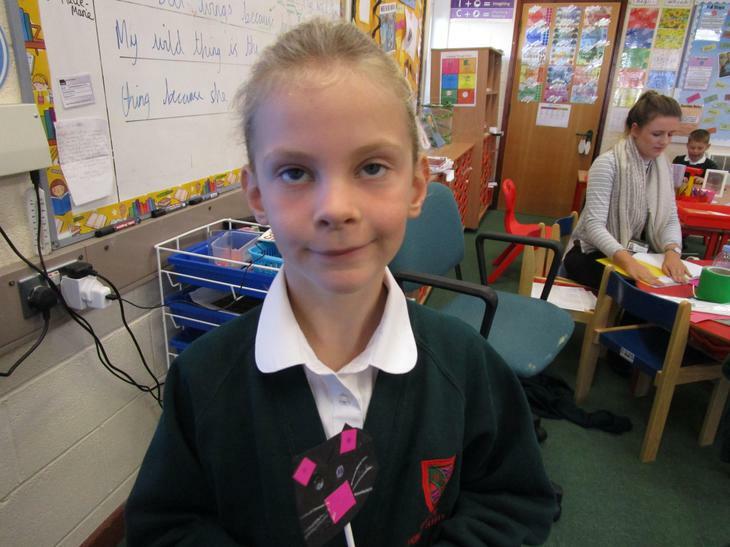 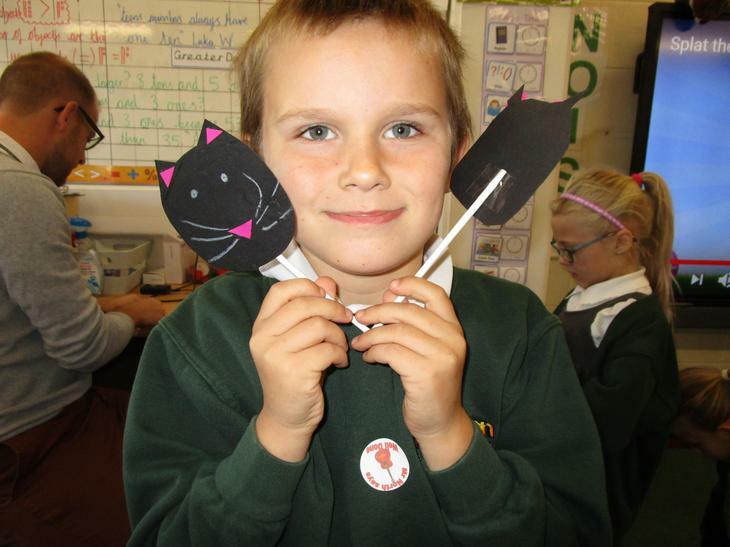 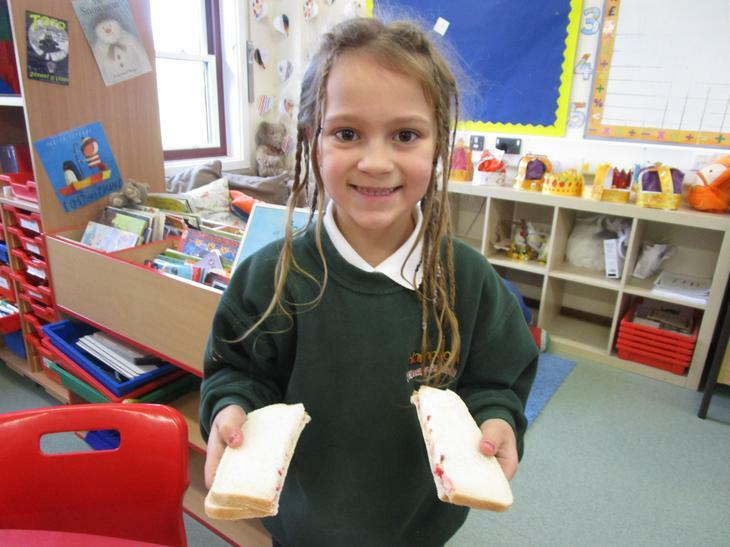 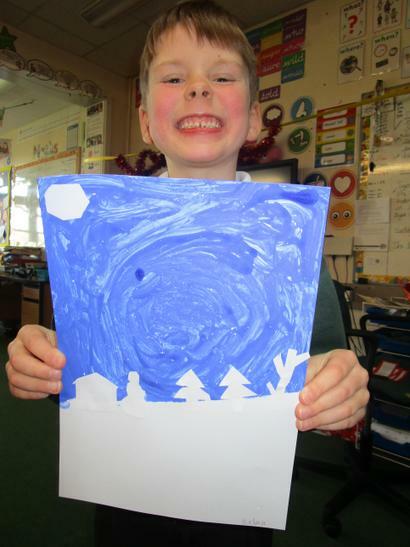 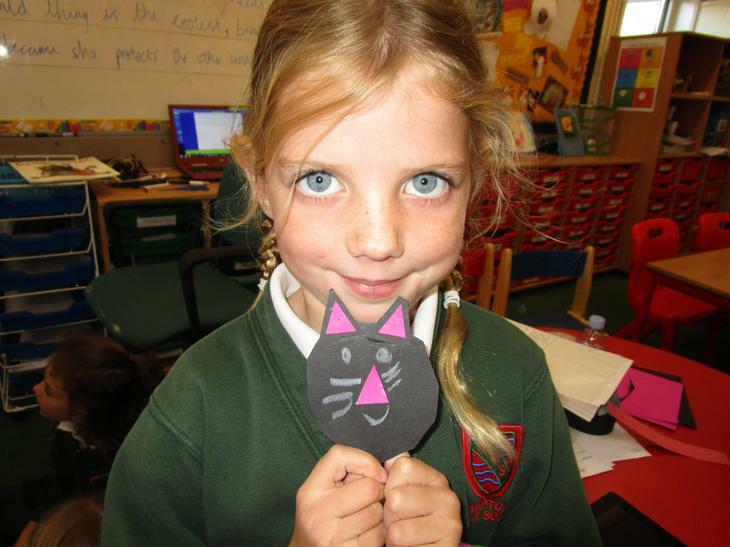 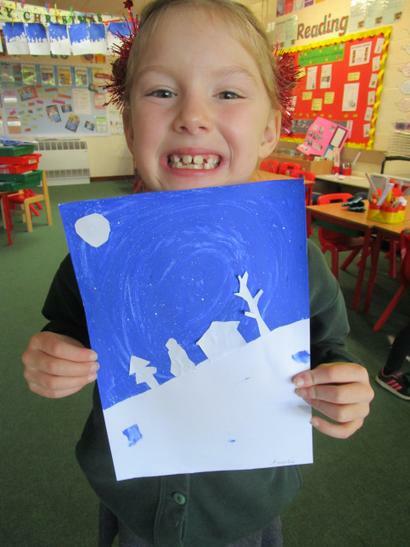 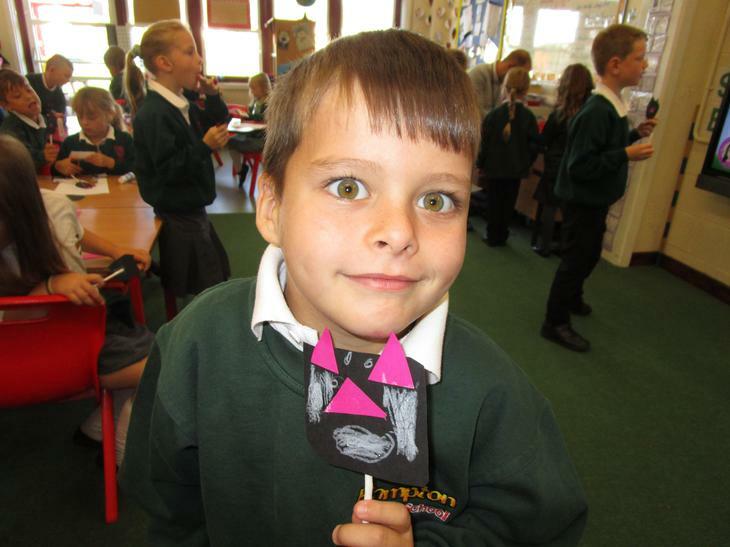 We made Splat the Cat puppets and retold the story of Splat the Cat in a fun, creative way! 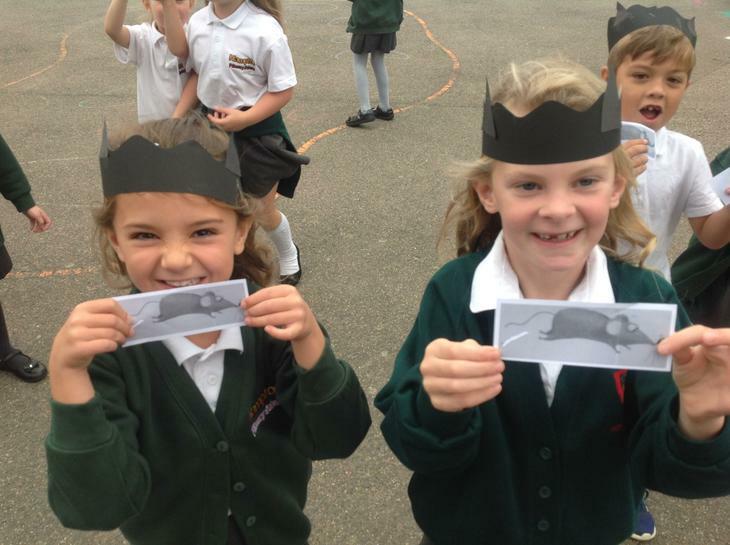 Splat the Cat Mouse Hunt! 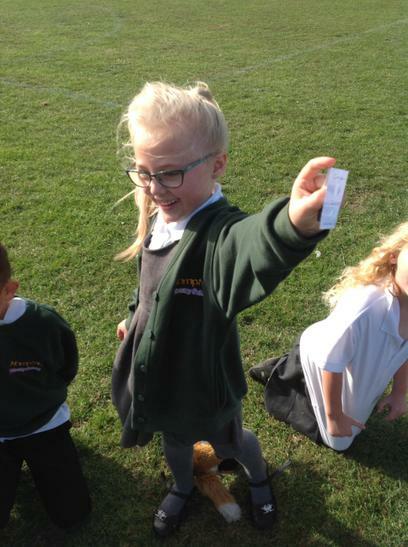 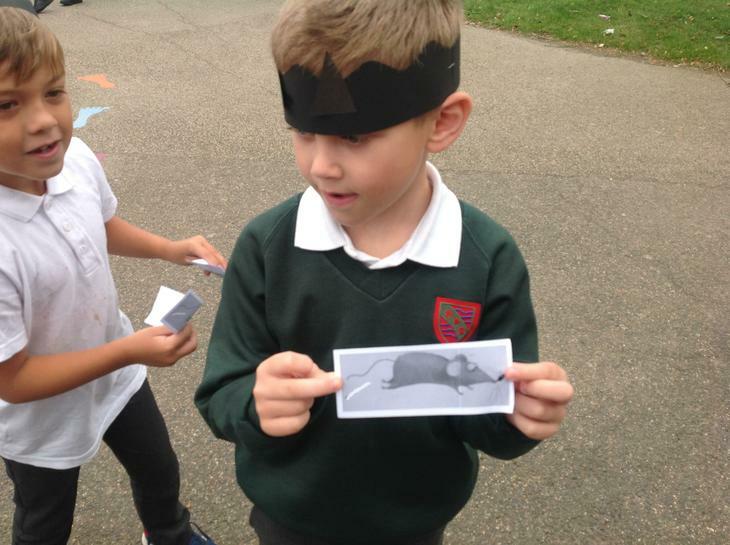 As part of our experience lesson in our Splat the Cat unit of work, we listened to Mr W read the story and we went outside and went on a mouse hunt! 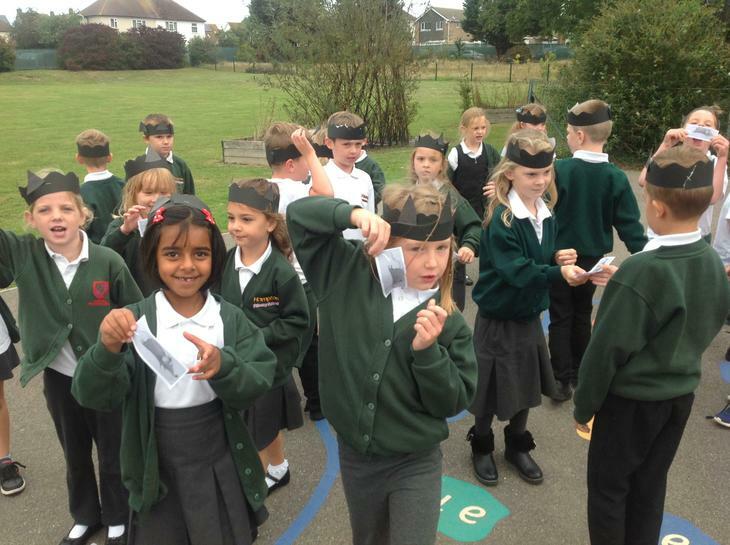 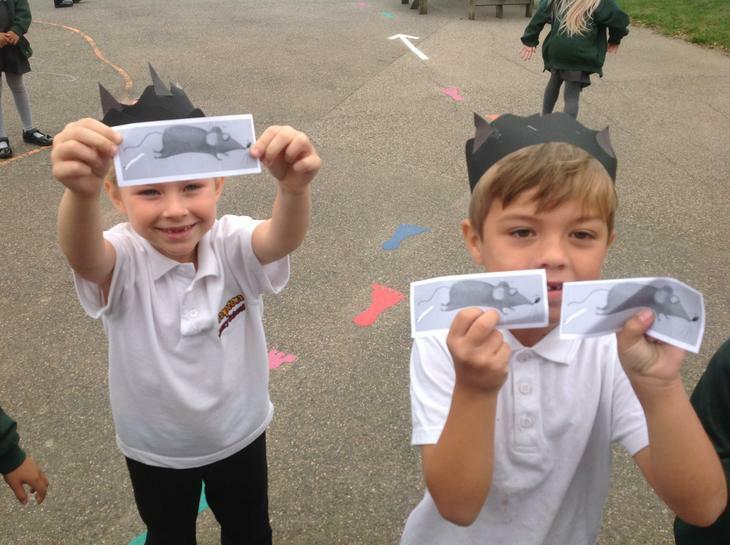 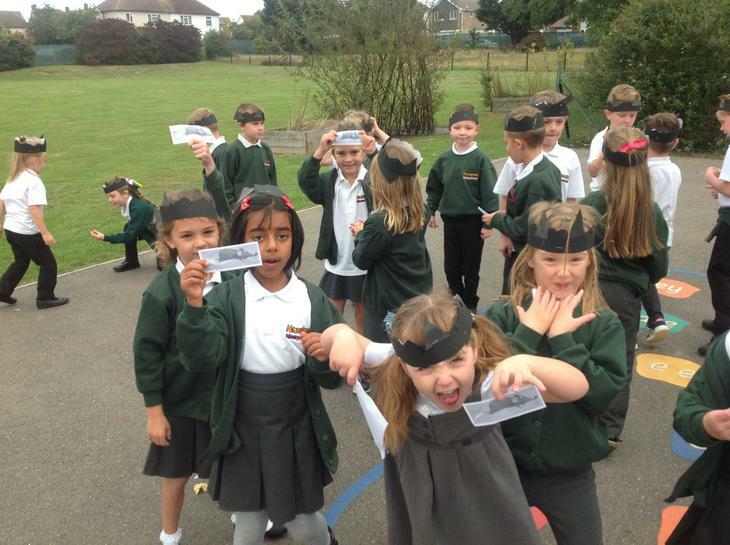 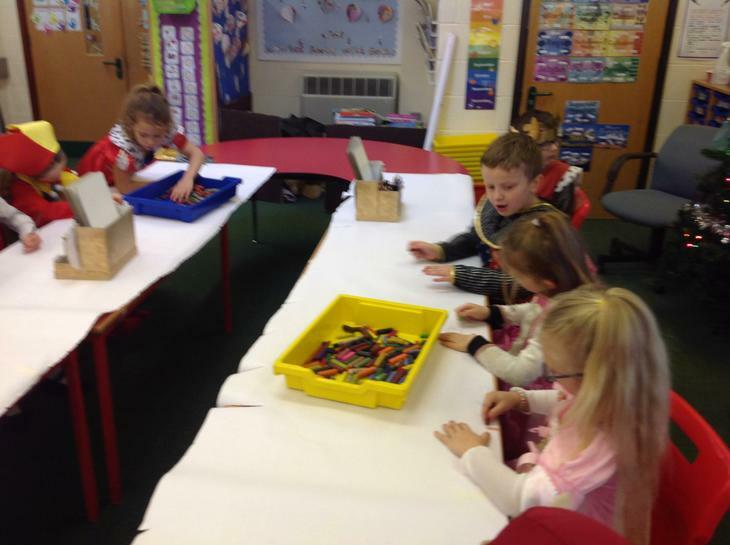 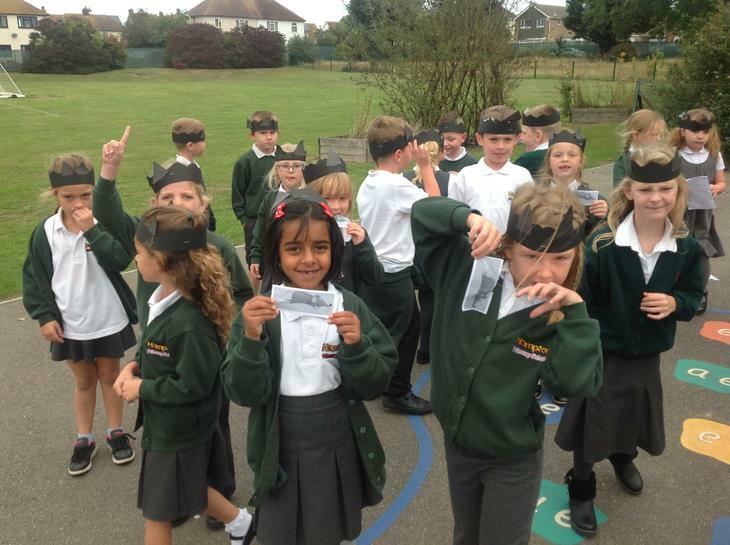 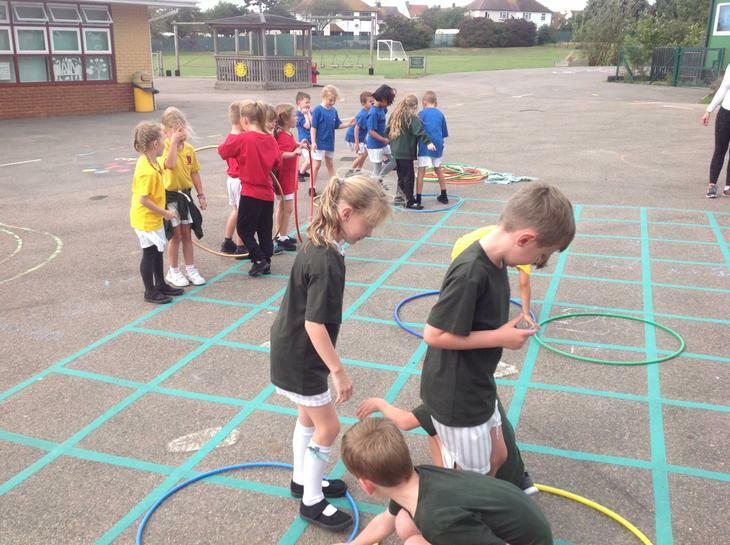 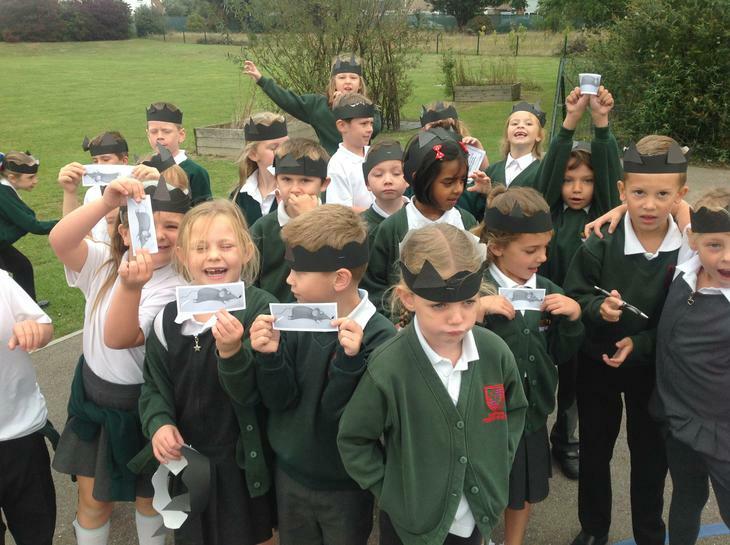 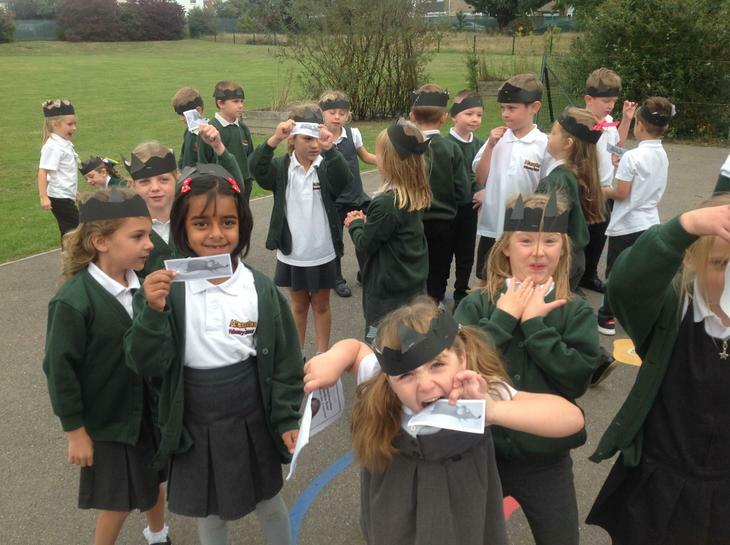 First we made Splat ears and then we went outside and looked for little mice hidden in the playground! 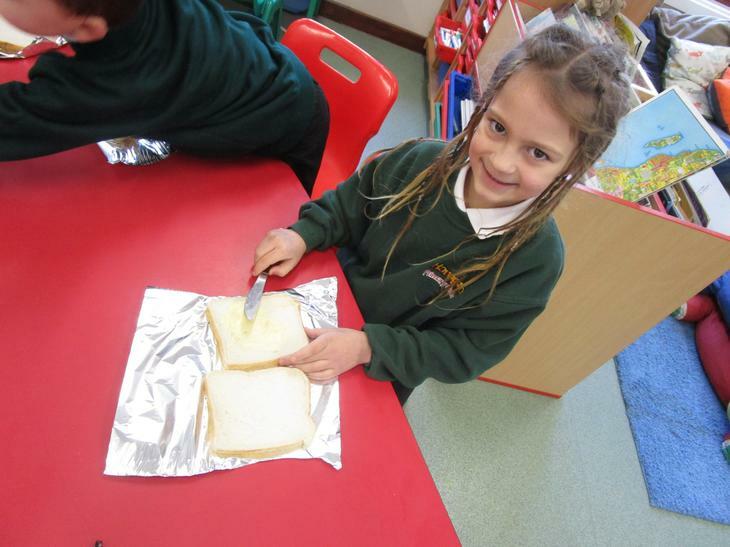 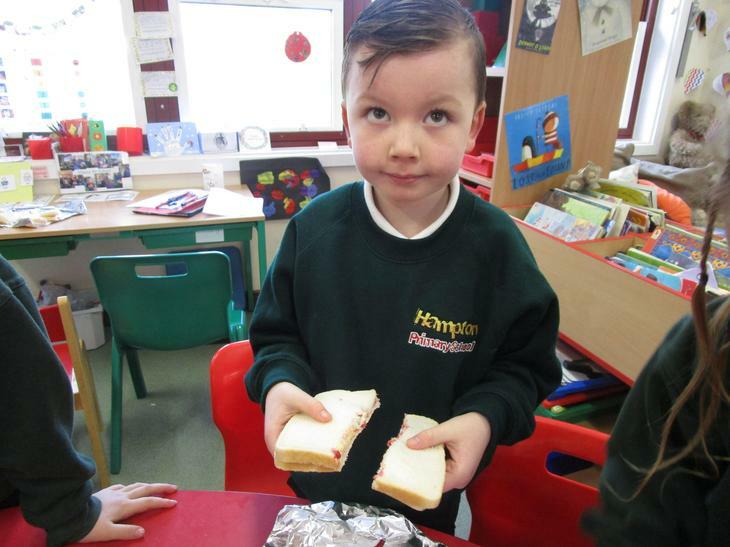 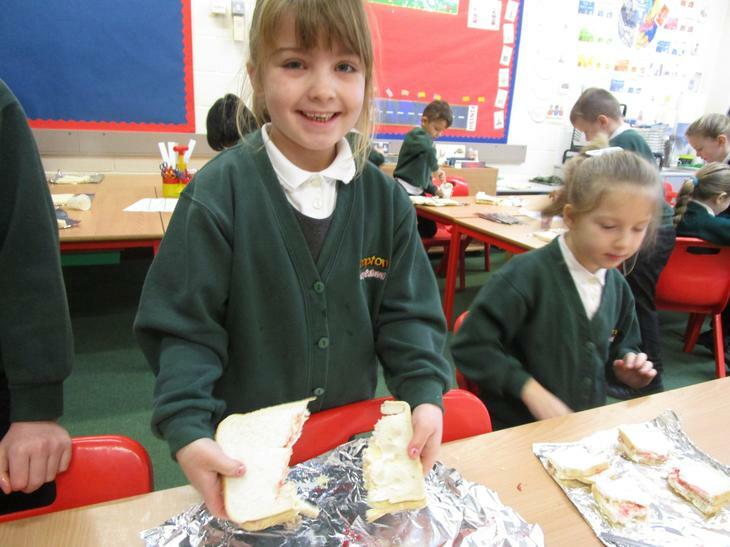 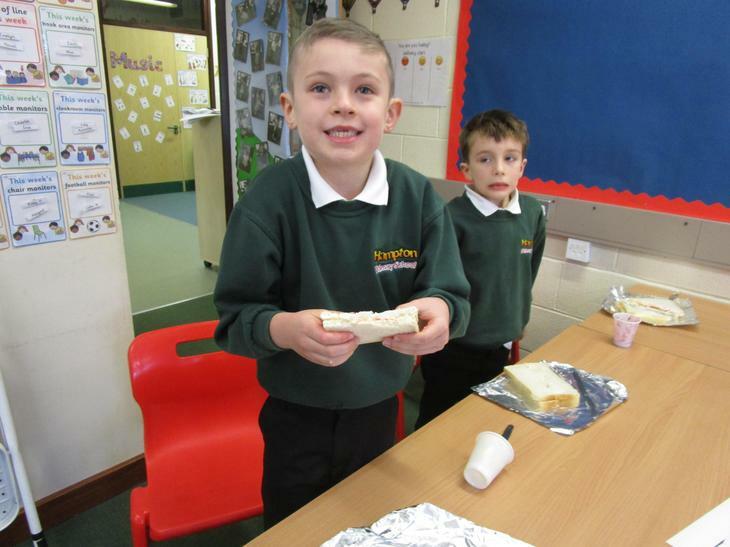 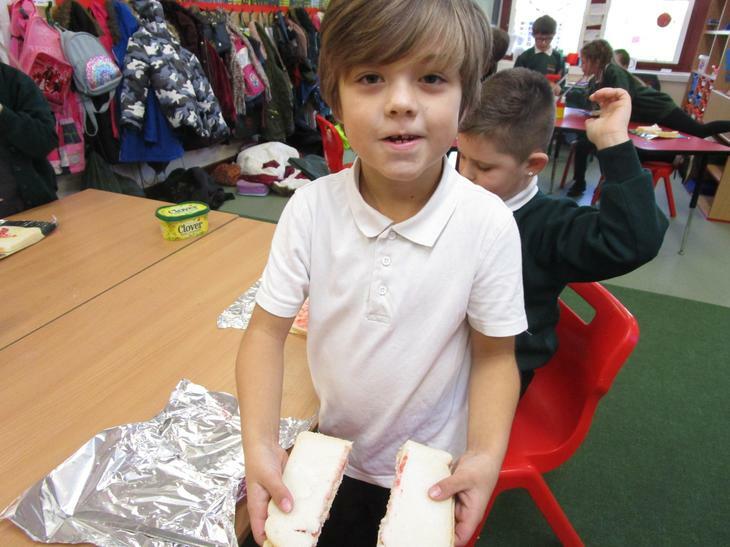 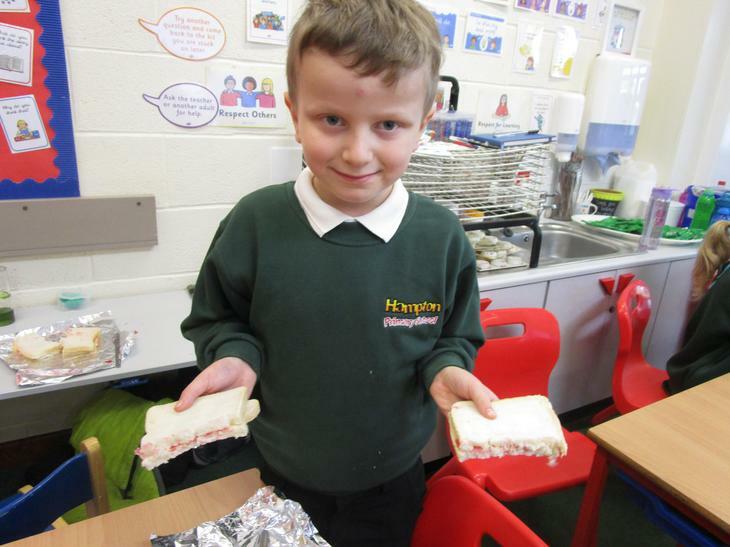 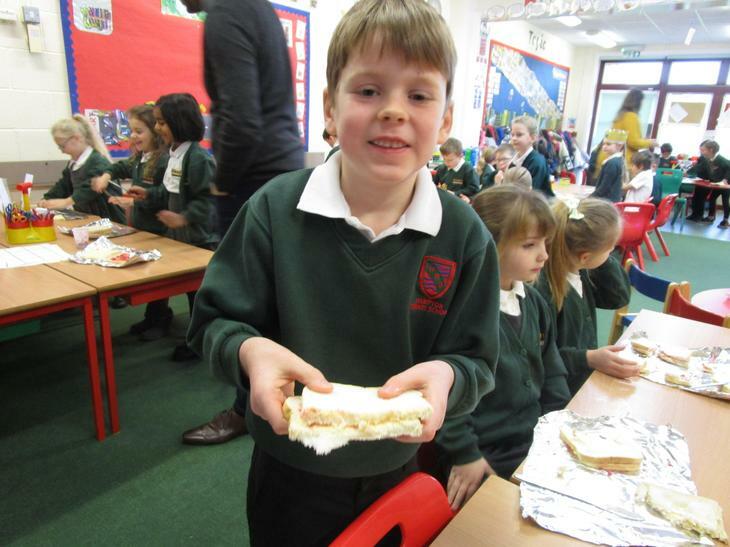 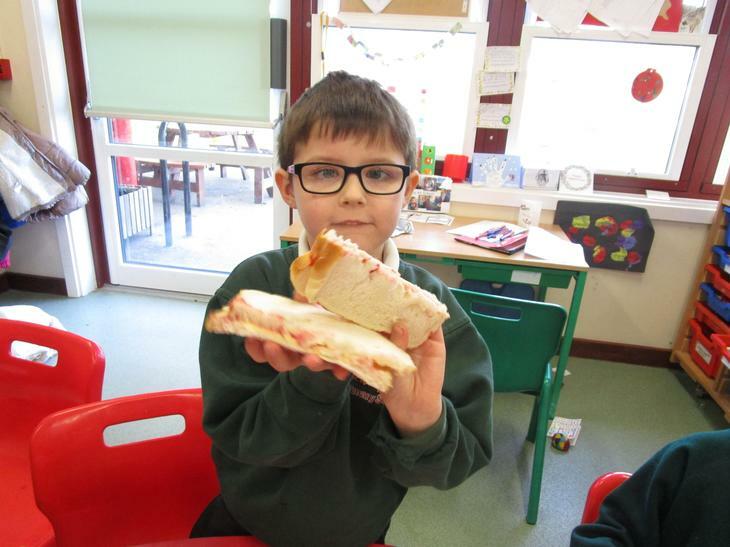 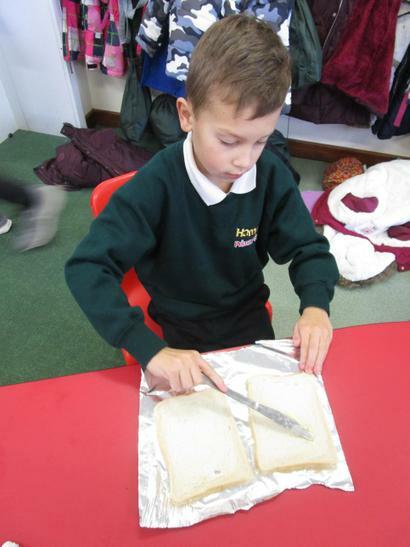 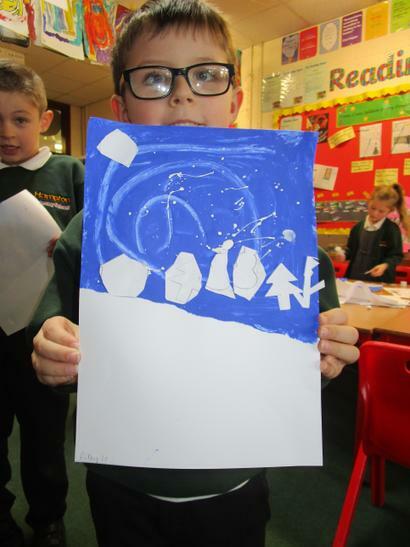 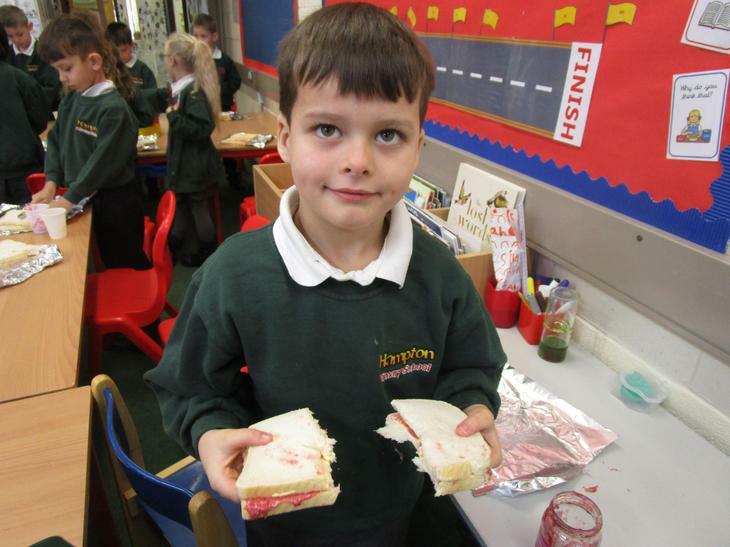 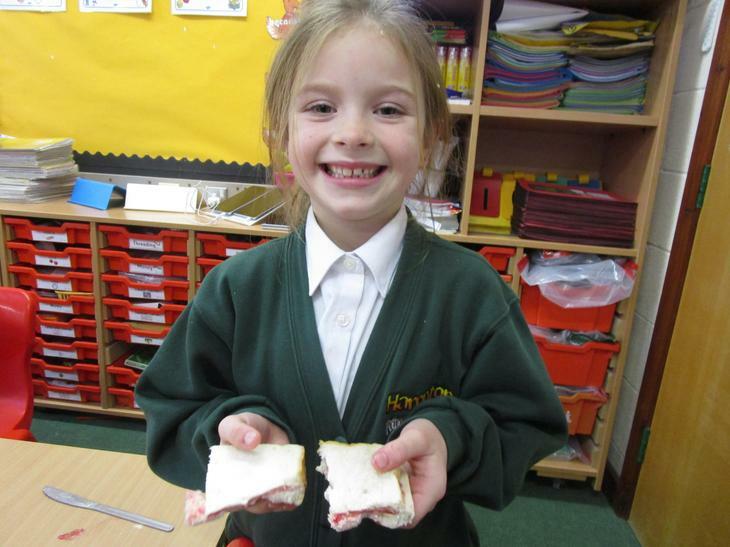 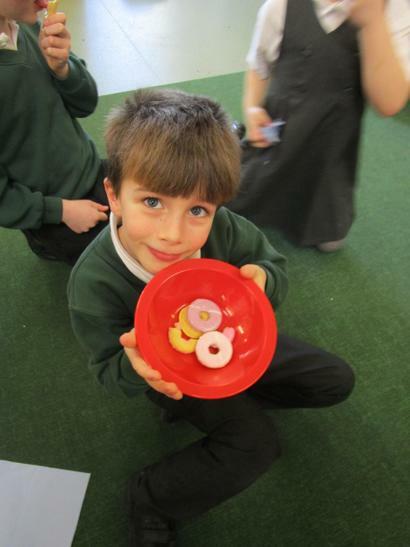 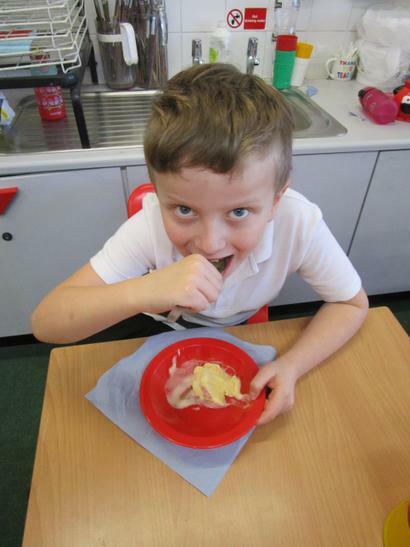 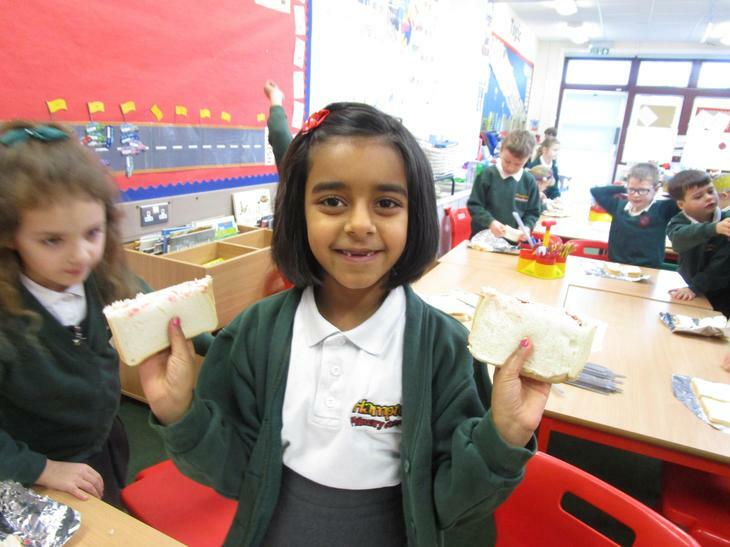 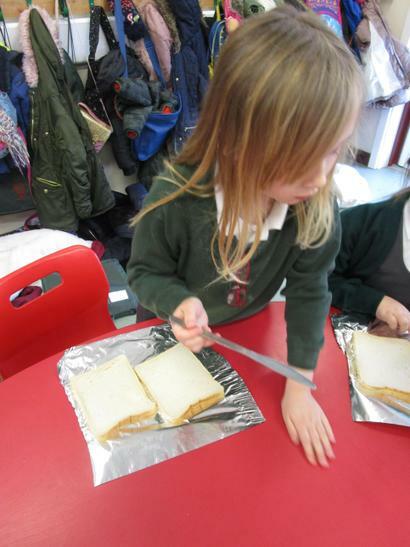 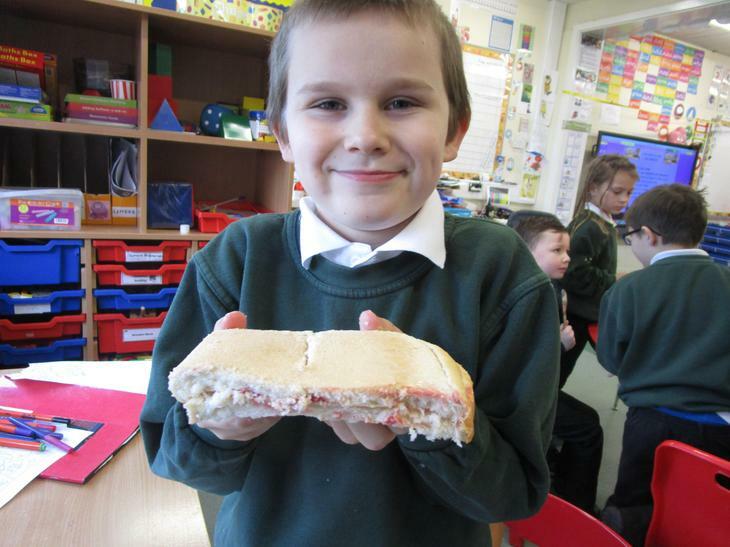 In Science, we thought about the different stages of human growth and ordered these as part of a group. 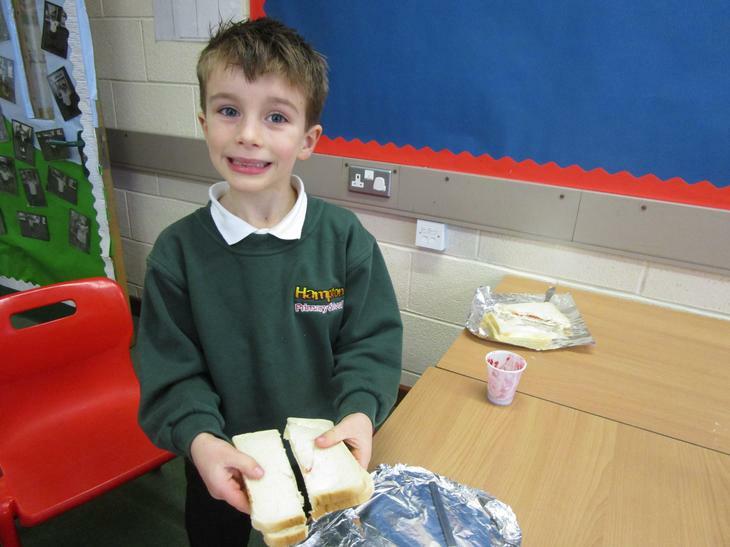 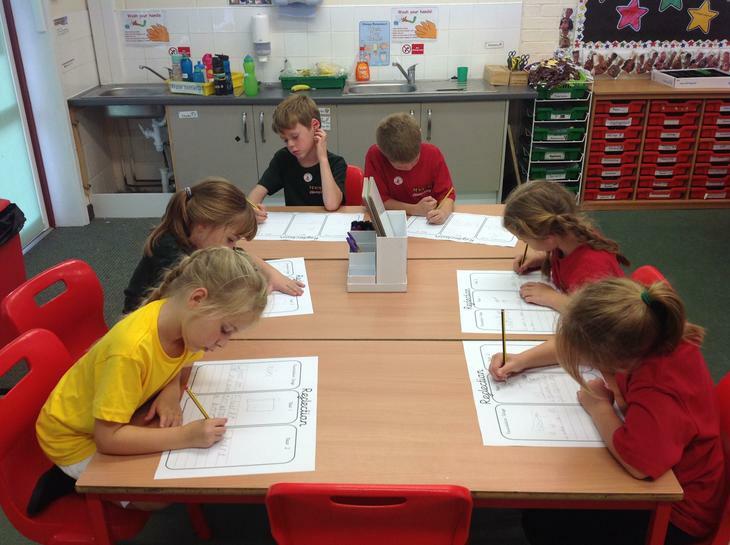 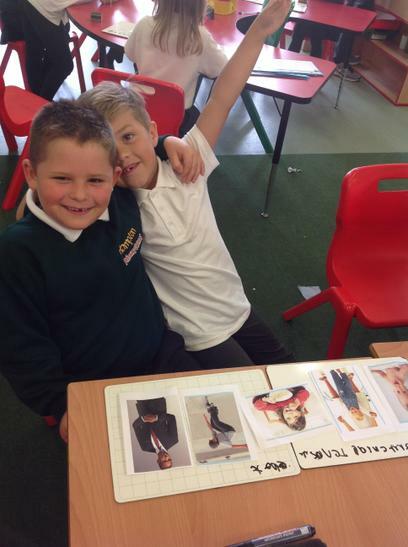 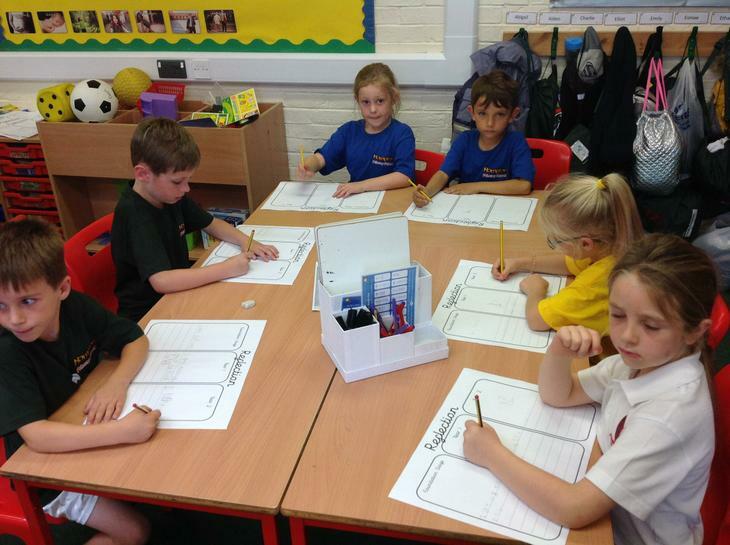 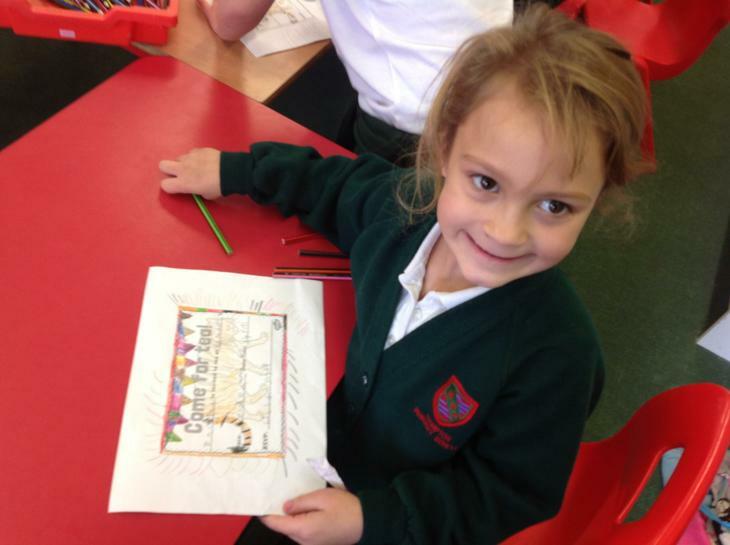 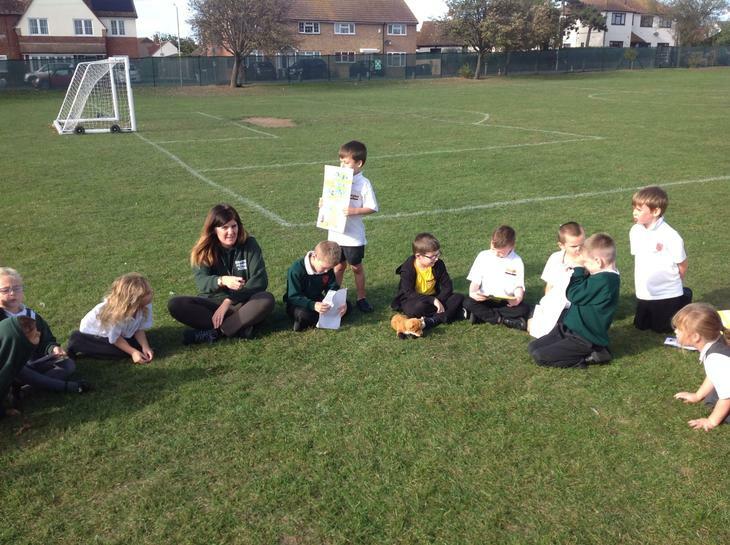 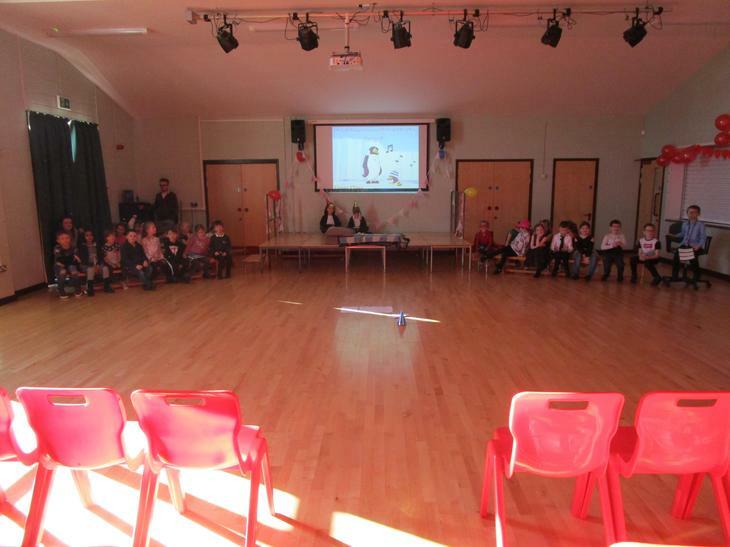 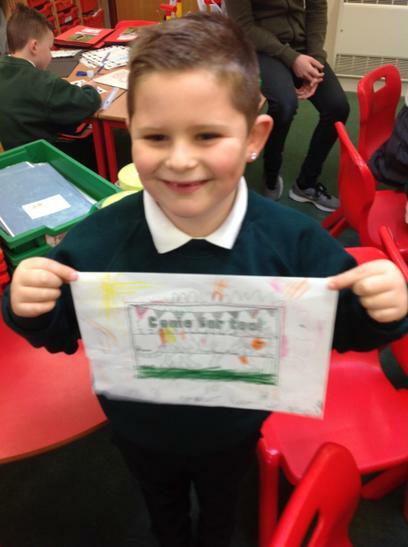 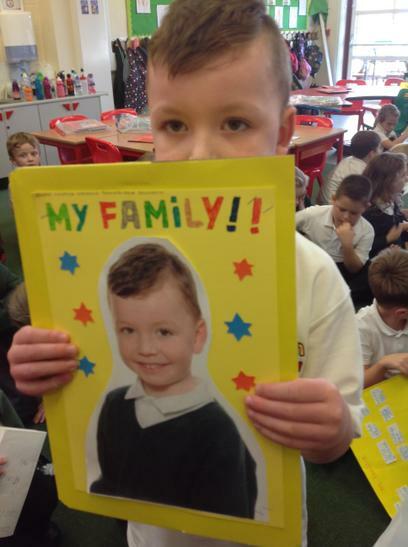 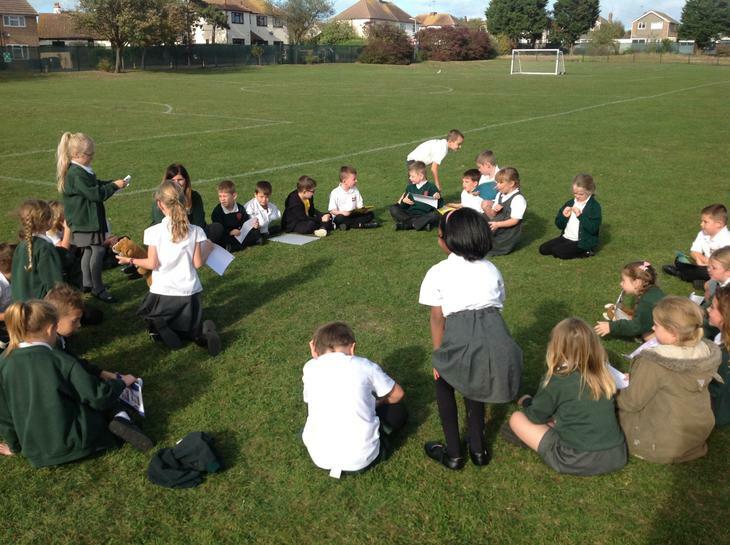 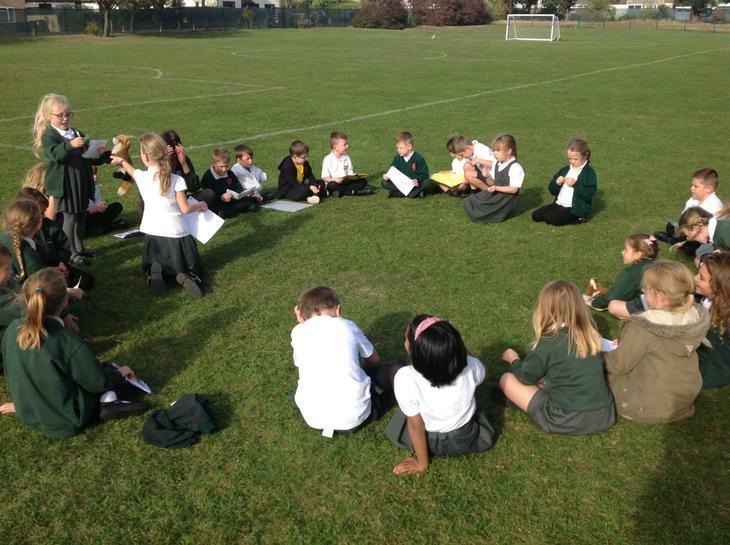 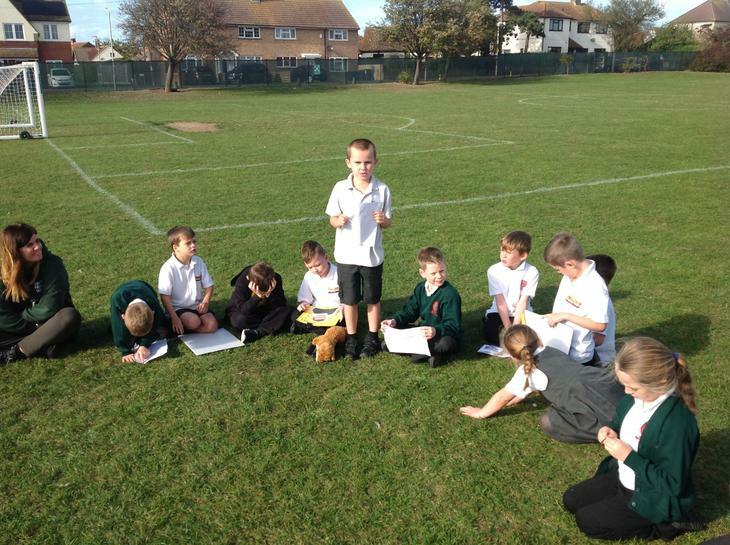 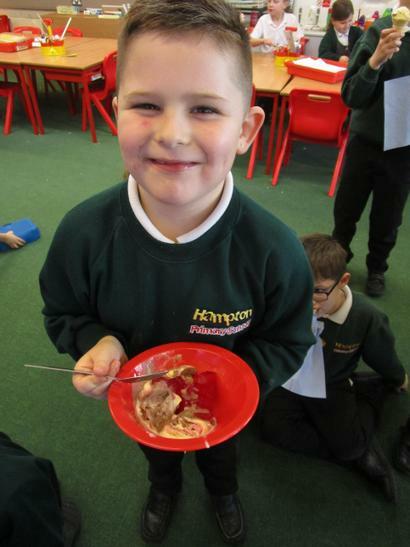 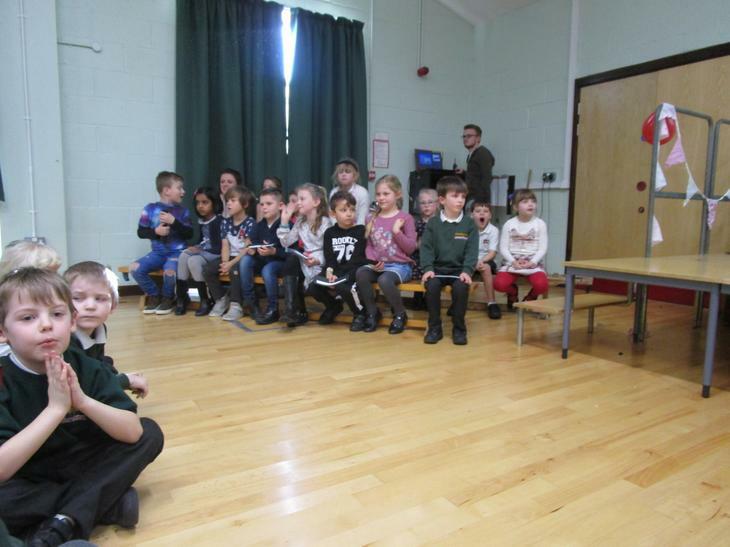 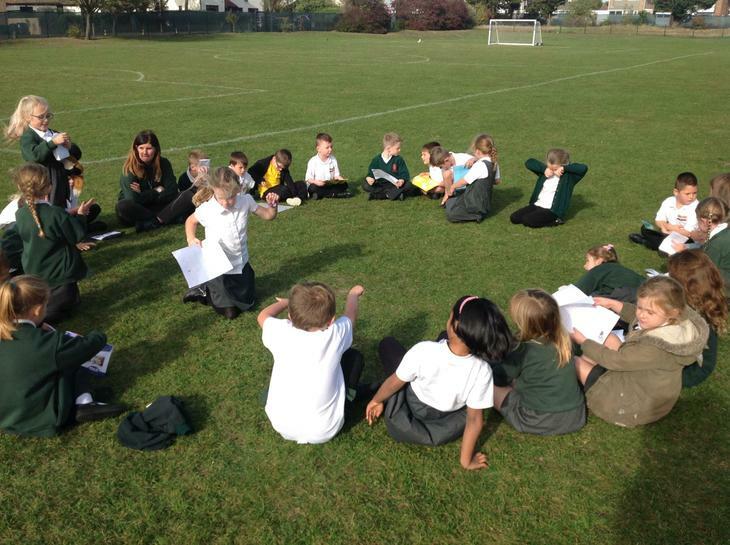 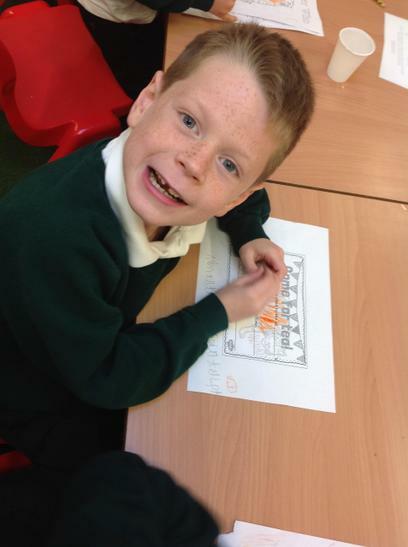 On Hampton Values afternoon we discussed the different values we hold important to us at our school. 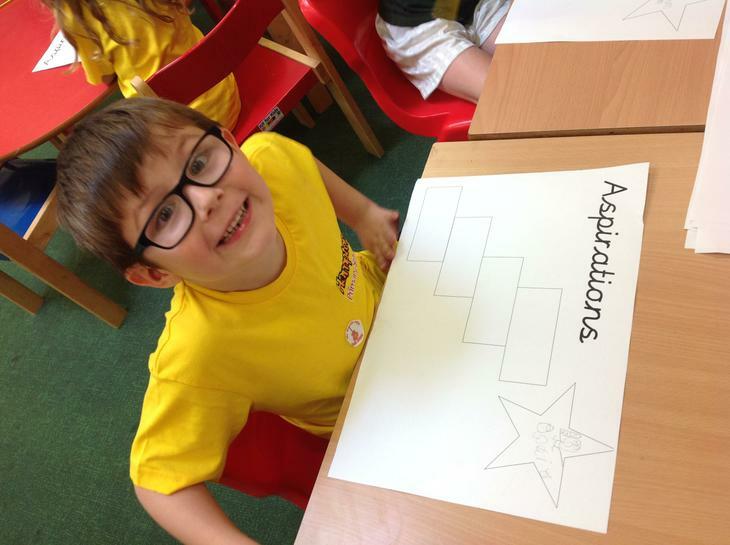 We focused on Aspiration and Collaboration taking part in team building exercises and thinking about our goals for the future!